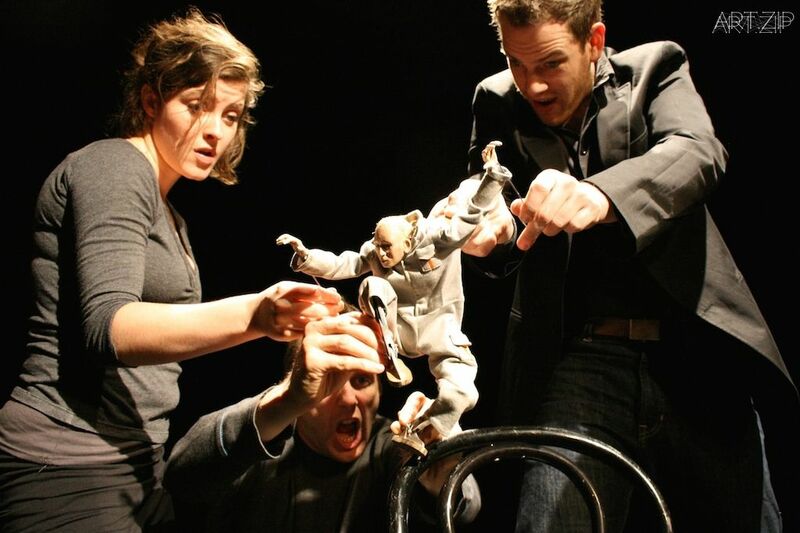 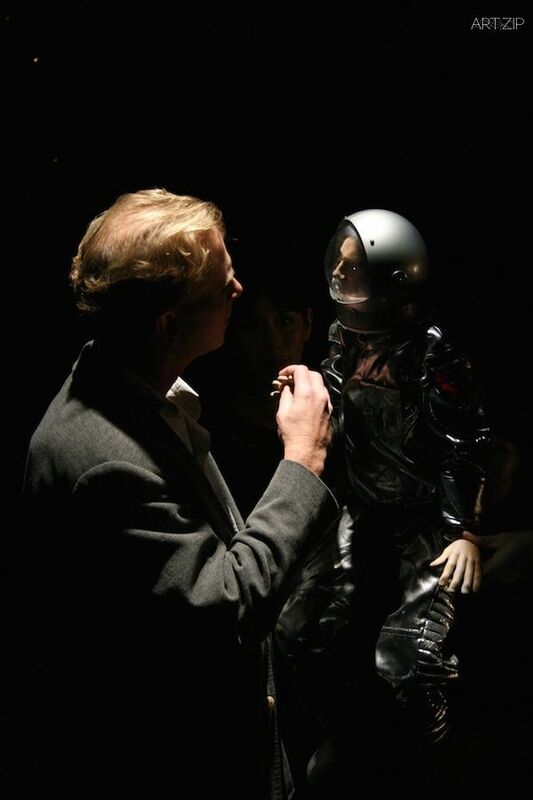 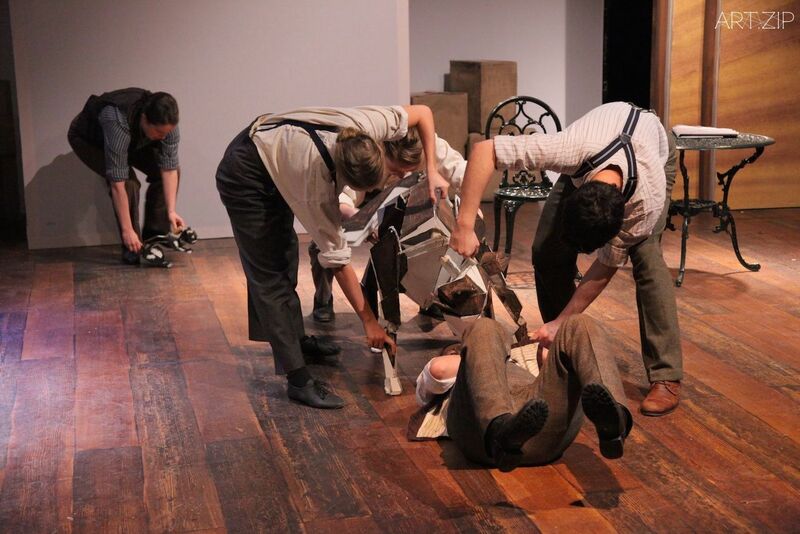 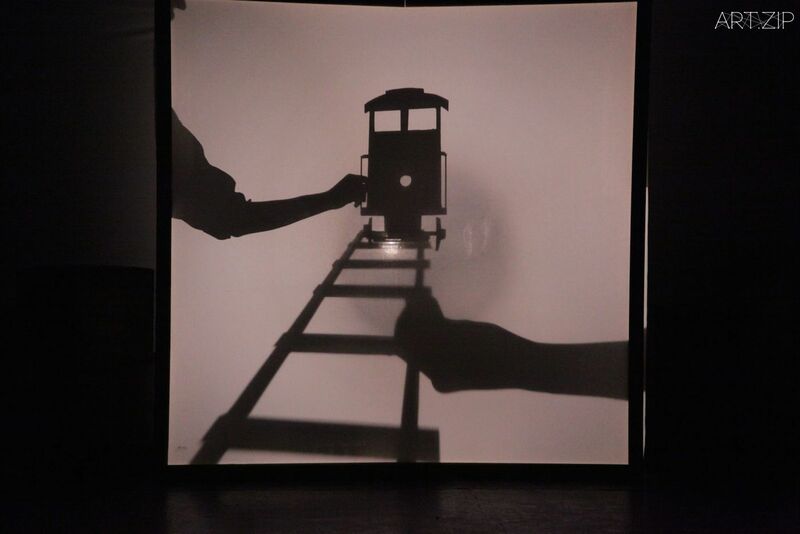 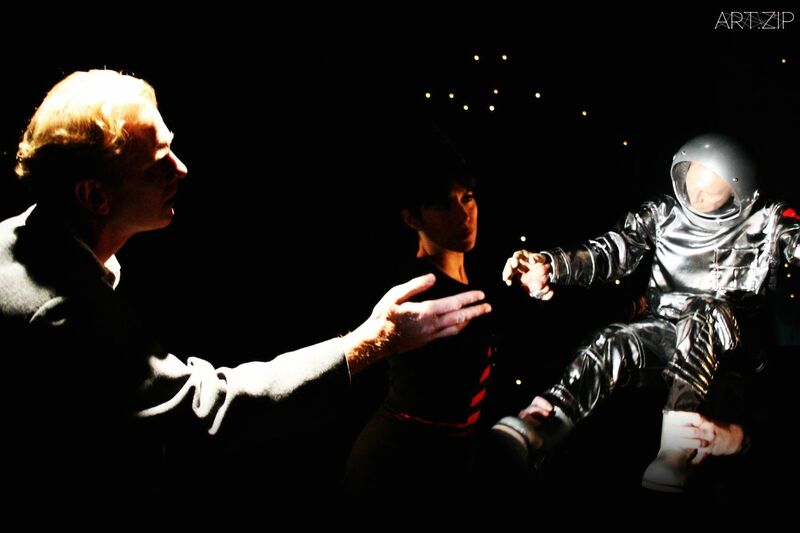 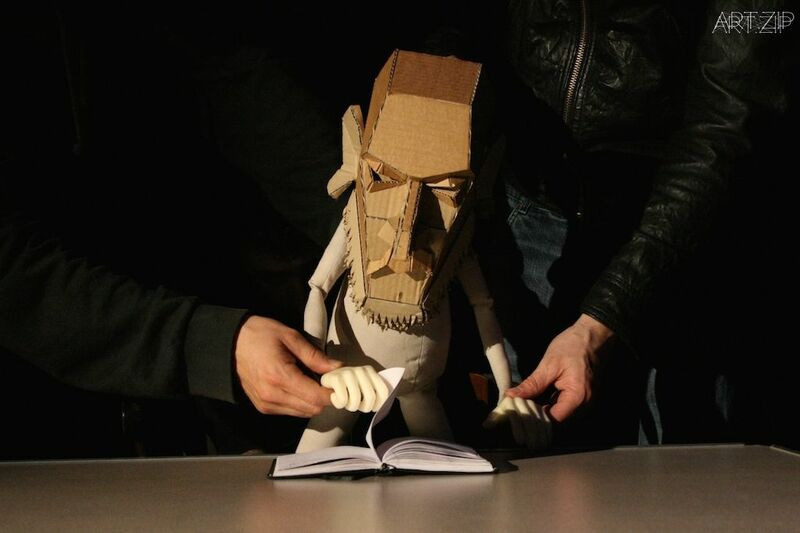 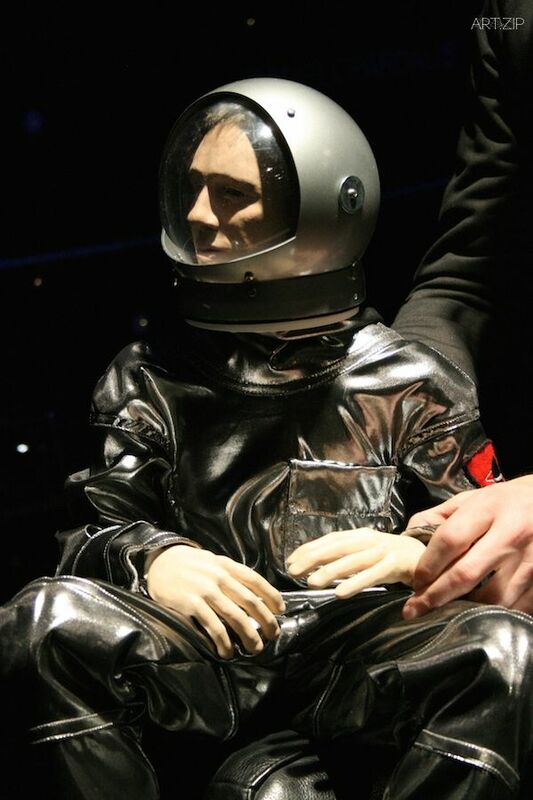 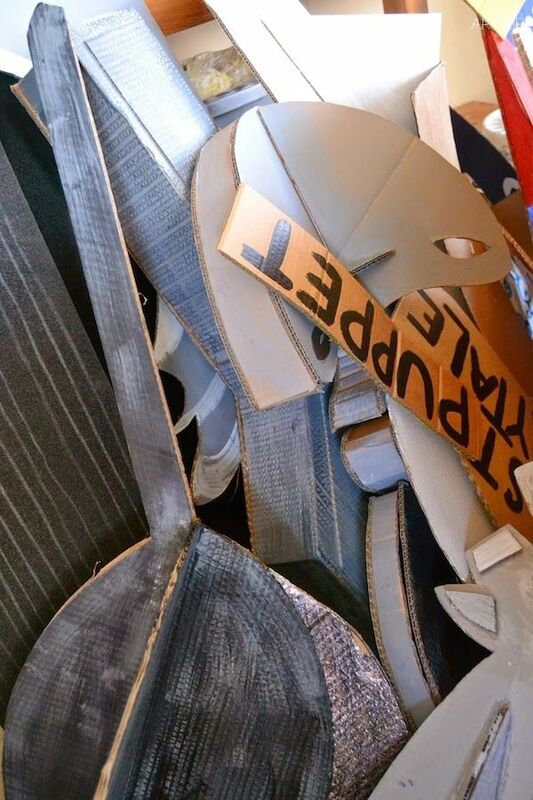 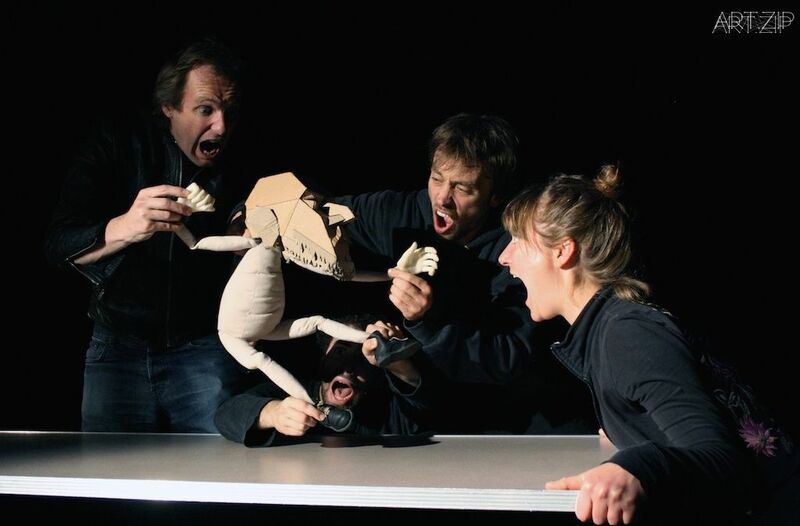 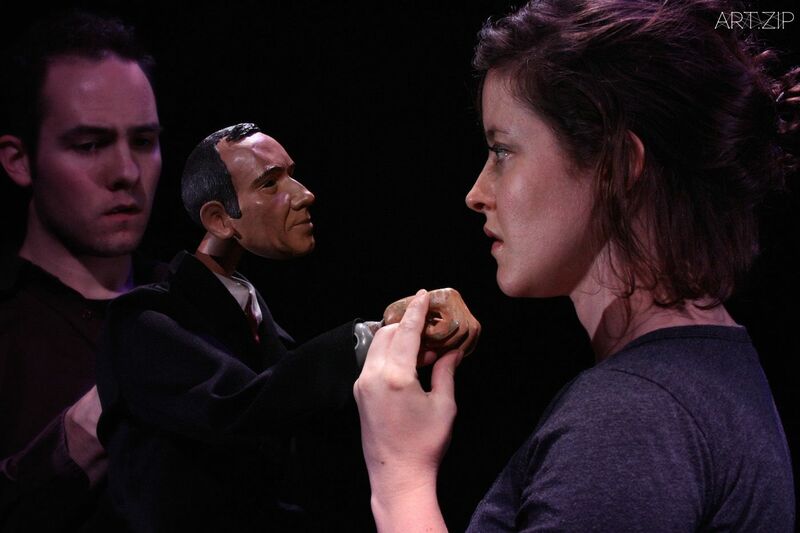 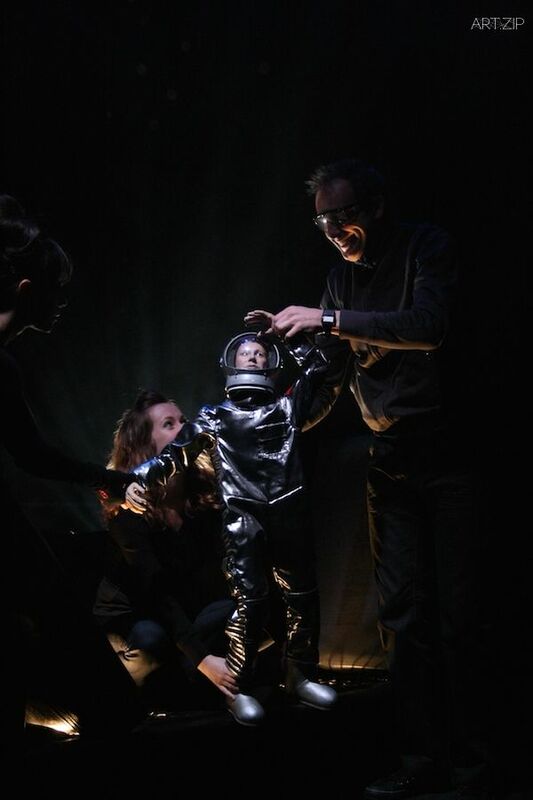 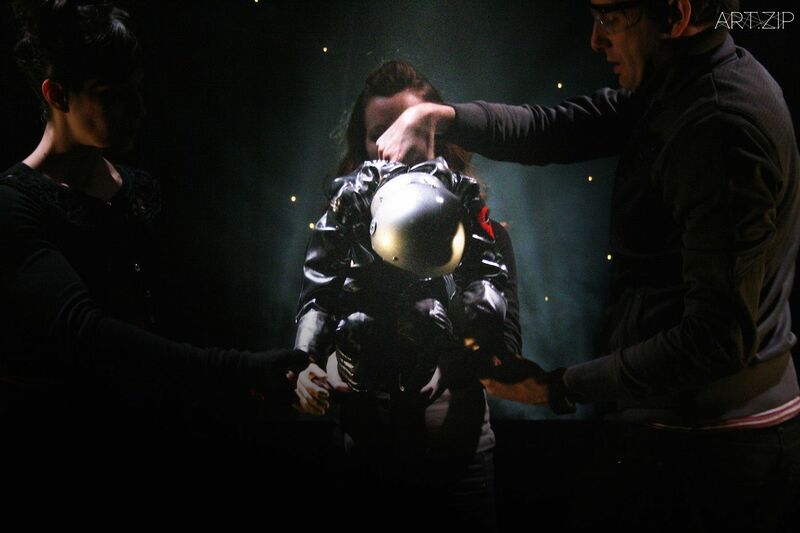 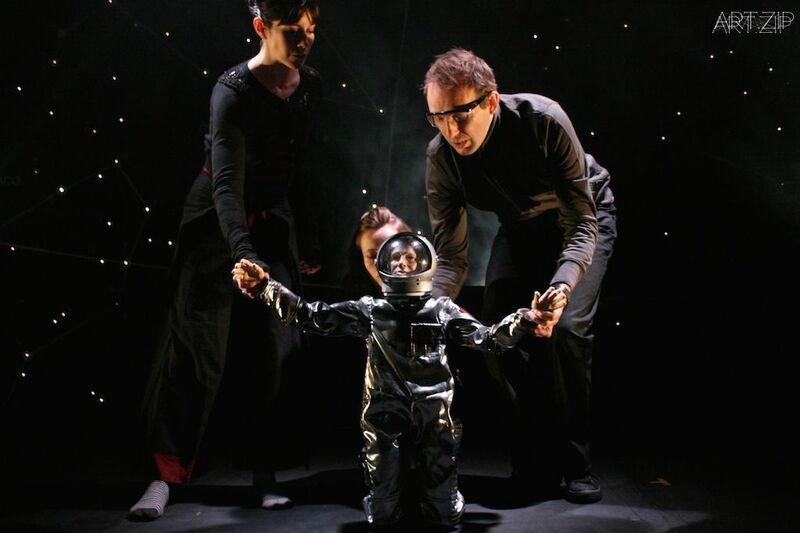 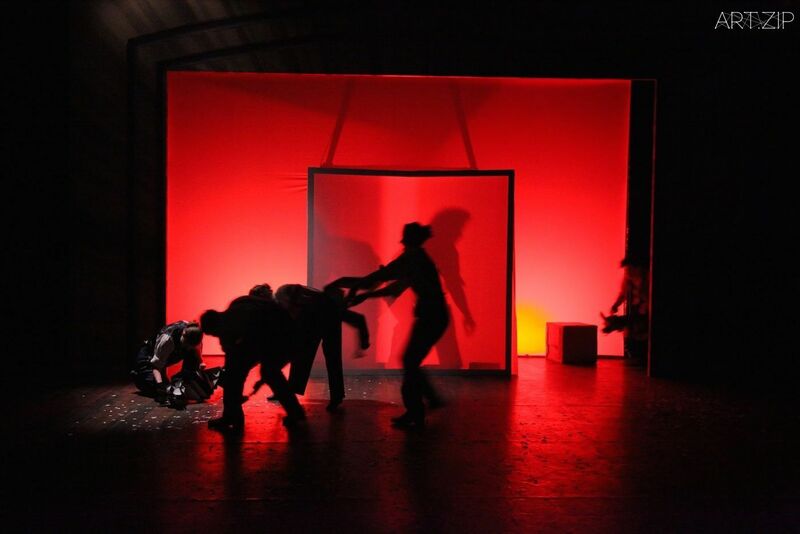 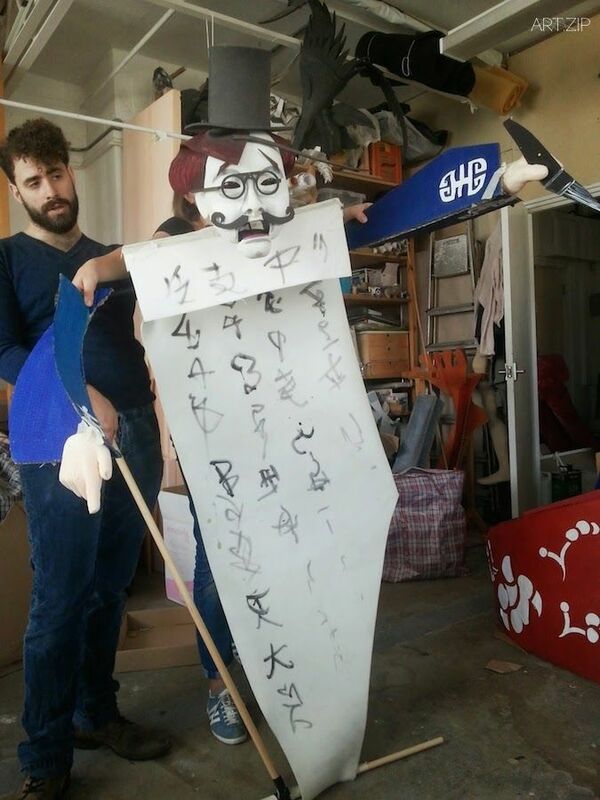 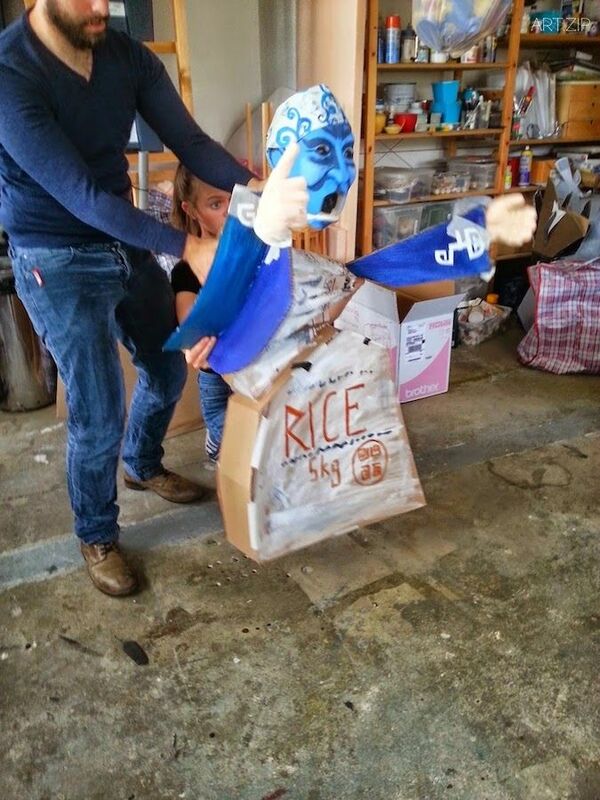 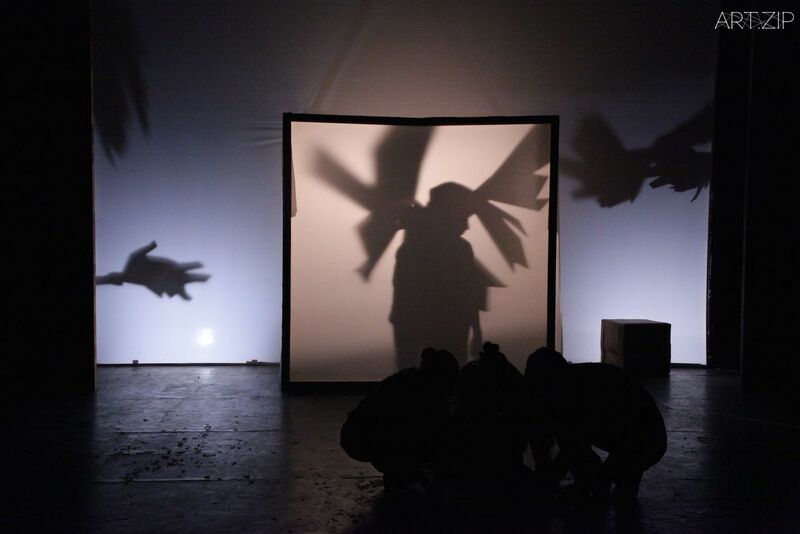 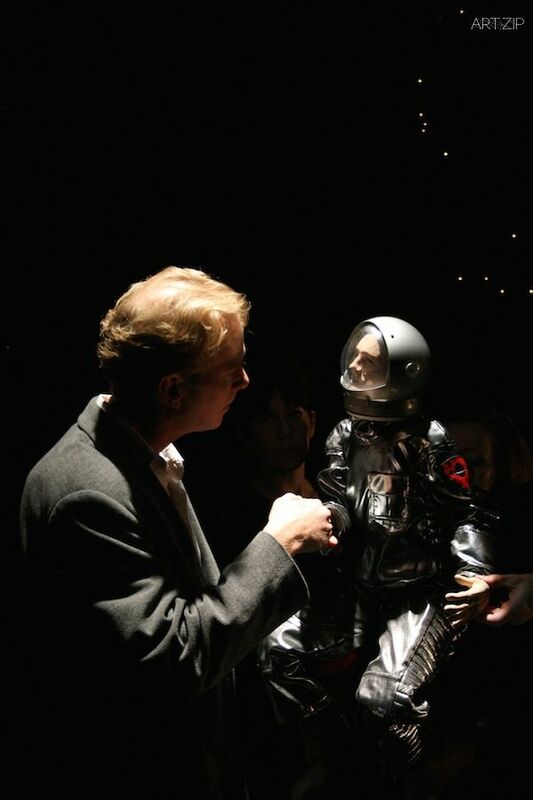 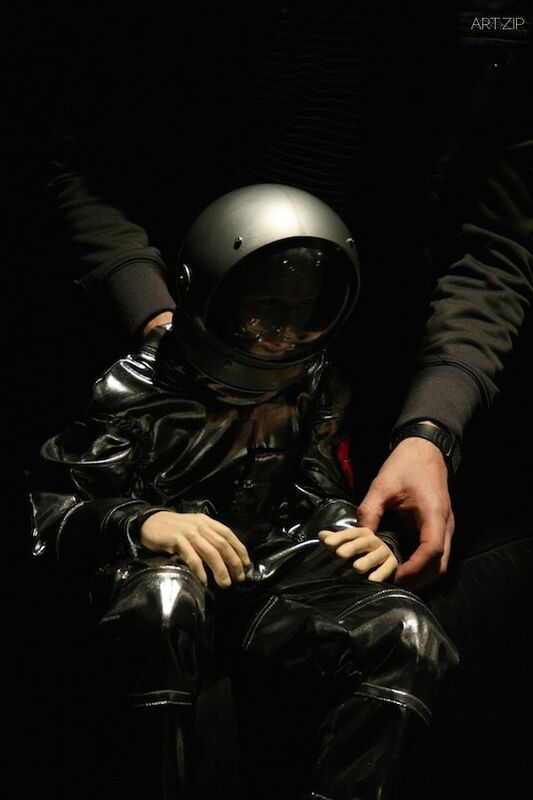 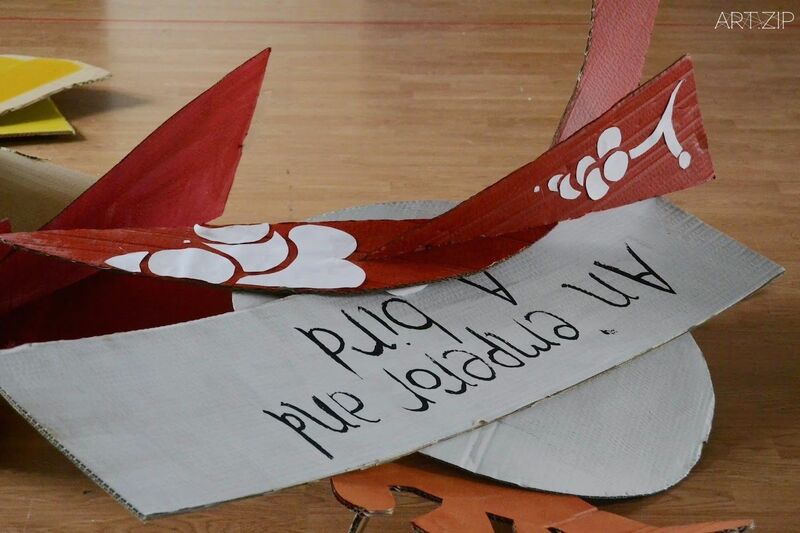 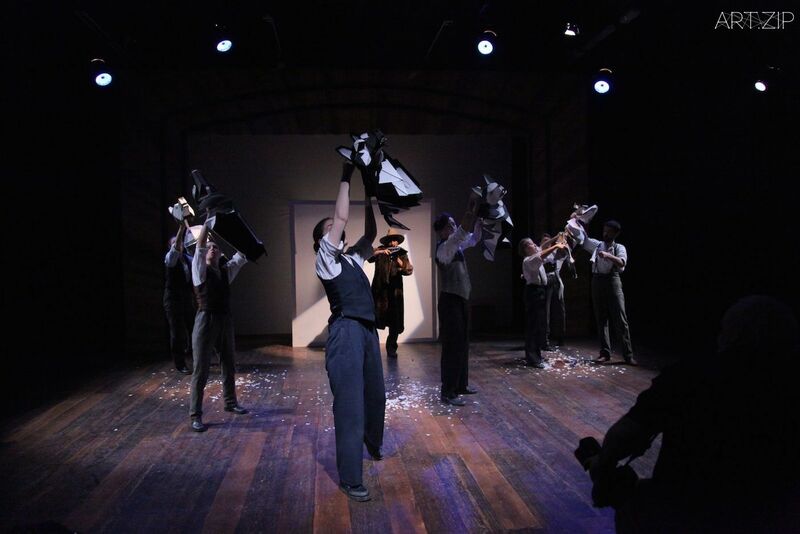 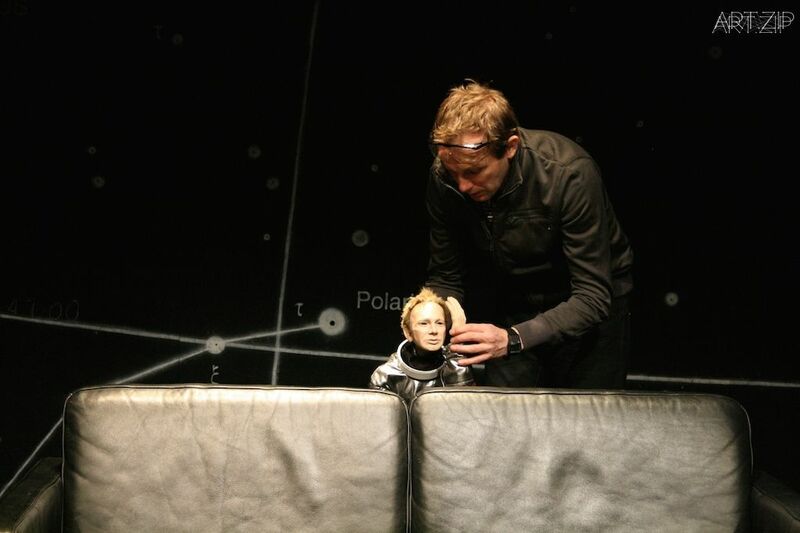 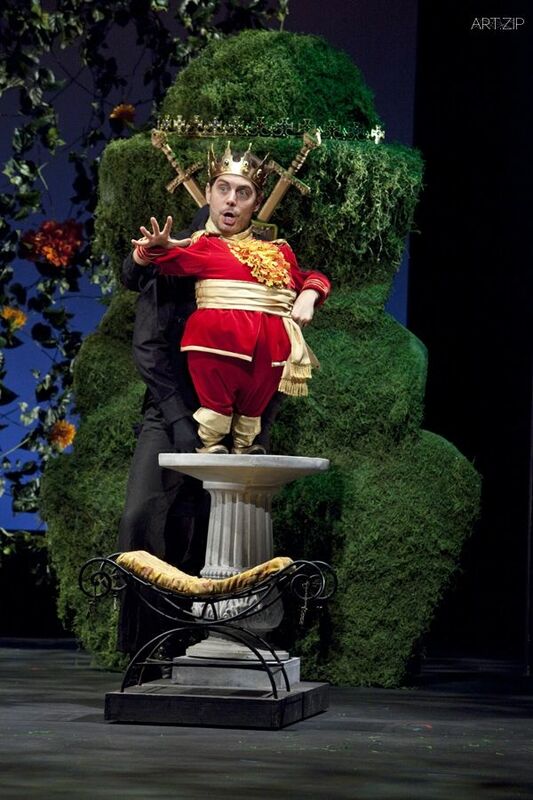 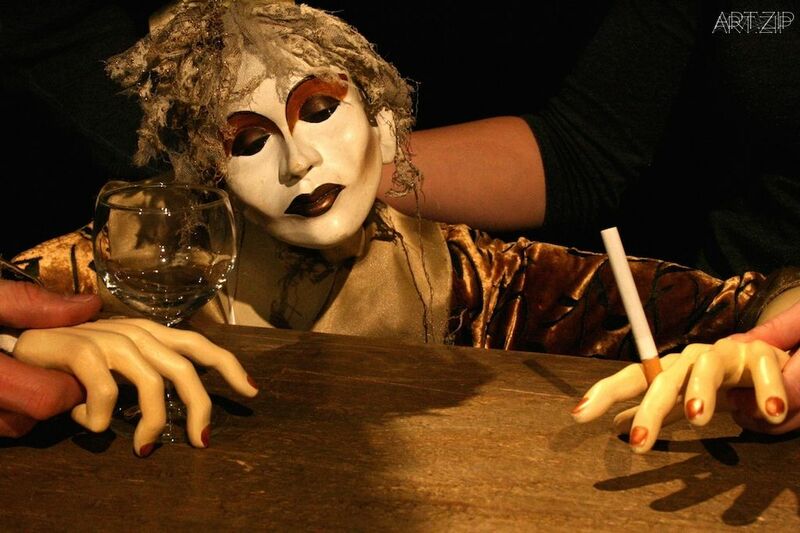 Blind Summit’s mission is to reinvent the idea of puppetry and bring contemporary puppeteering to a new audience. 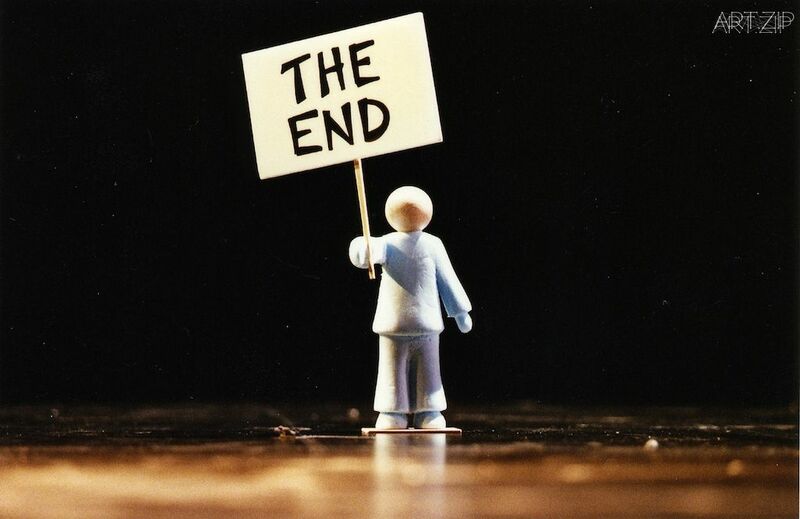 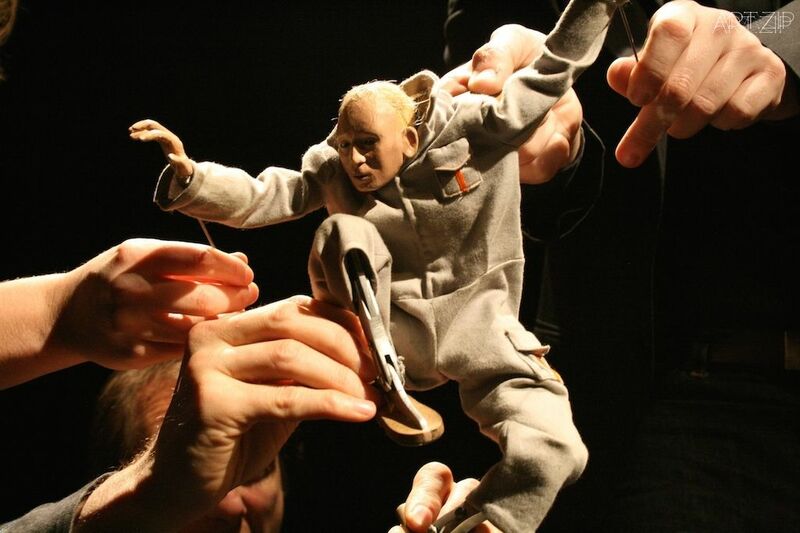 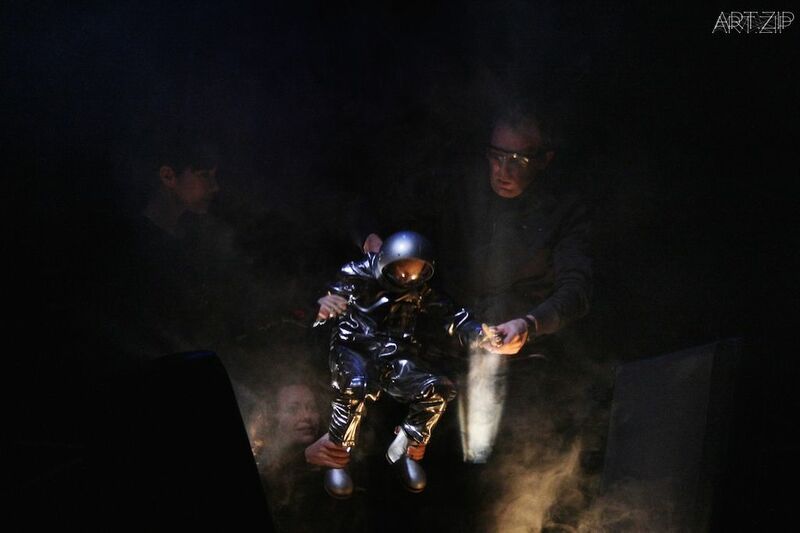 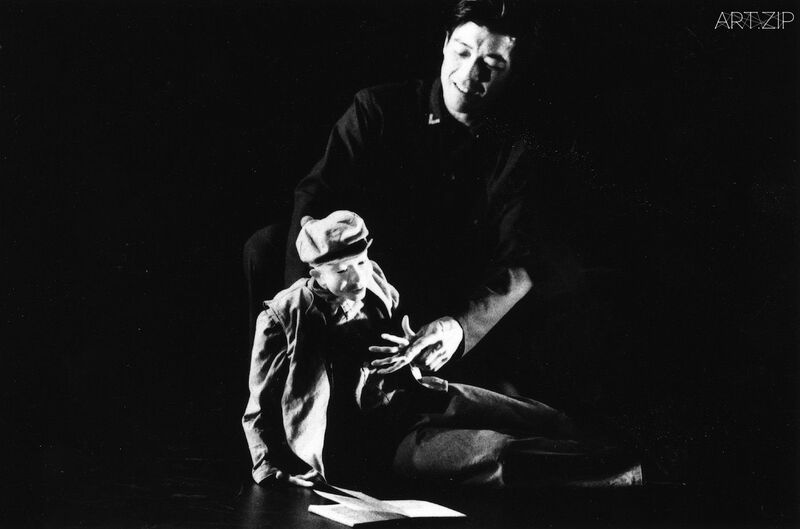 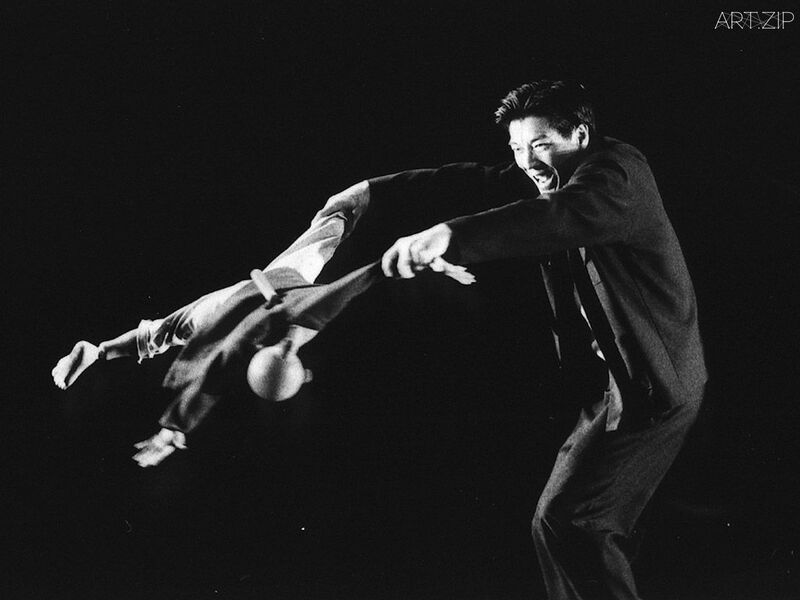 In their own words, they say that they ‘see puppetry as a radical part of the reinvention of theatre in our time.’ Mark Down acts as Blind Summit’s Artistic Director, and has held the post since founding the company in 1997 with Nick Barnes. 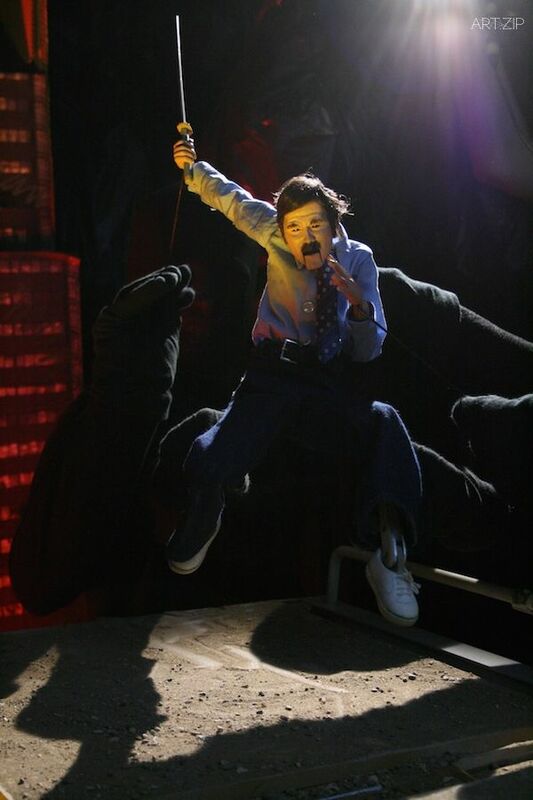 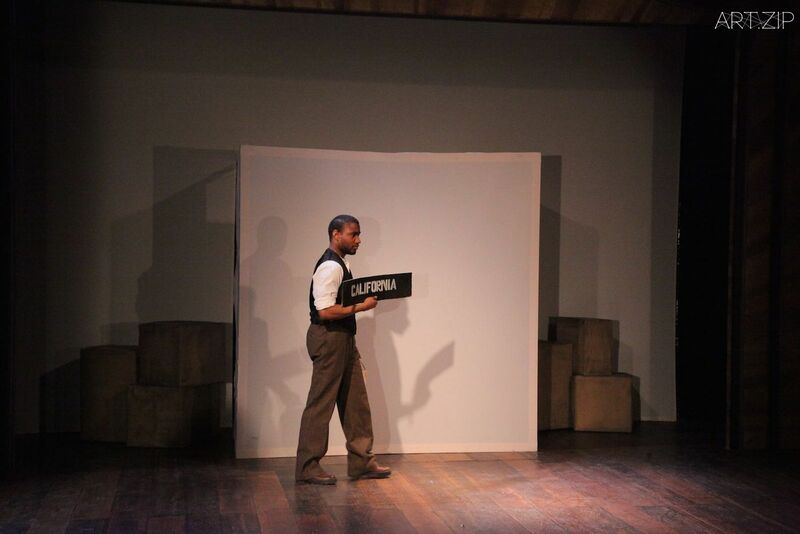 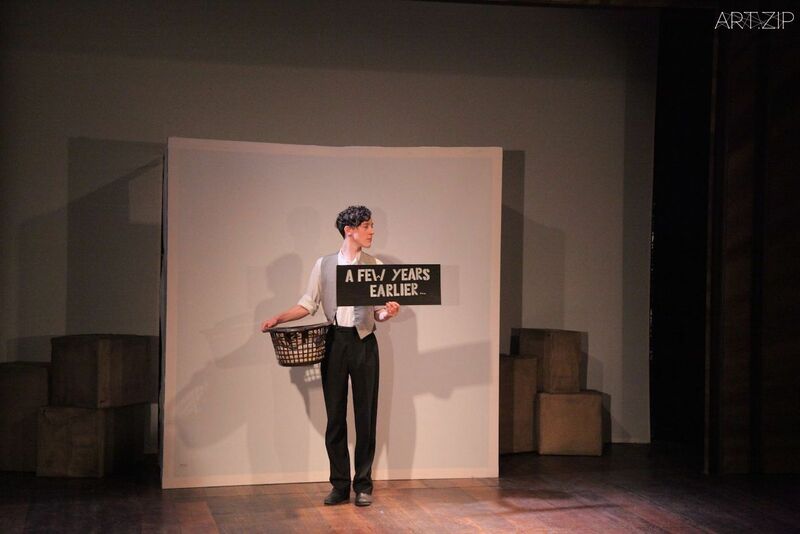 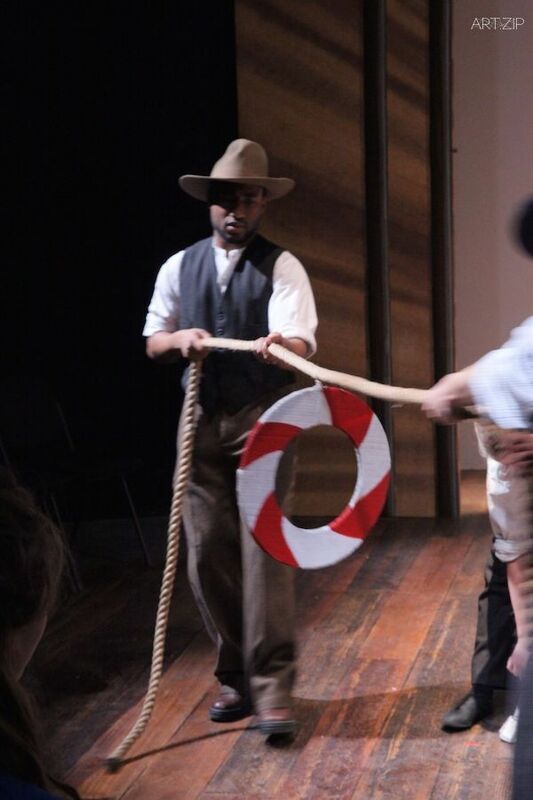 He plays an active, engaging role within the company; directing, designing, writing and performing, drawing upon his dramatic training at the Central School of Speech and Drama. 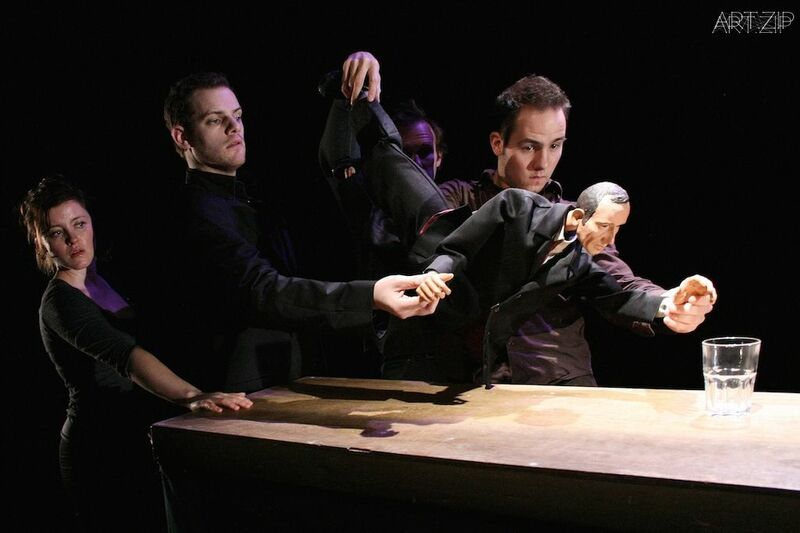 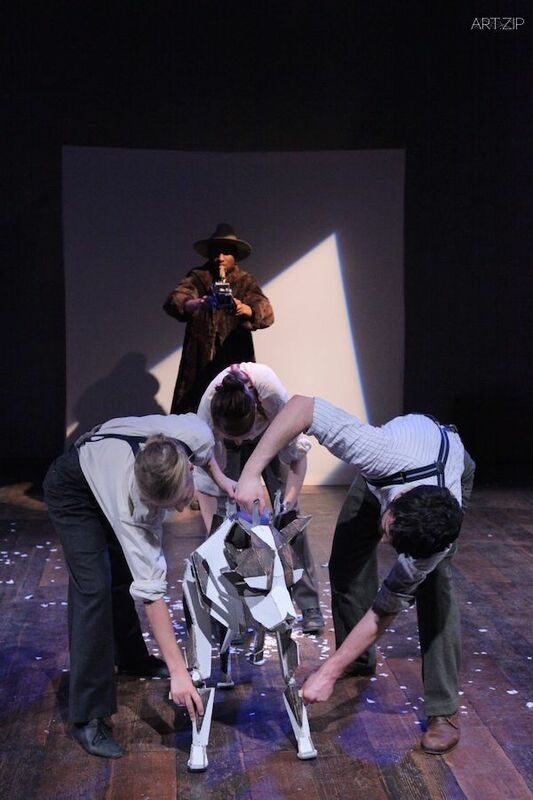 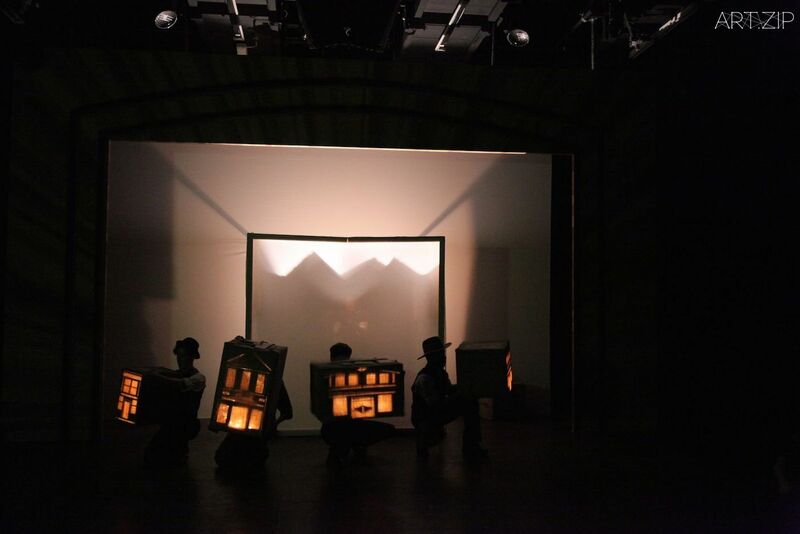 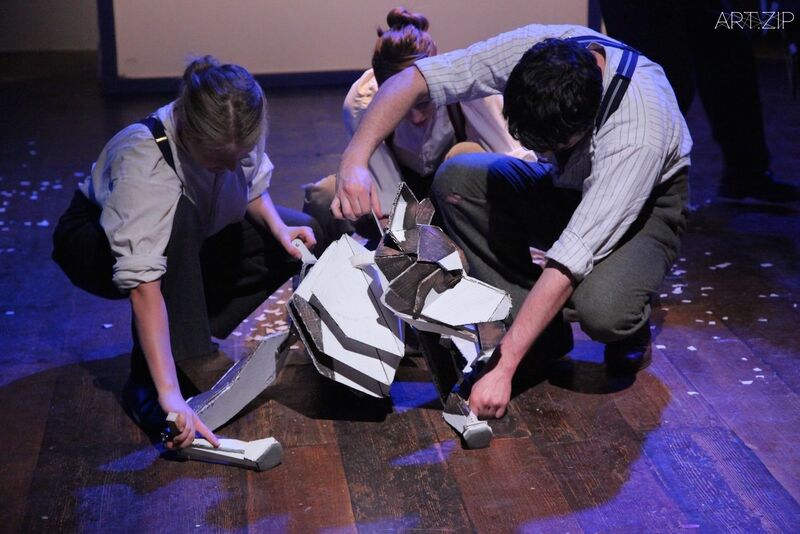 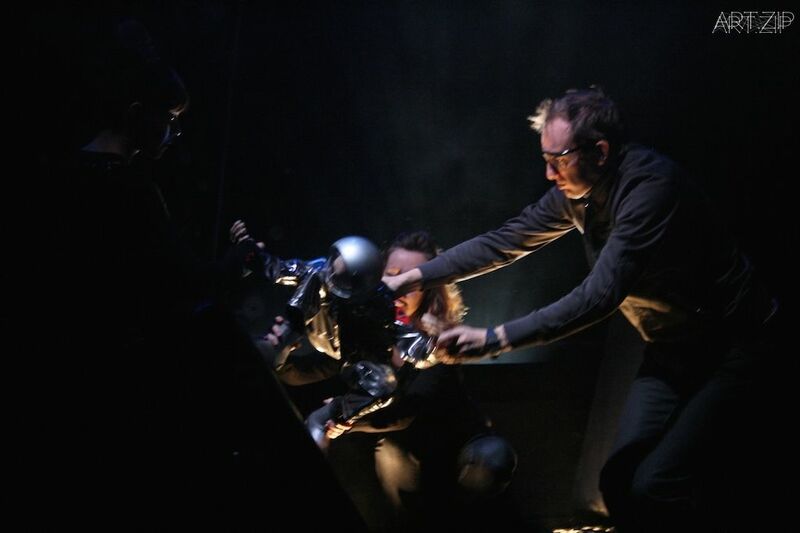 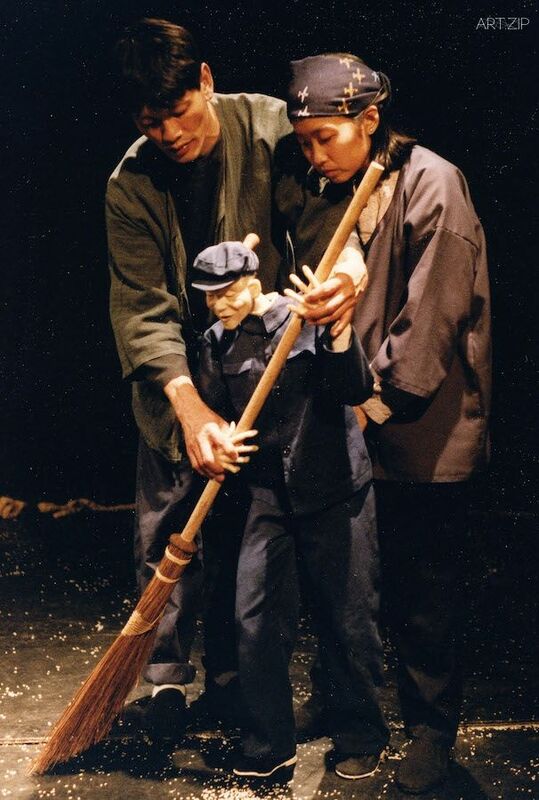 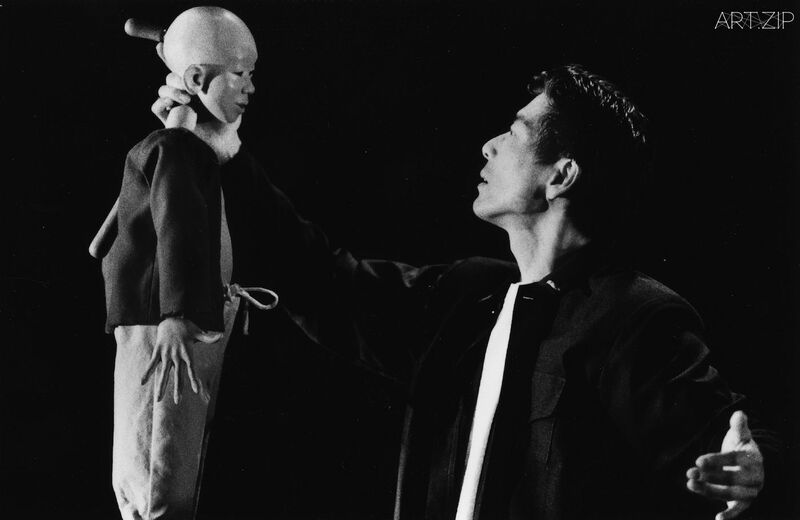 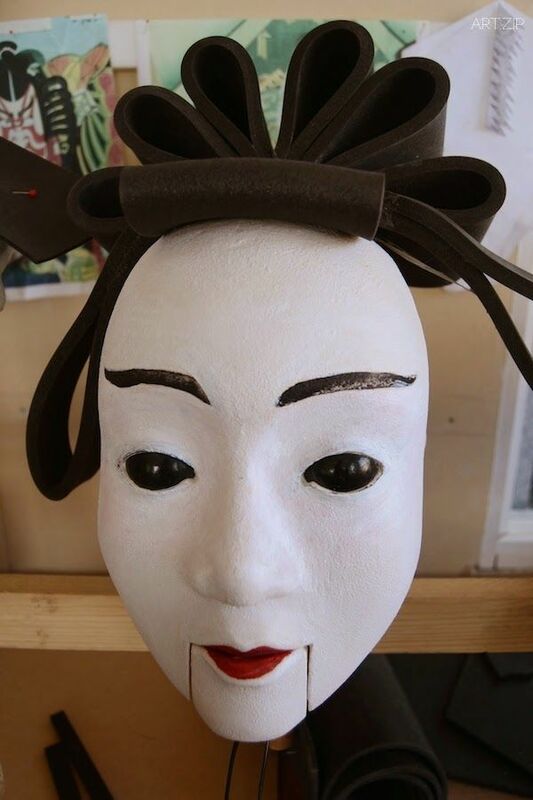 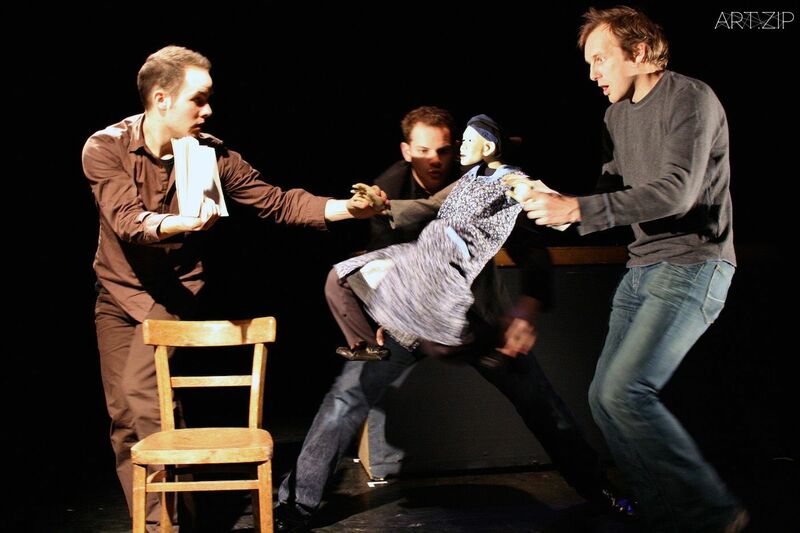 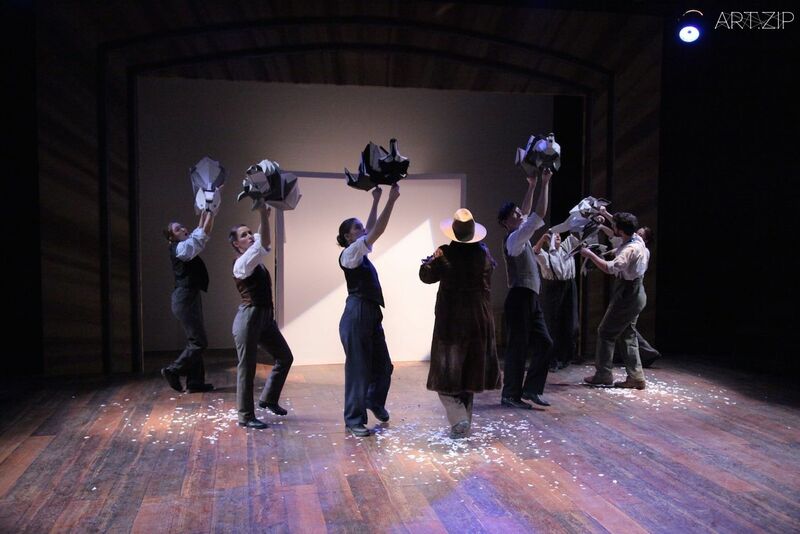 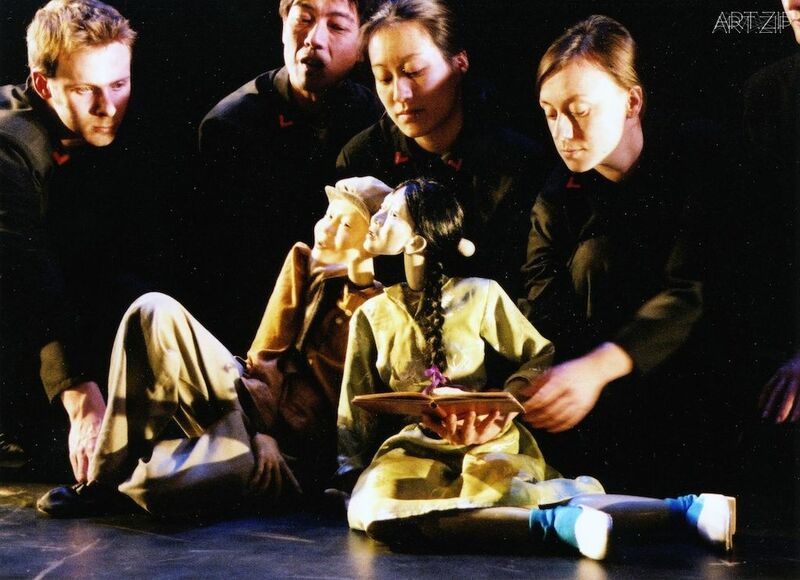 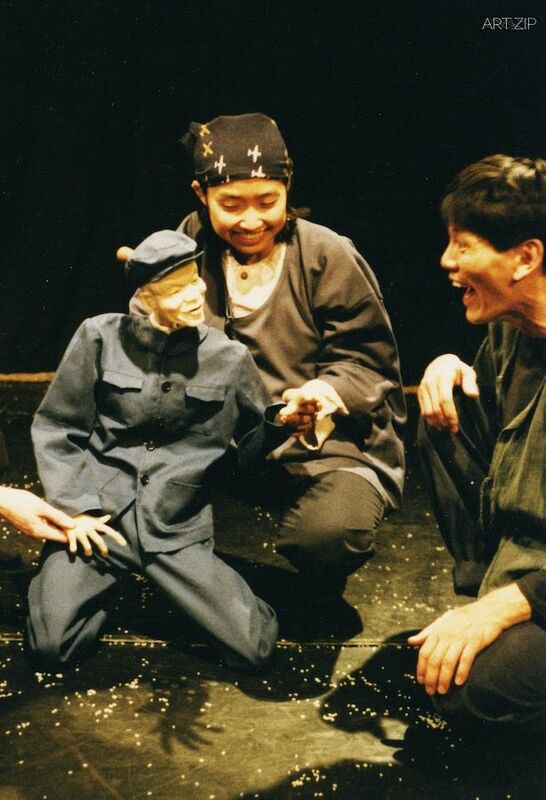 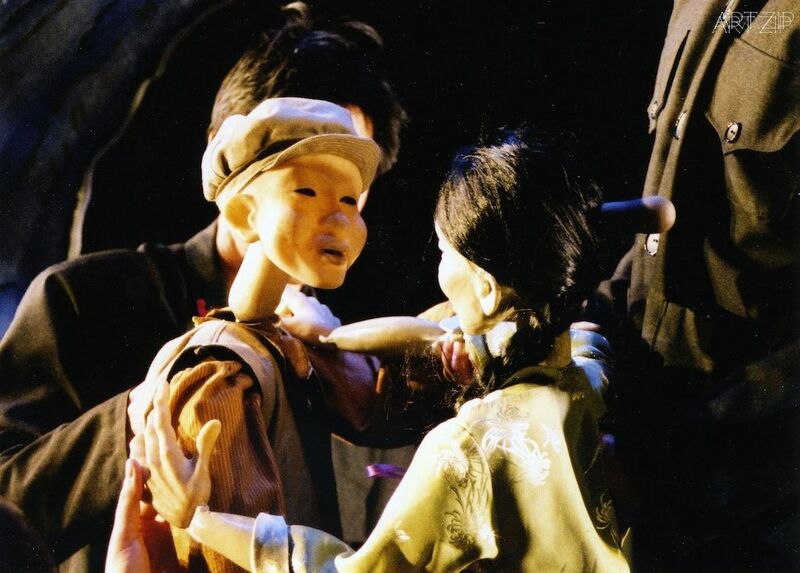 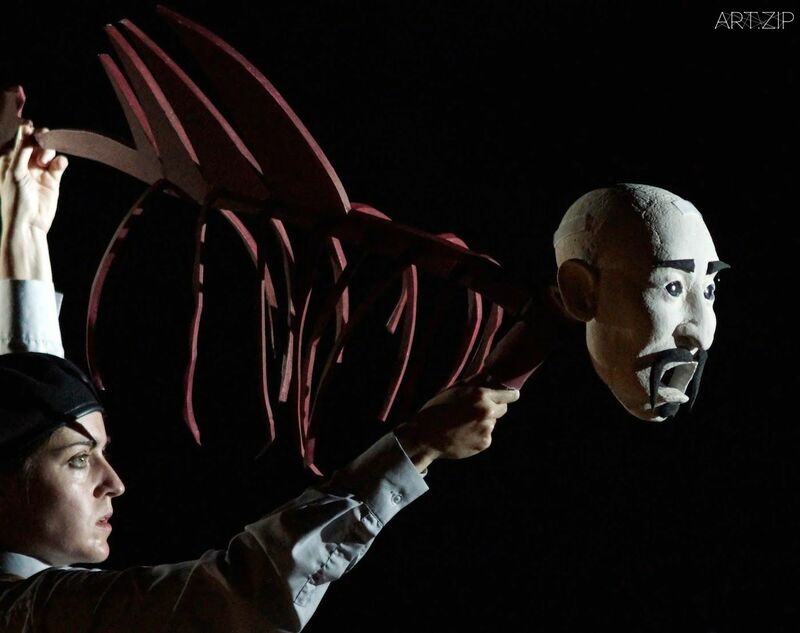 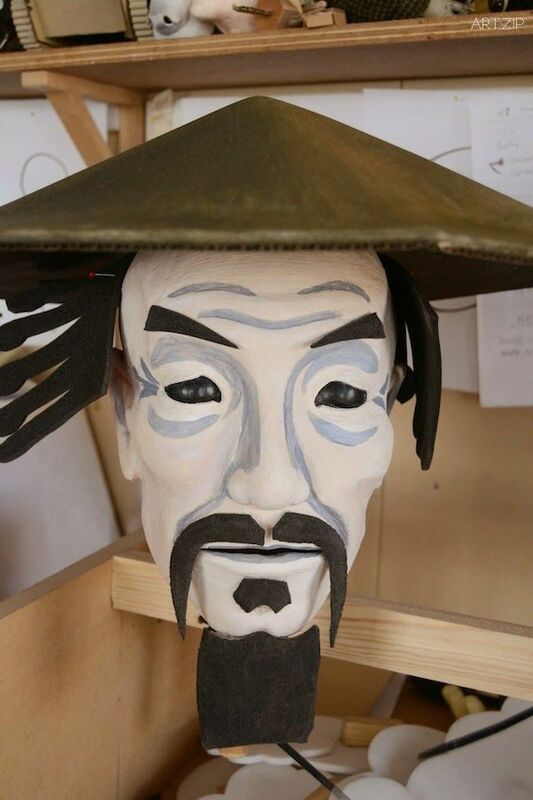 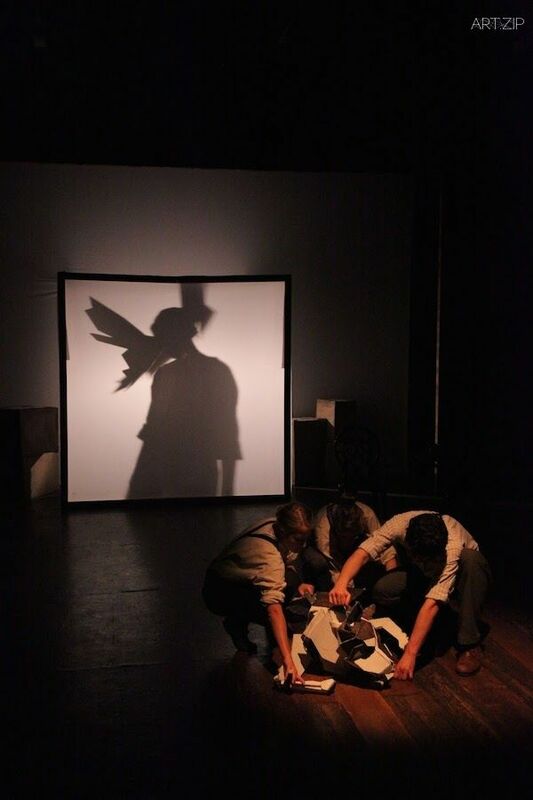 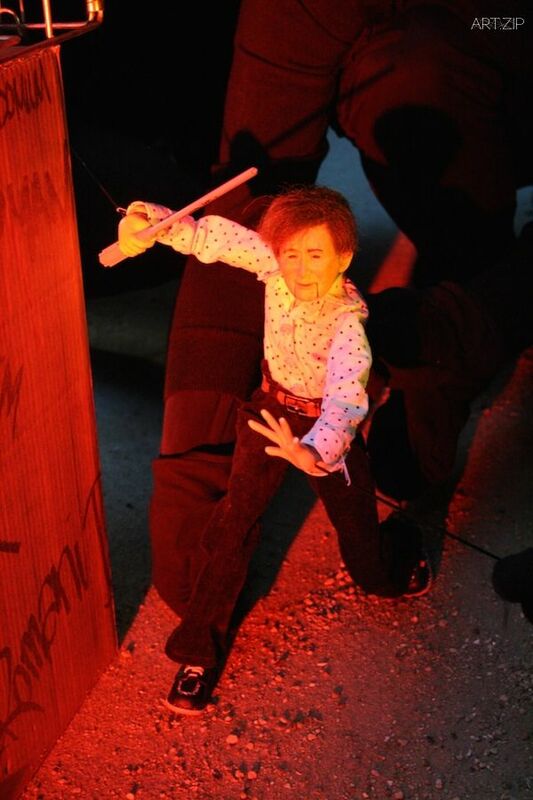 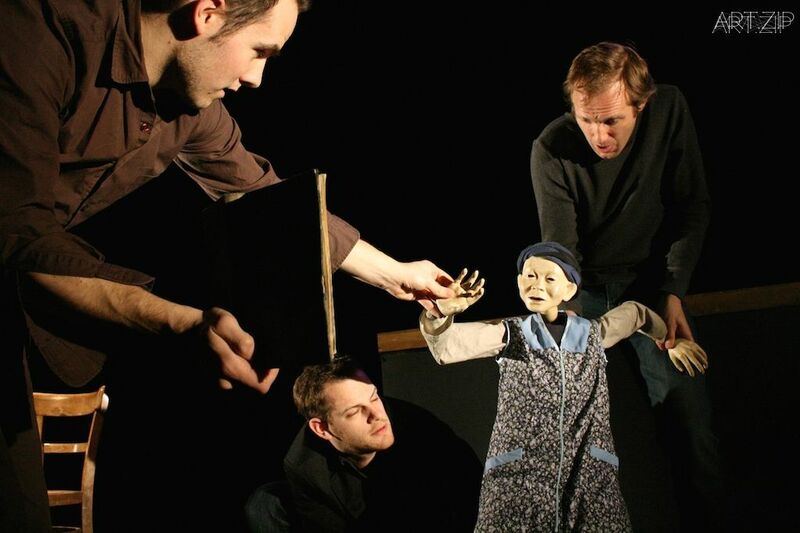 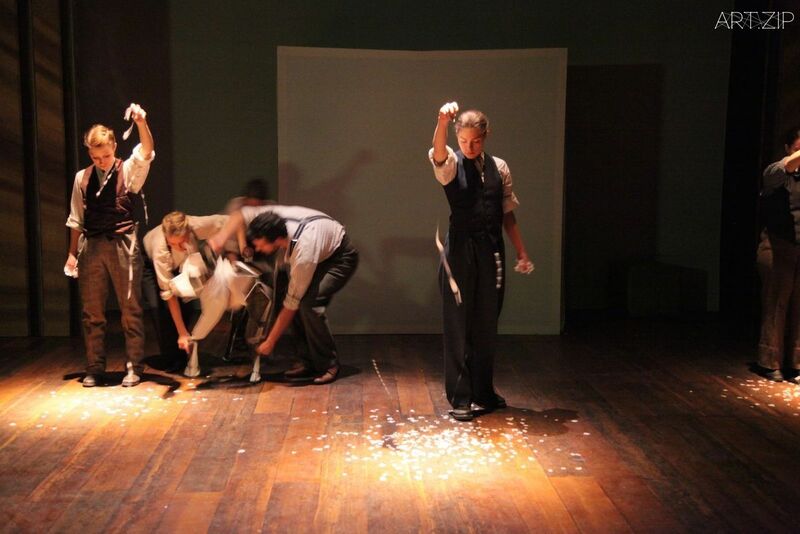 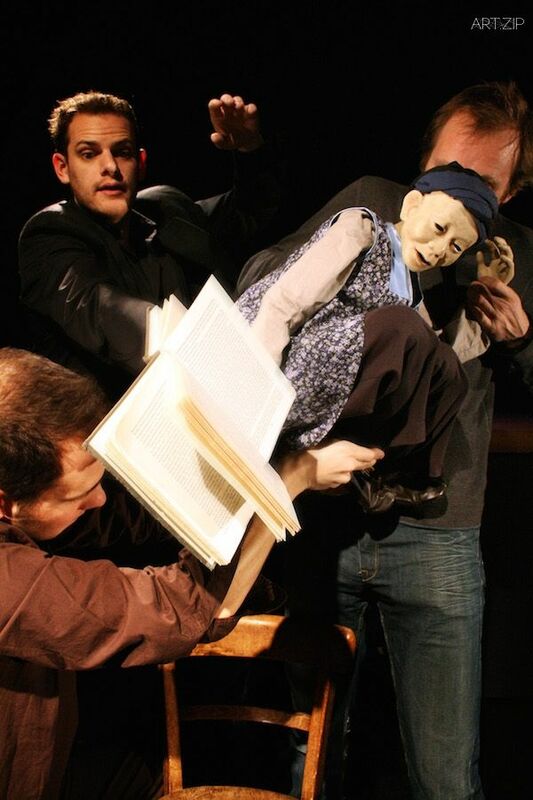 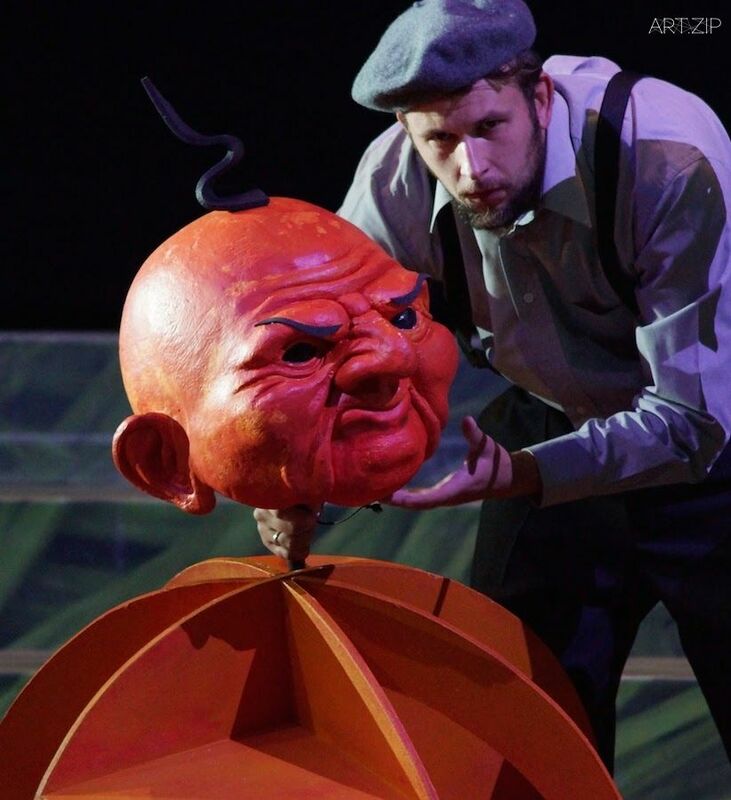 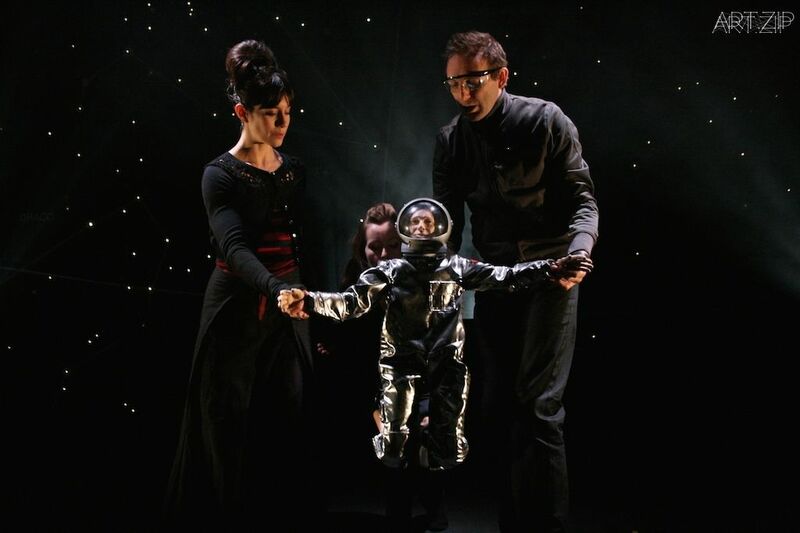 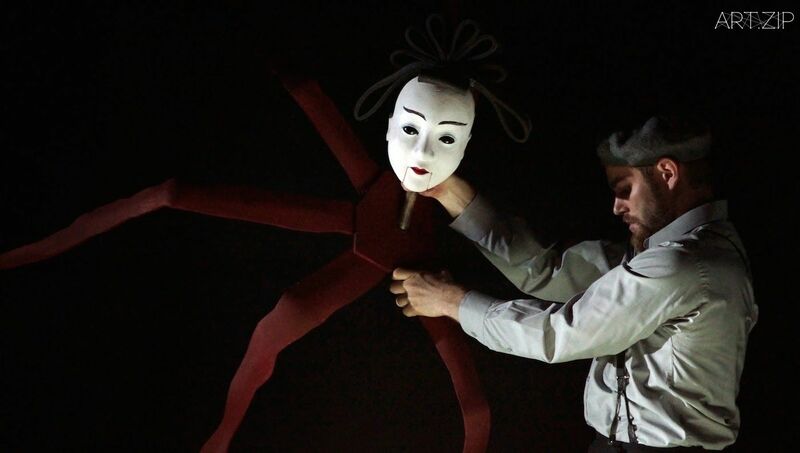 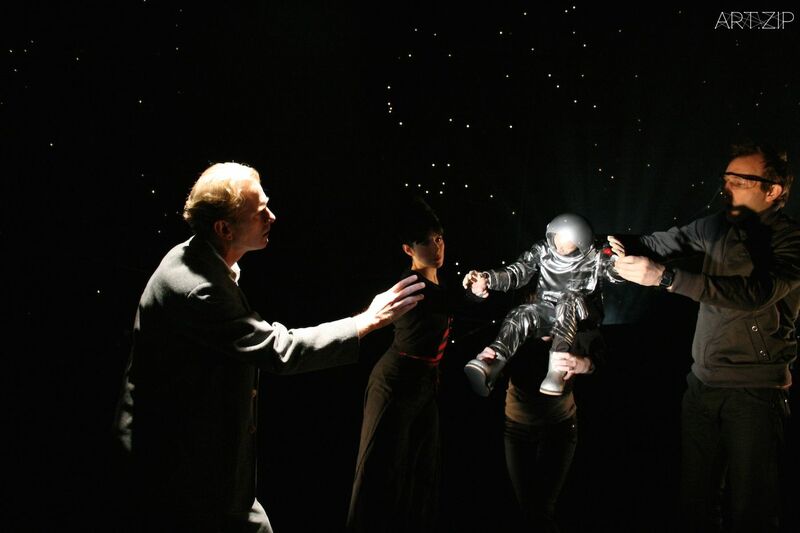 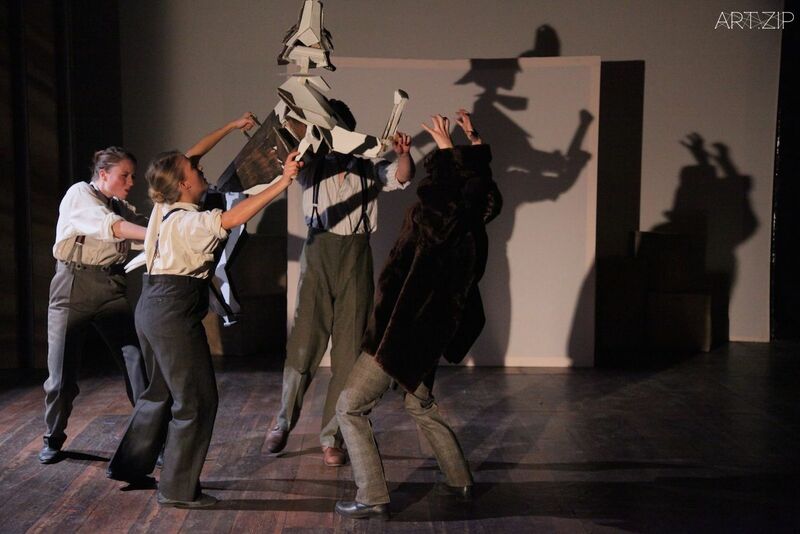 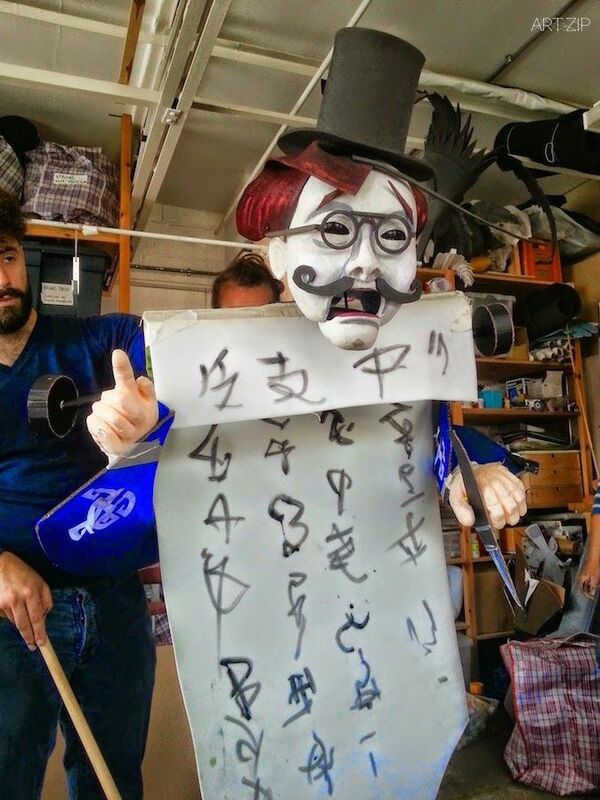 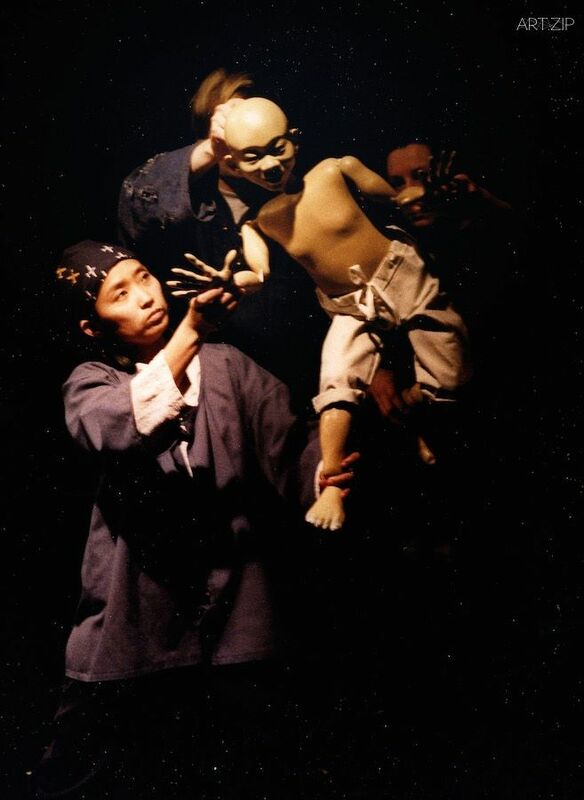 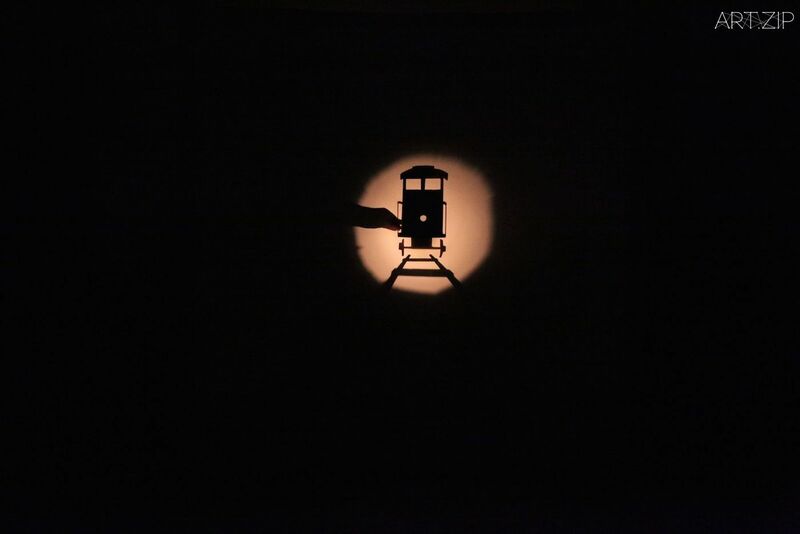 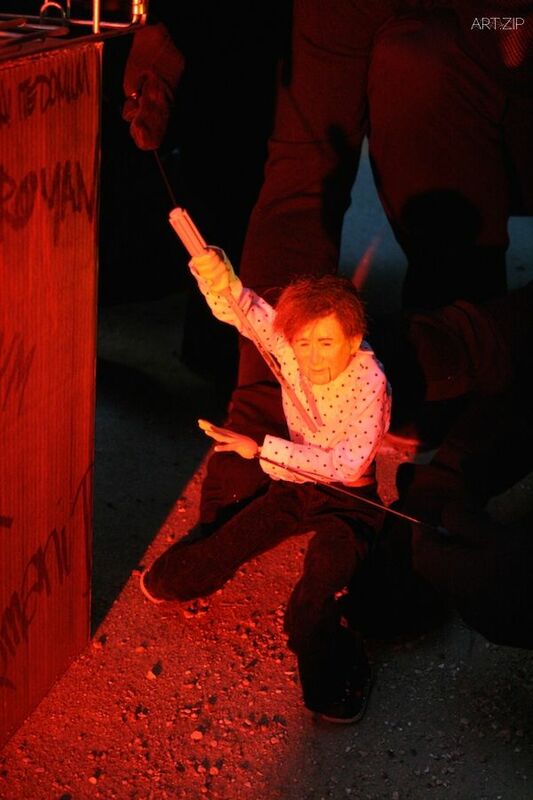 Blind Summit work with a rigorous and exciting form of puppetry: inspired by traditional Japanese Bunraku, a team of three performers work together with a single puppet to create a riveting show. 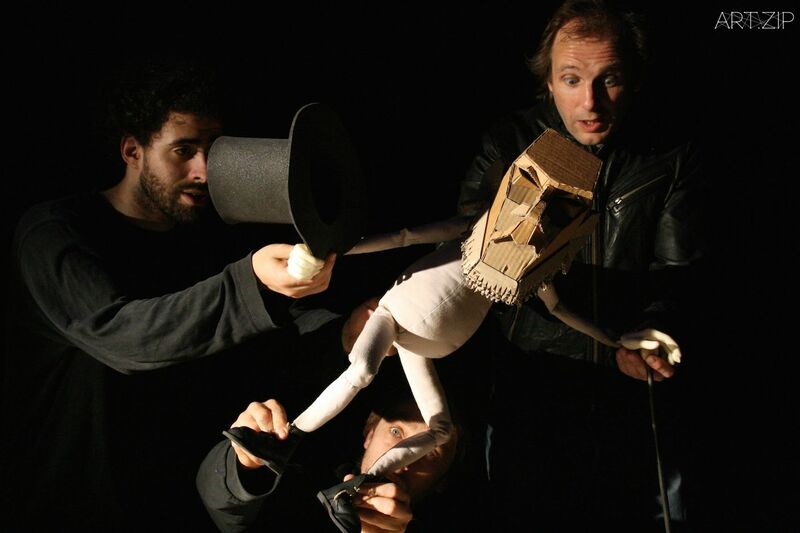 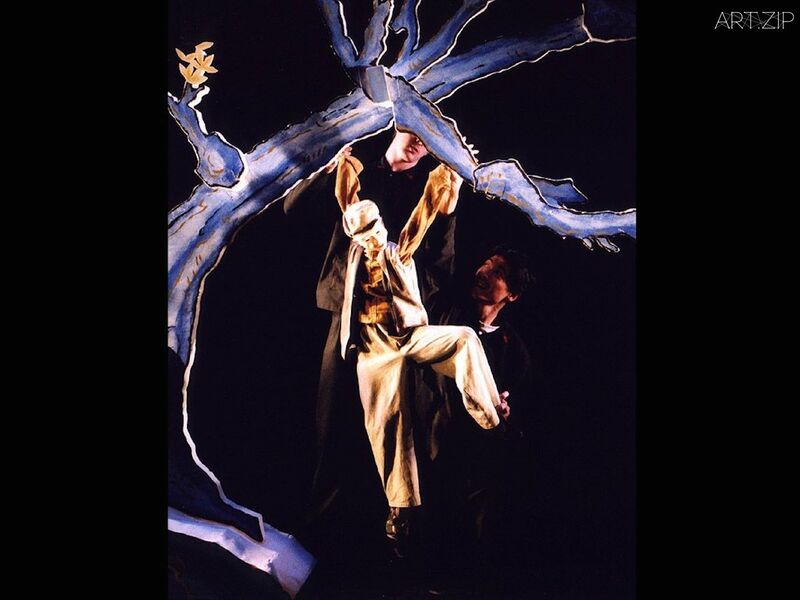 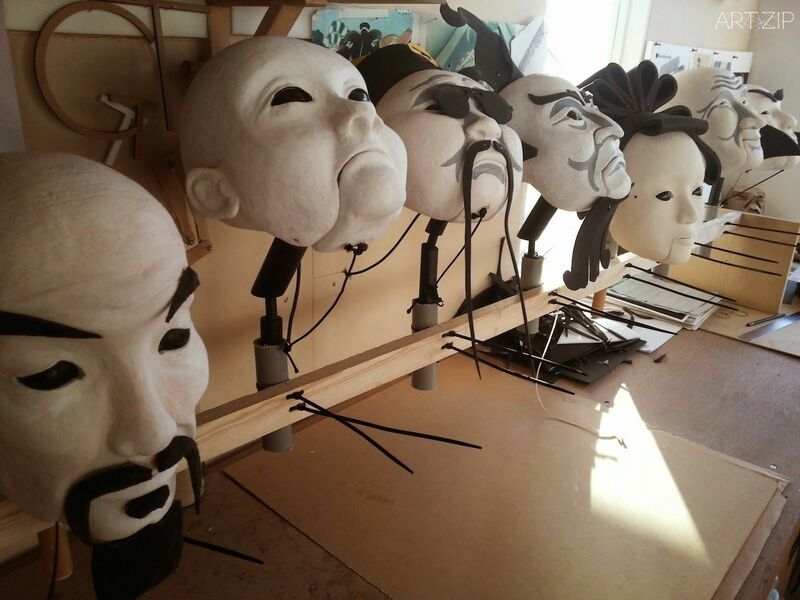 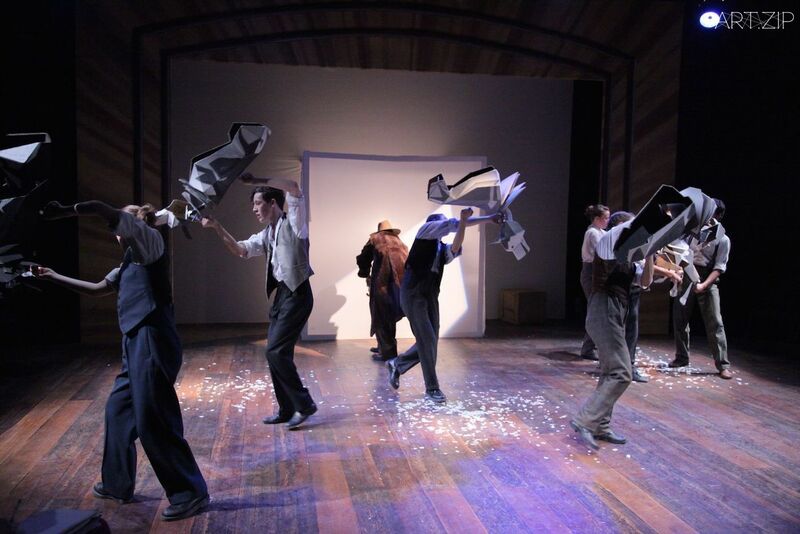 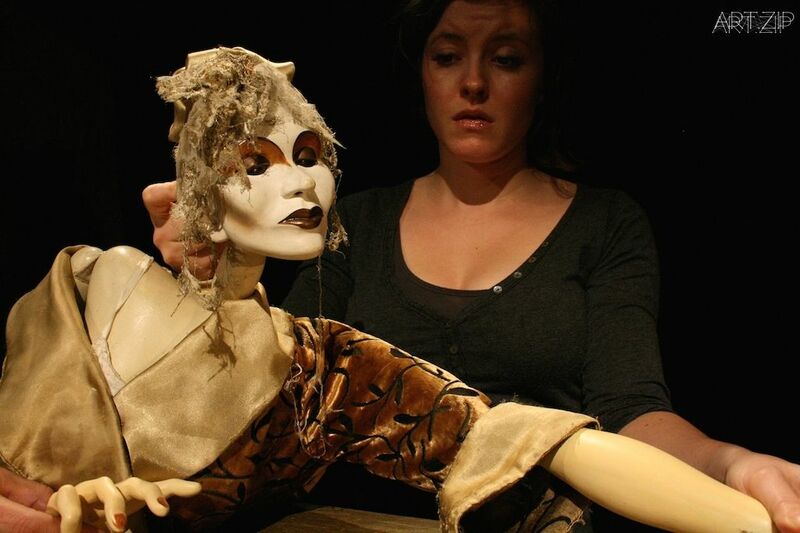 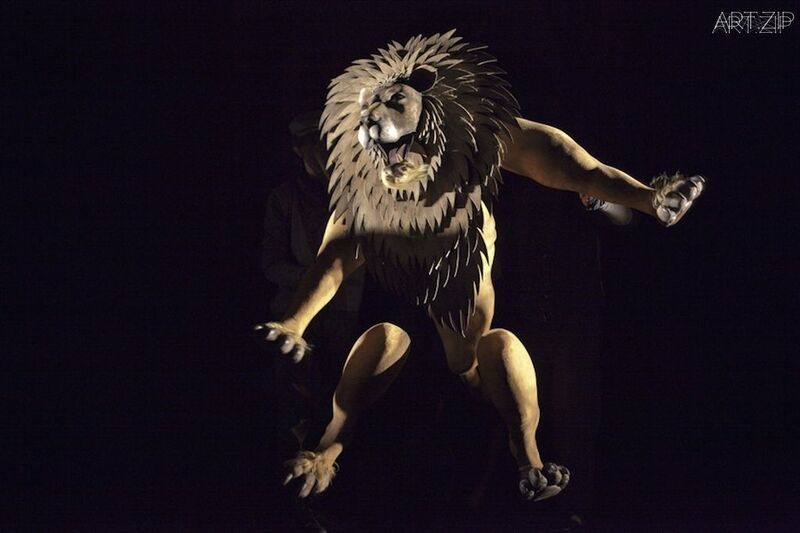 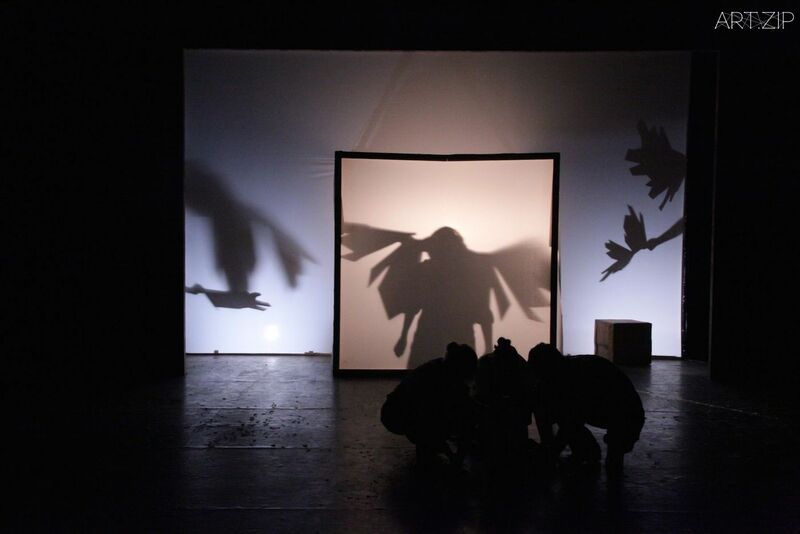 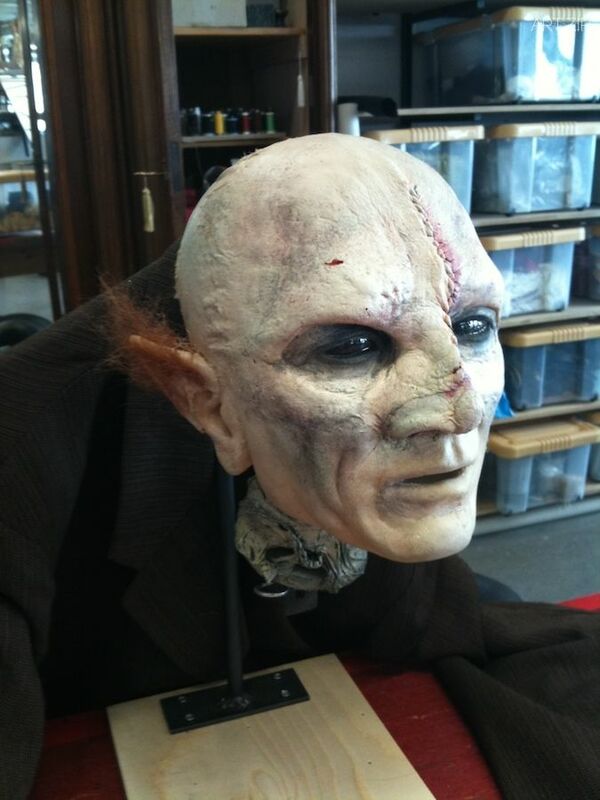 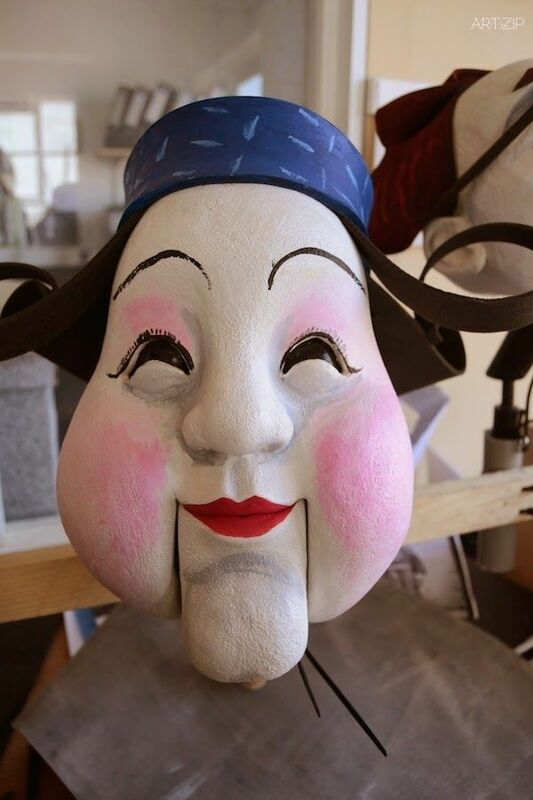 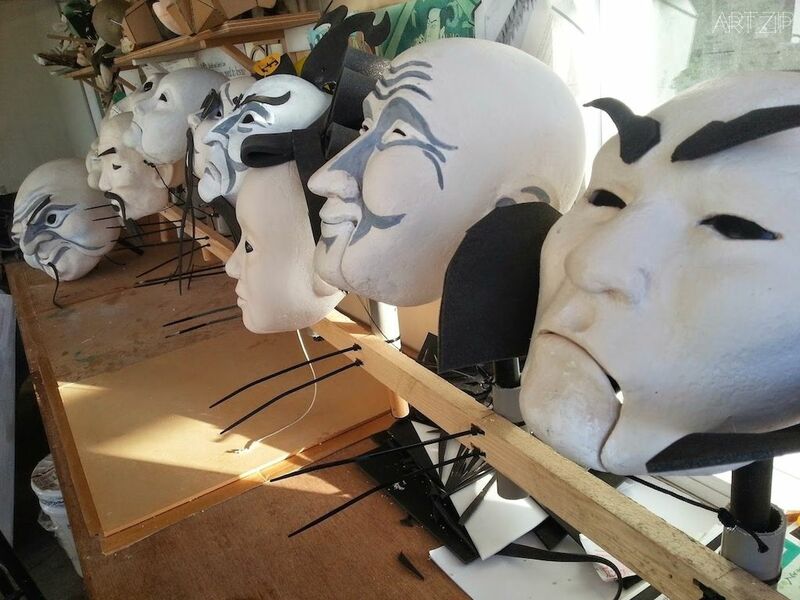 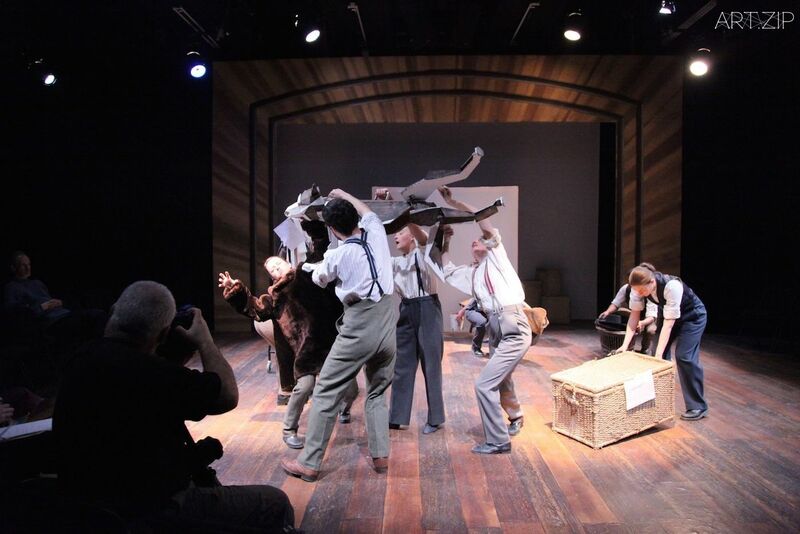 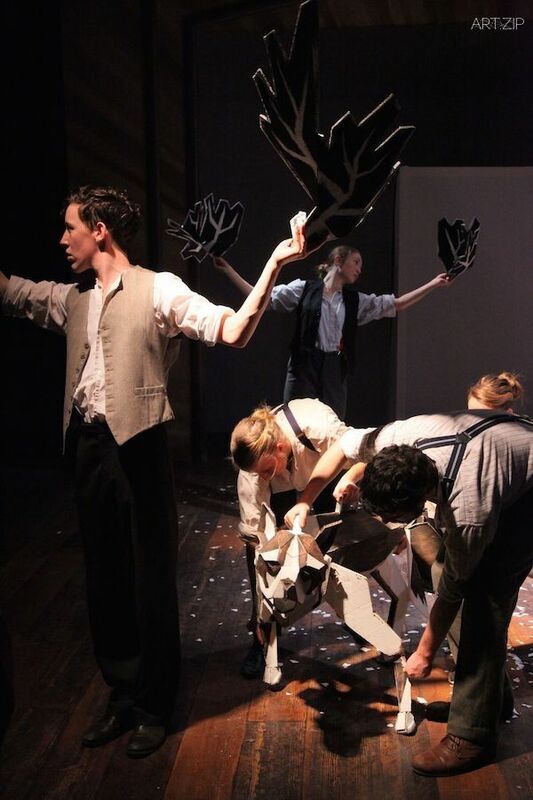 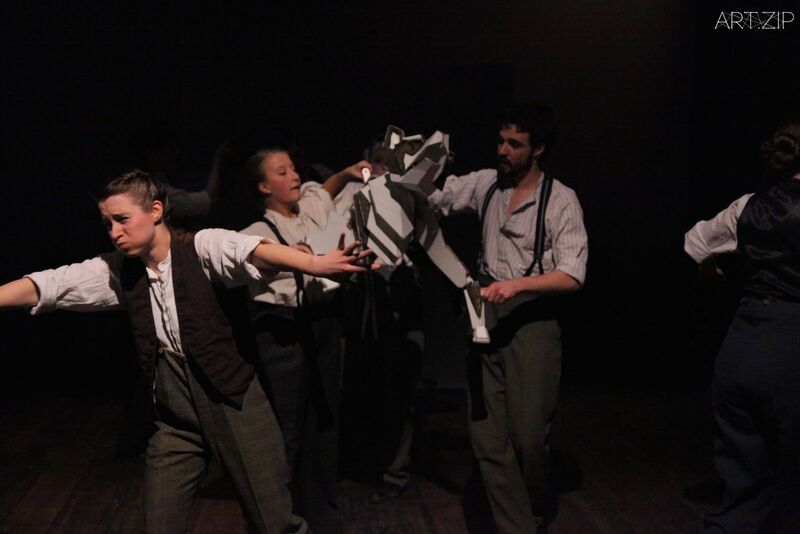 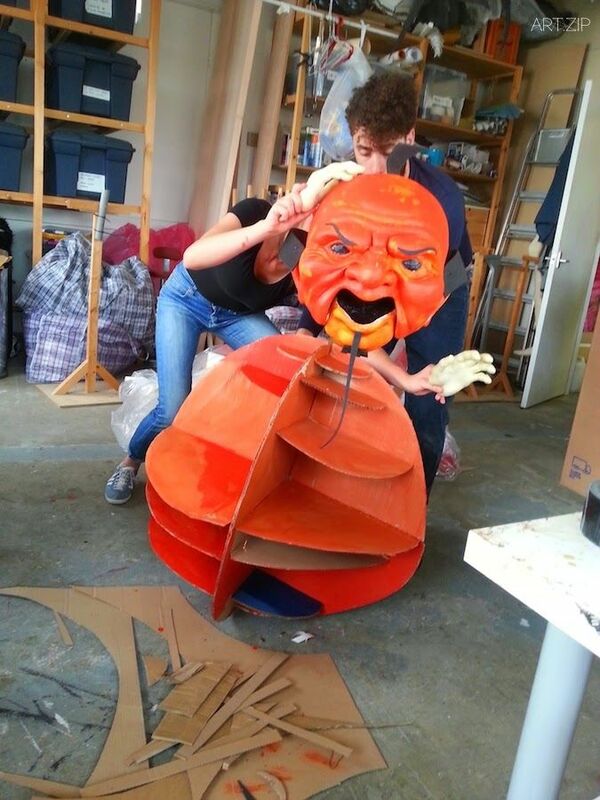 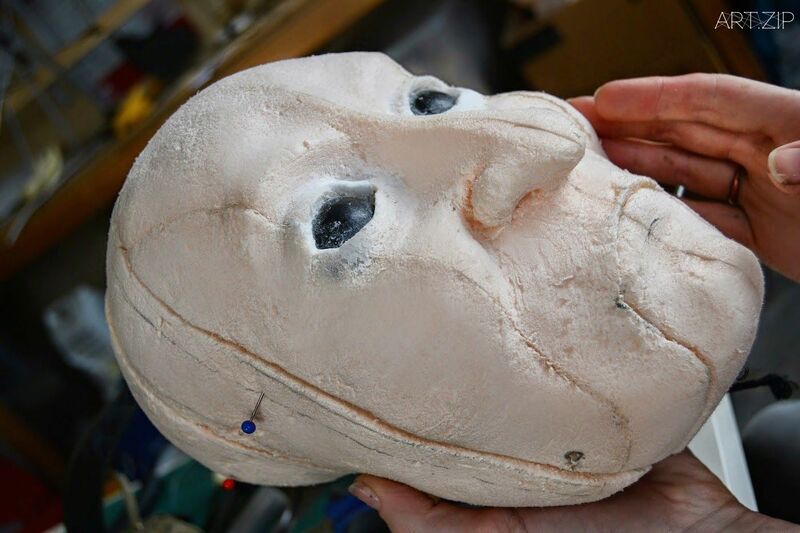 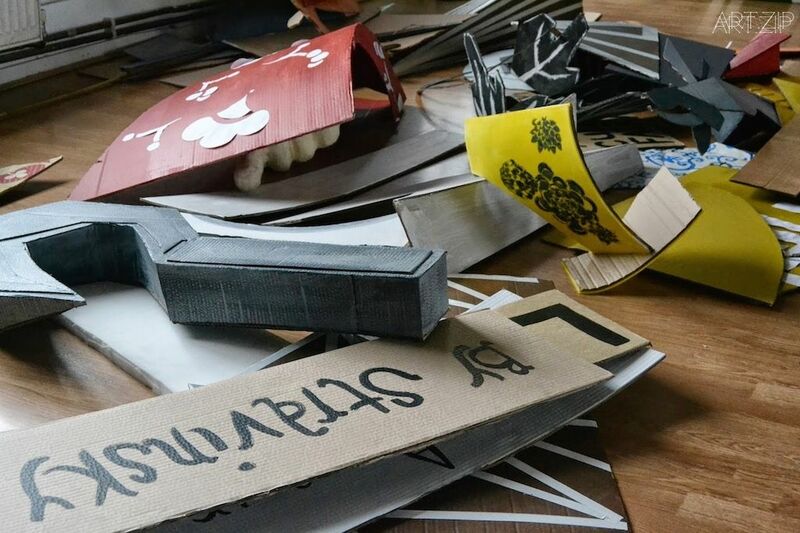 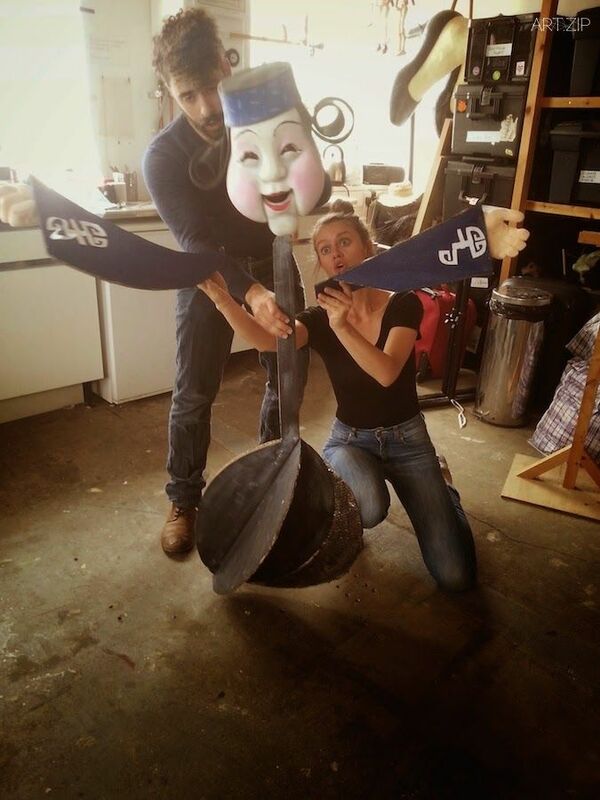 As a touring company, they are allowed a degree of flexibility within their productions – they devise shows, commission new works from artists with raw talent and create bespoke puppets for each production. 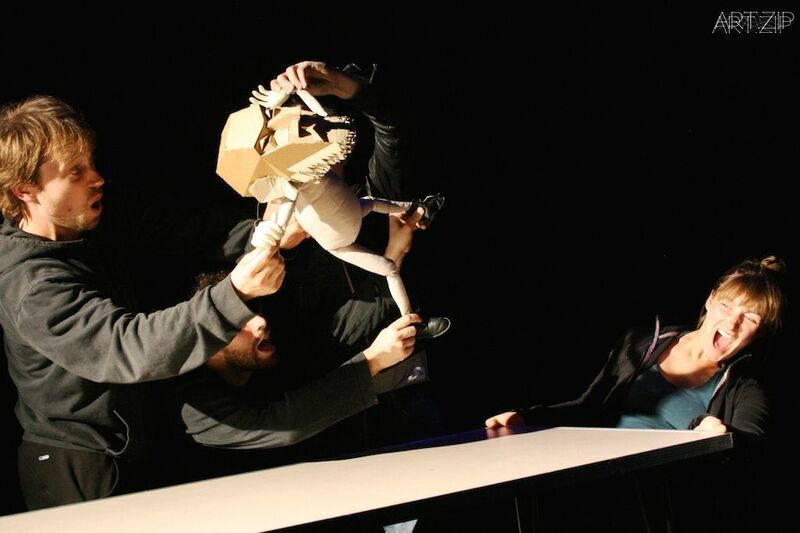 Blind Summit therefore pioneer and advocate new and exciting pieces of theatre that are not purely categorised by their usage of puppets. 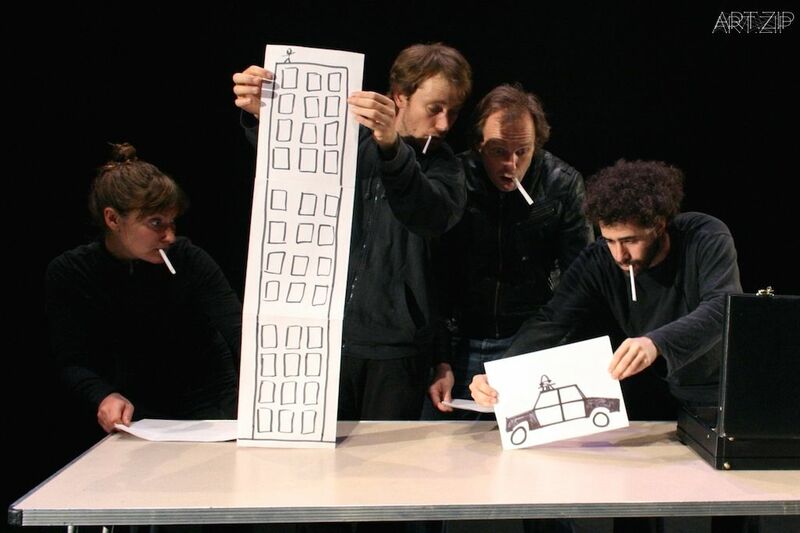 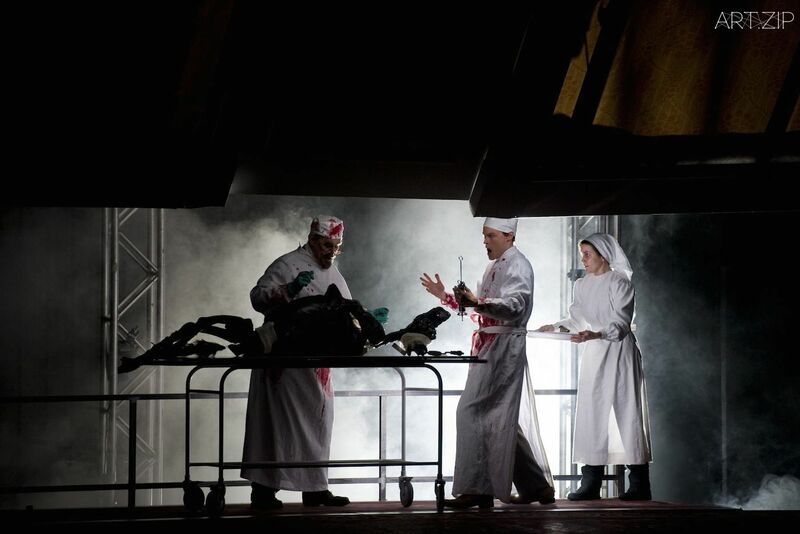 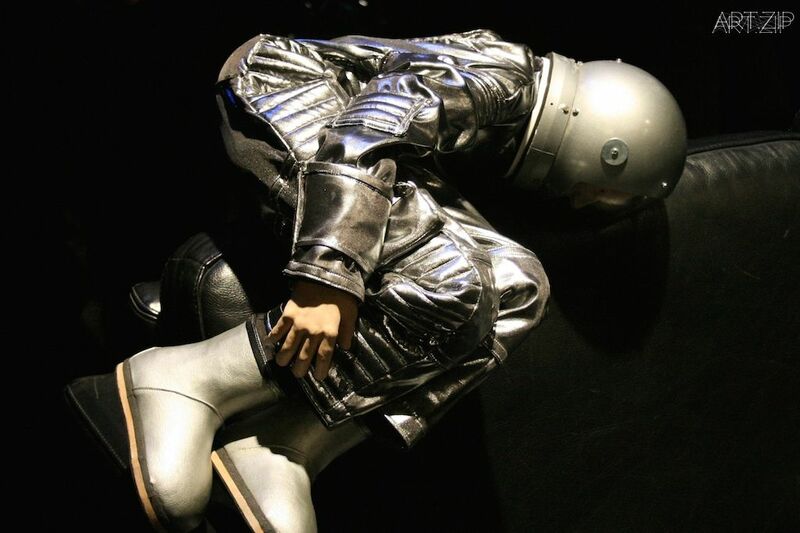 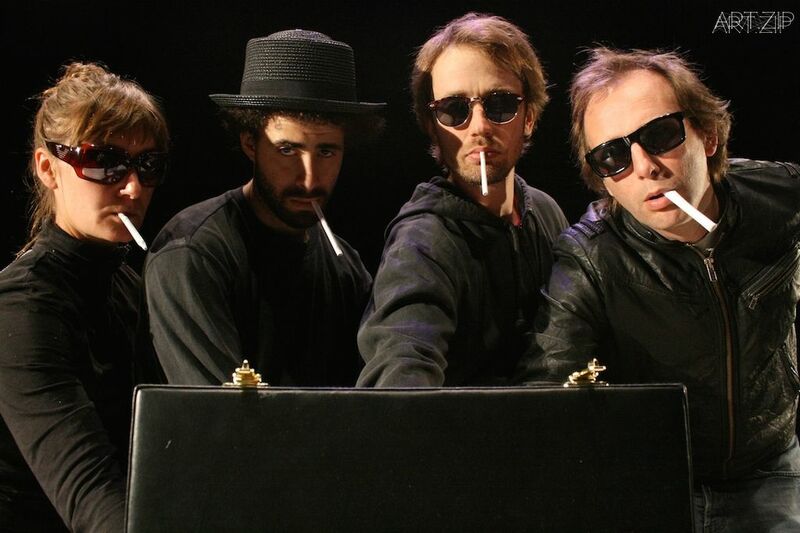 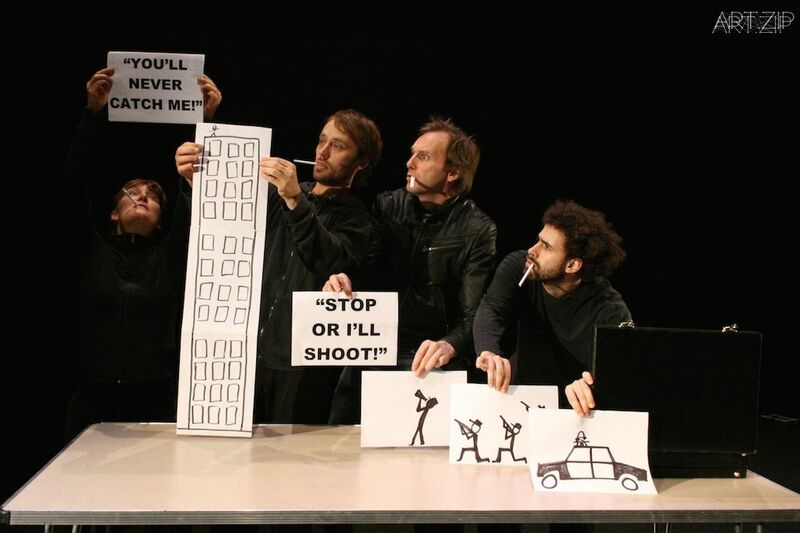 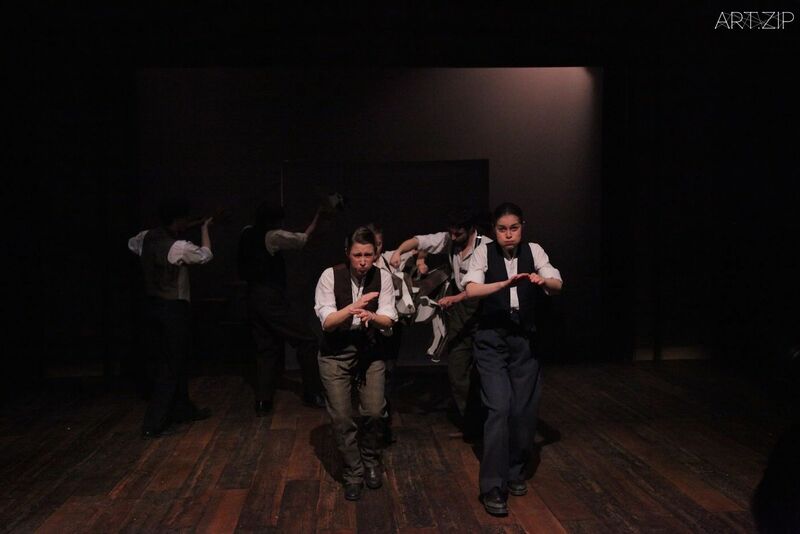 Lowlife, the company’s cult hit which began life in 2005 and toured internationally for four years, is a prime demonstration of their company ethos. 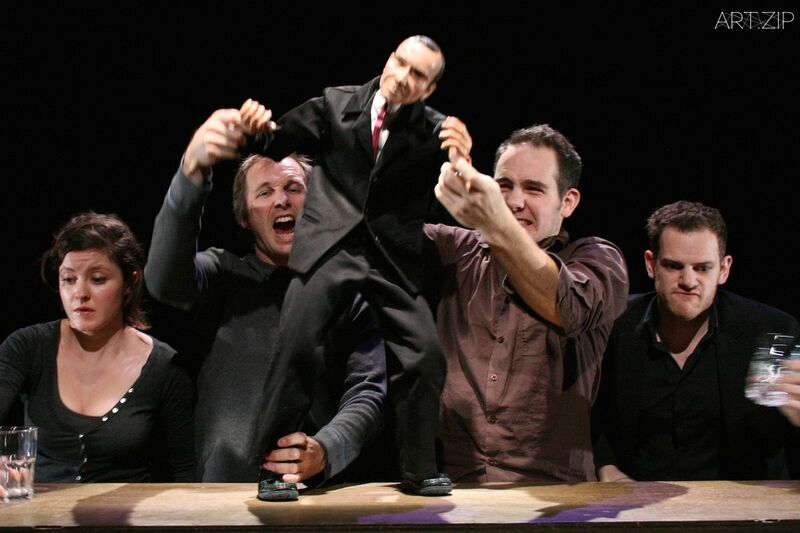 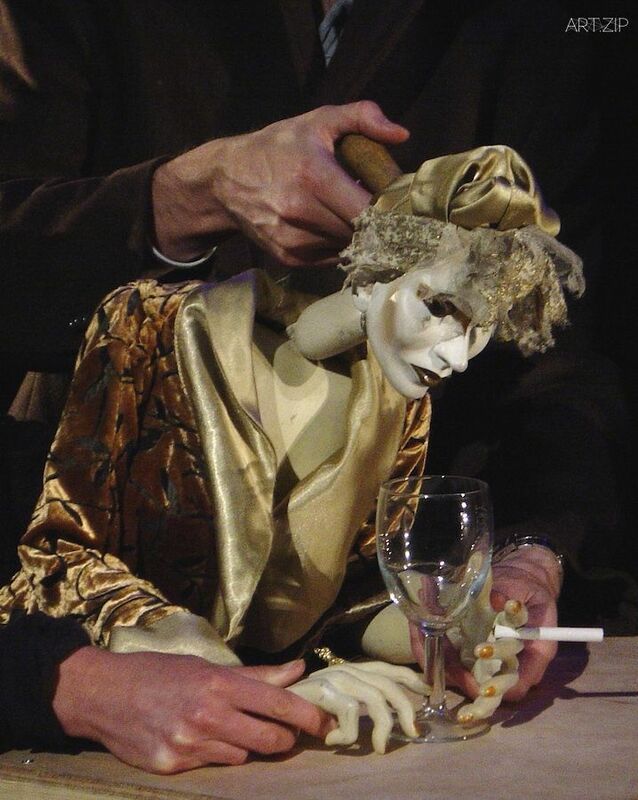 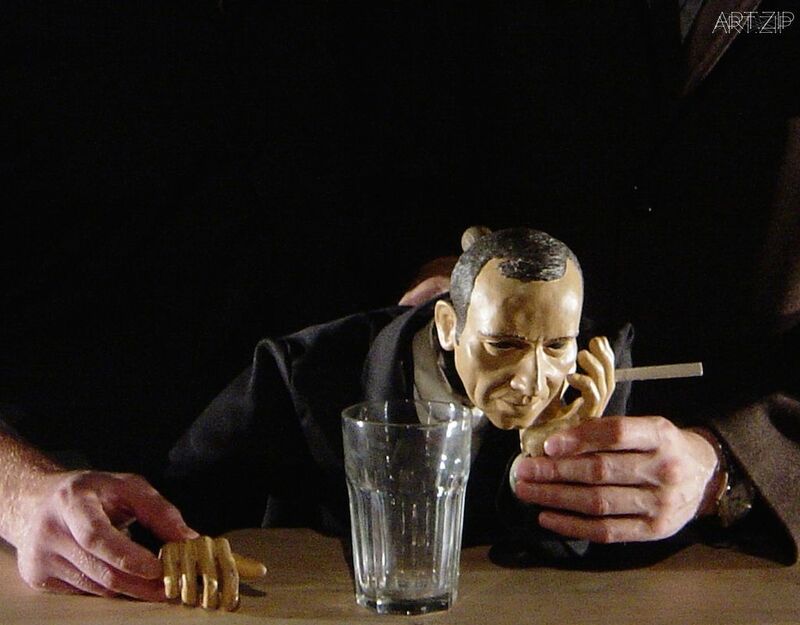 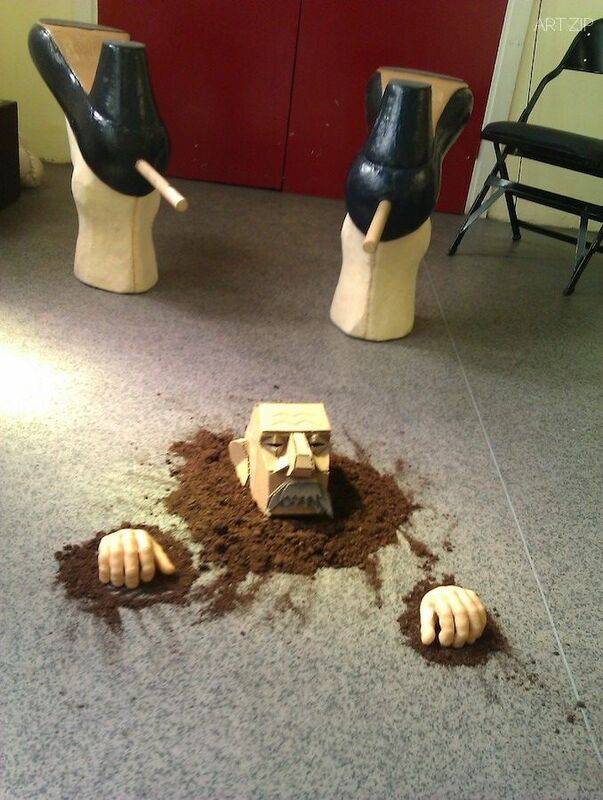 Down and Barnes have always maintained that the company seeks to bring puppetry to a broadly adult audience, and the gin-suffused cabaret, with its melancholic and darkly comedic tone, took from Charles Bukowski’s short stories to create a show which redefined the concept of puppeteering within theatrical convention. 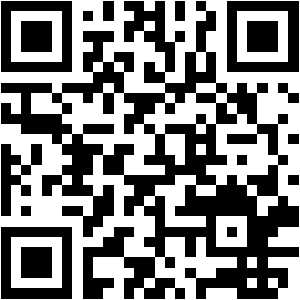 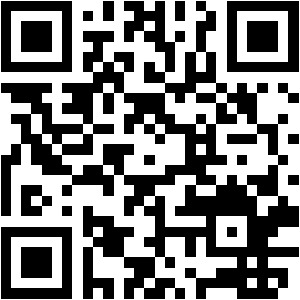 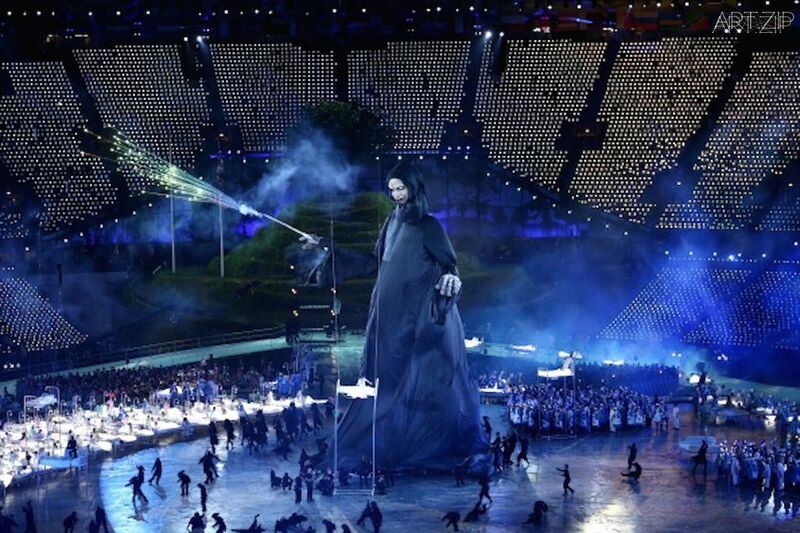 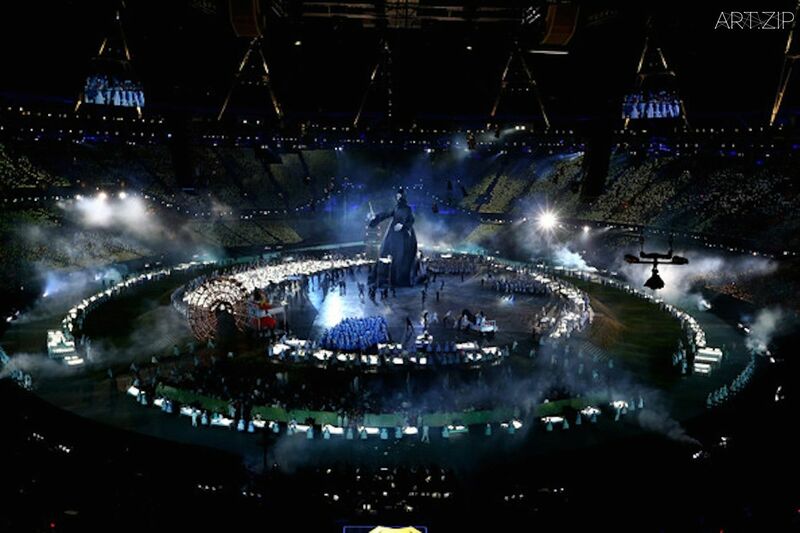 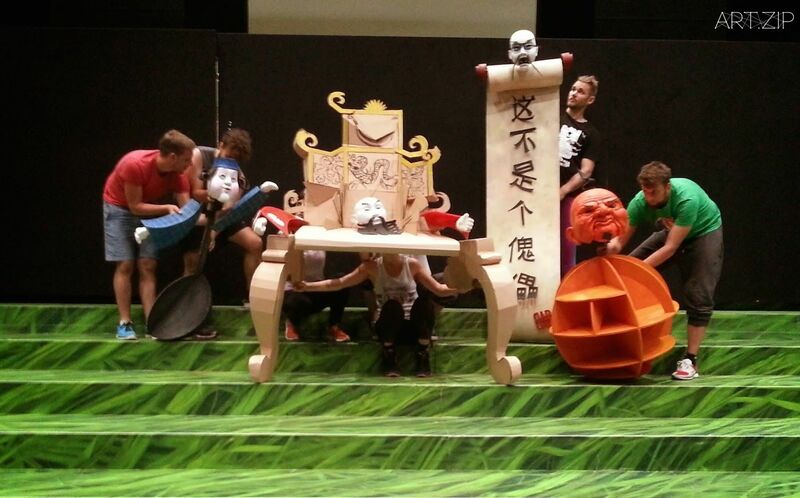 As a flexible and adaptable company, Blind Summit has brought multiple productions across the world and to China. 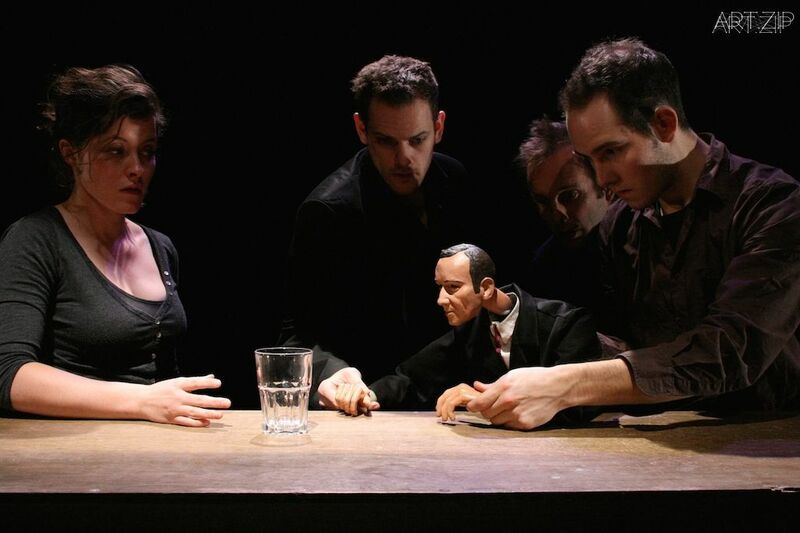 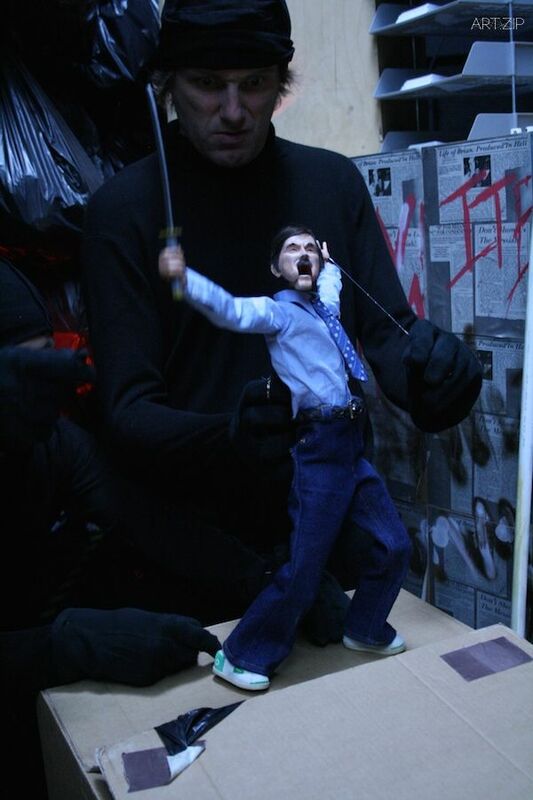 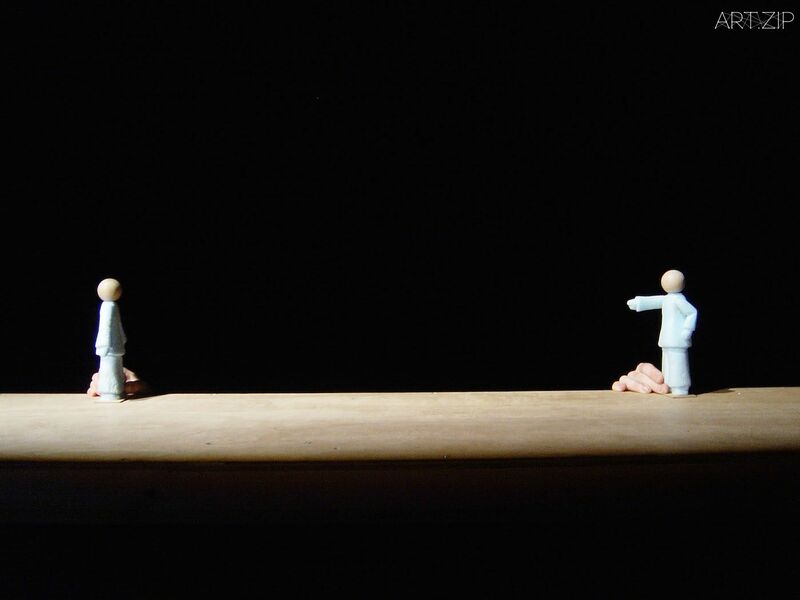 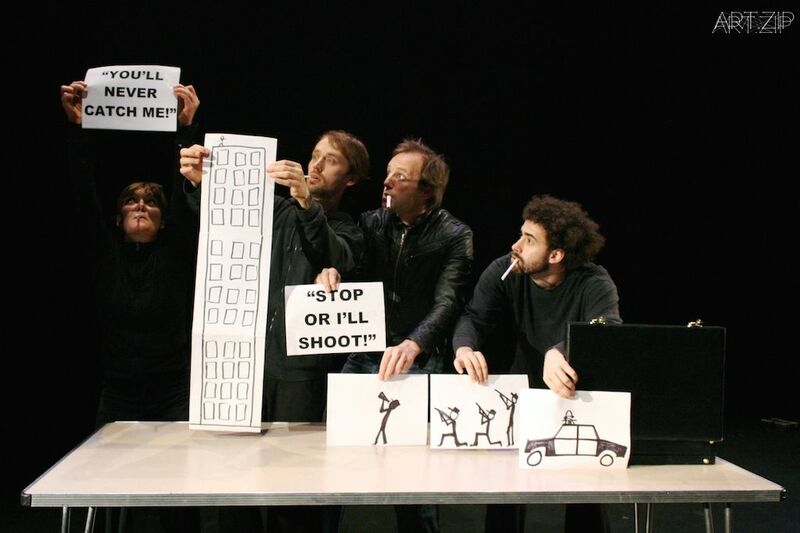 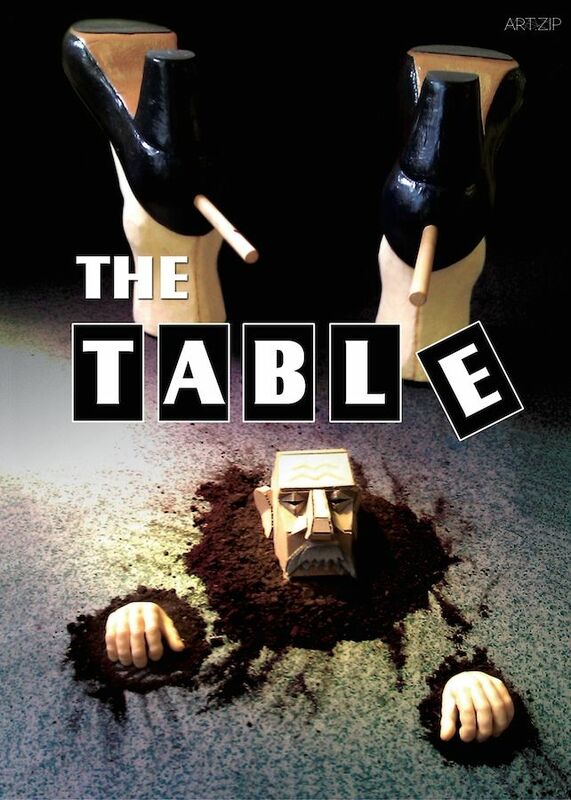 Their latest venture, the original devised piece ‘The Table’ creates a fascinating tension between comedy and philosophy through the medium of a cardboard puppet named Moses, who seeks to tell his audience a story about life and death, whilst also being ‘like a cross [between] Tommy Cooper and Eddie Izzard’. 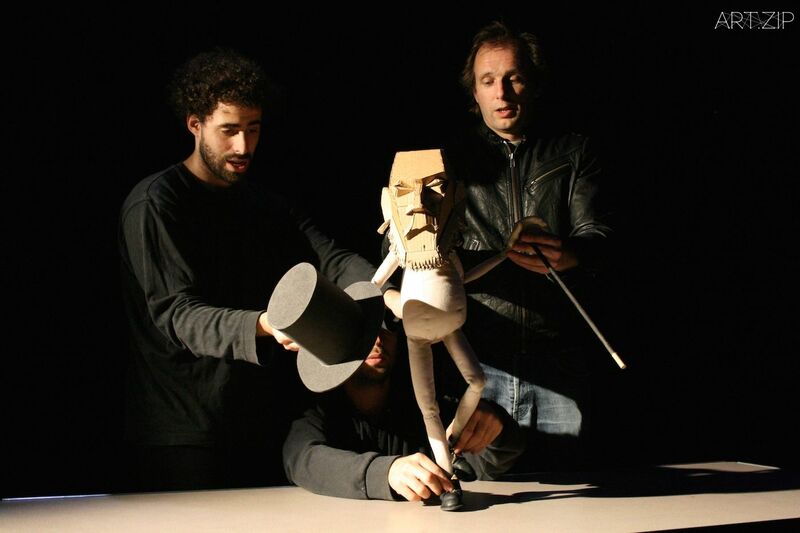 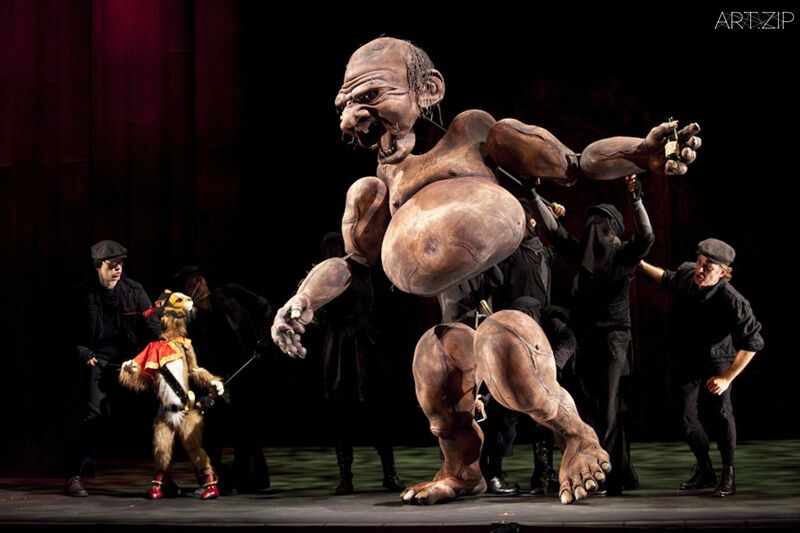 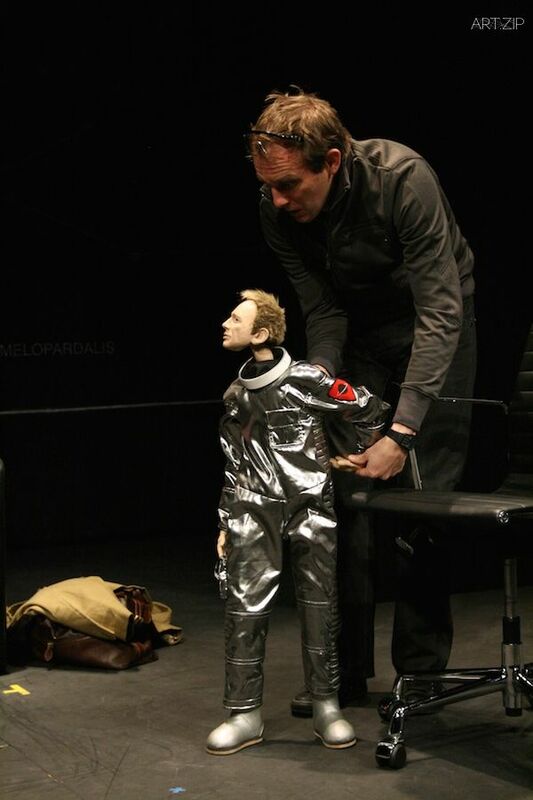 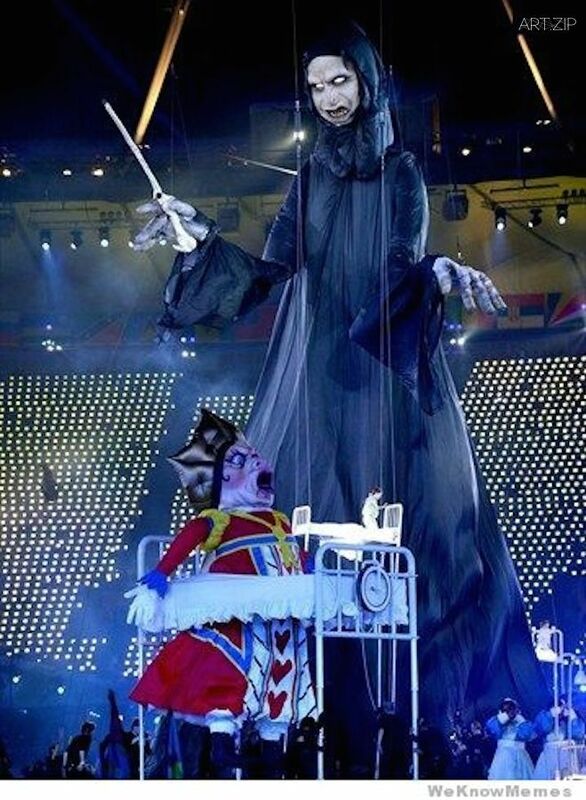 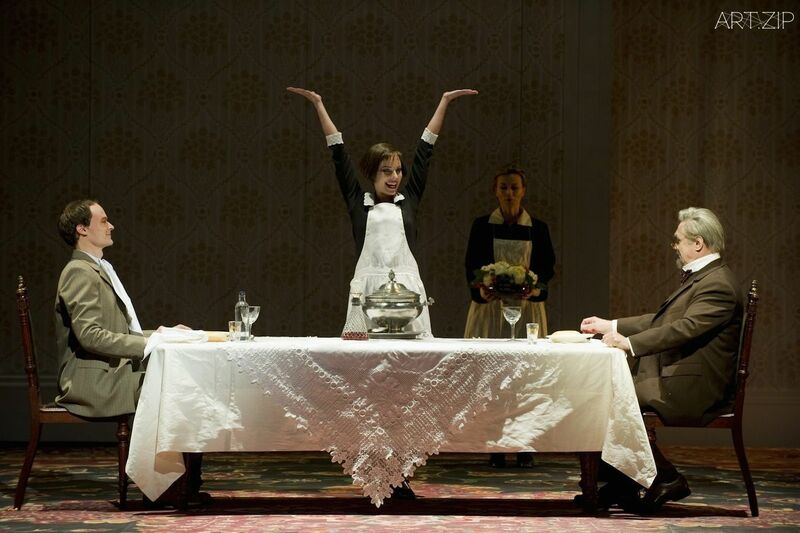 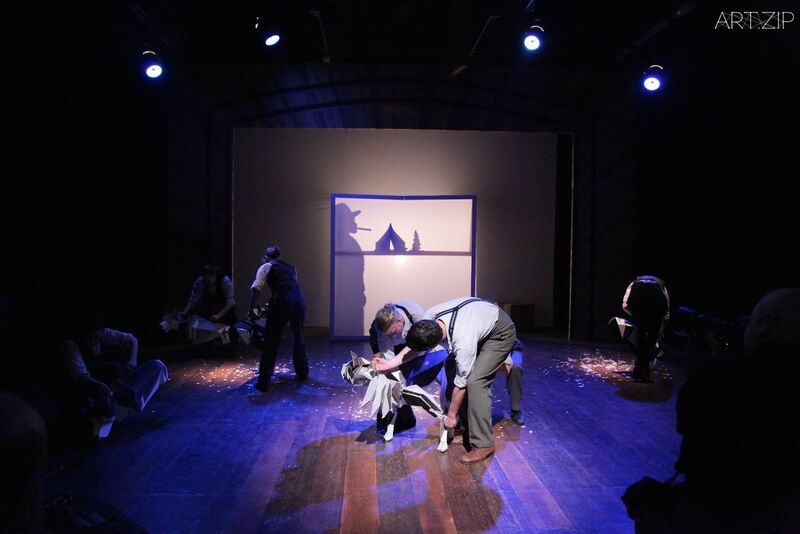 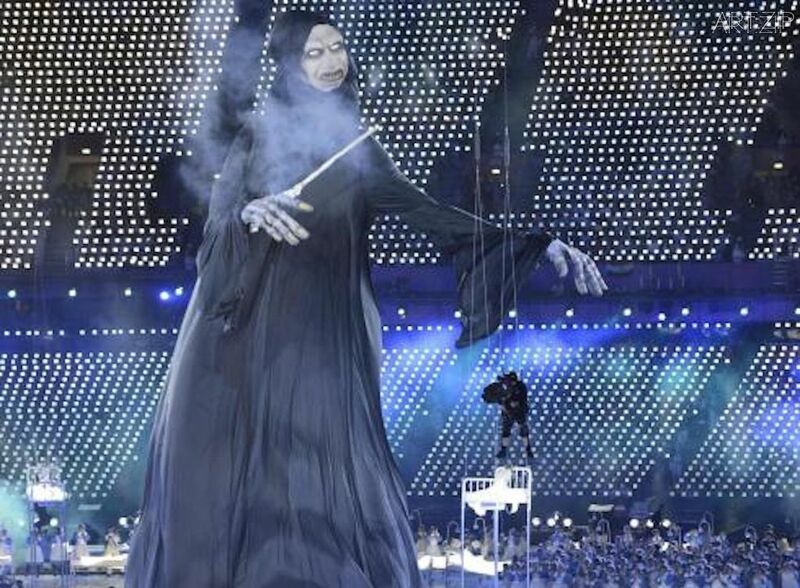 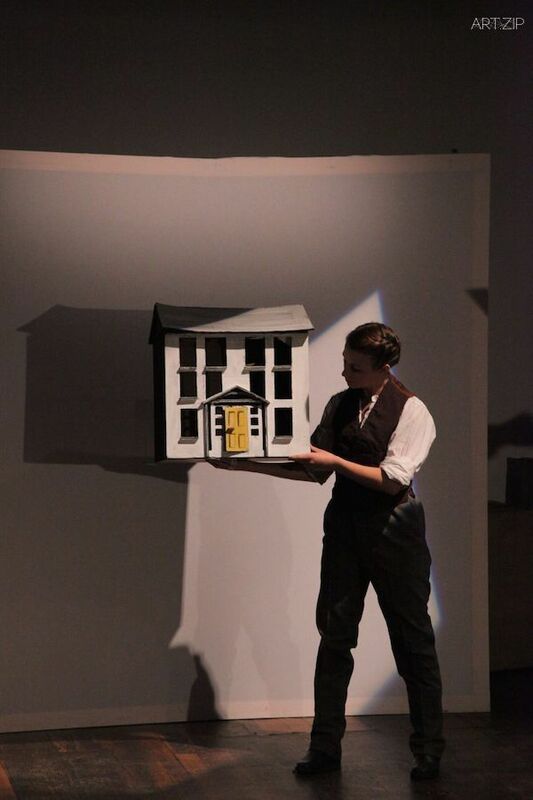 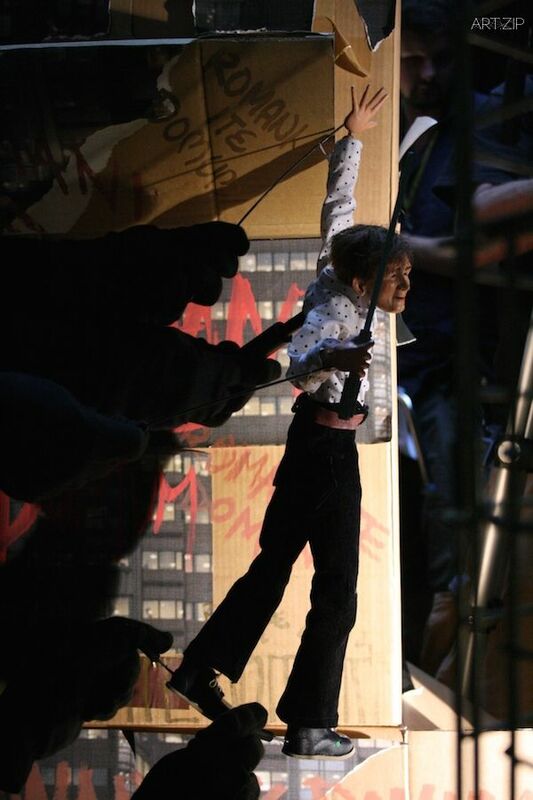 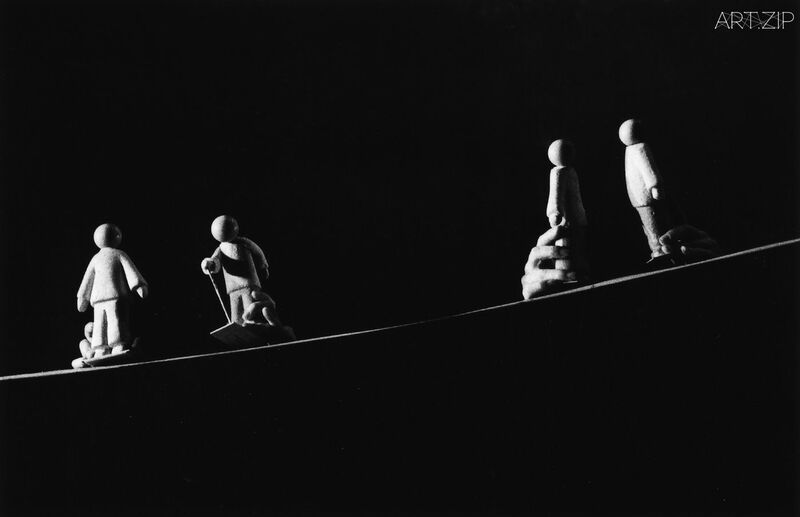 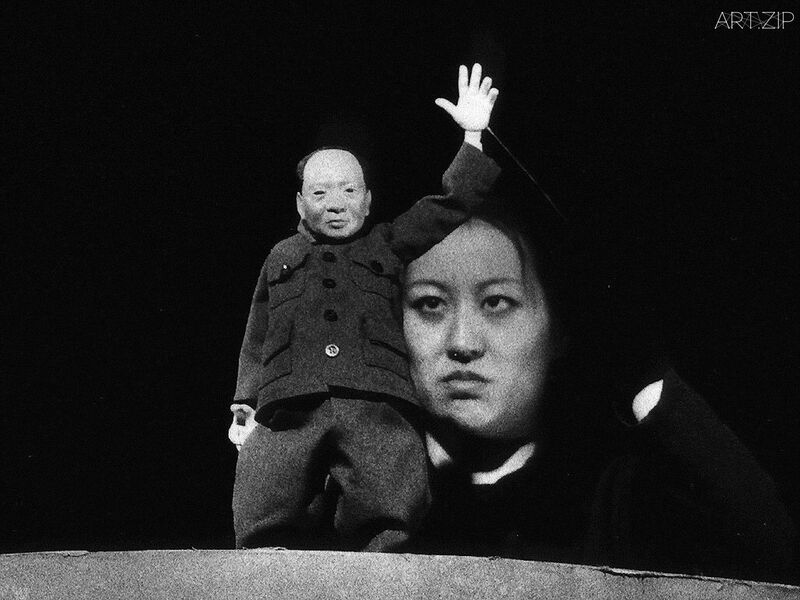 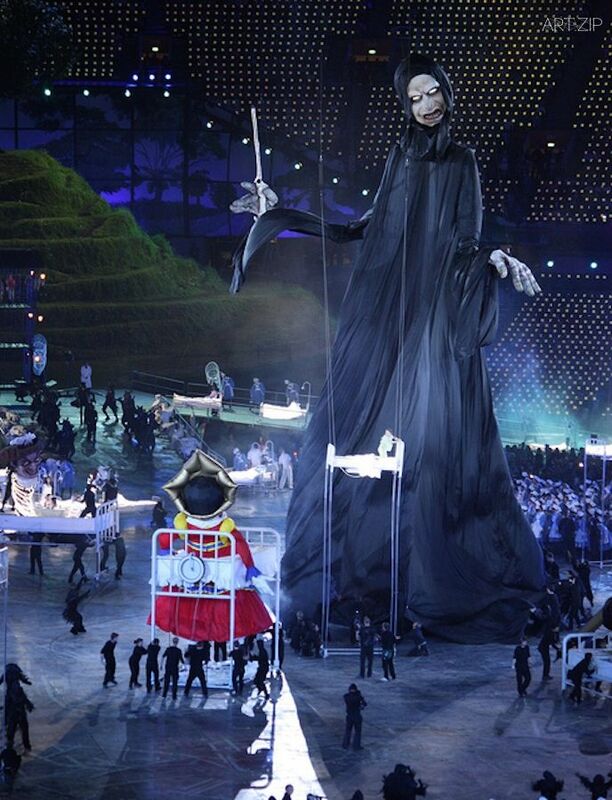 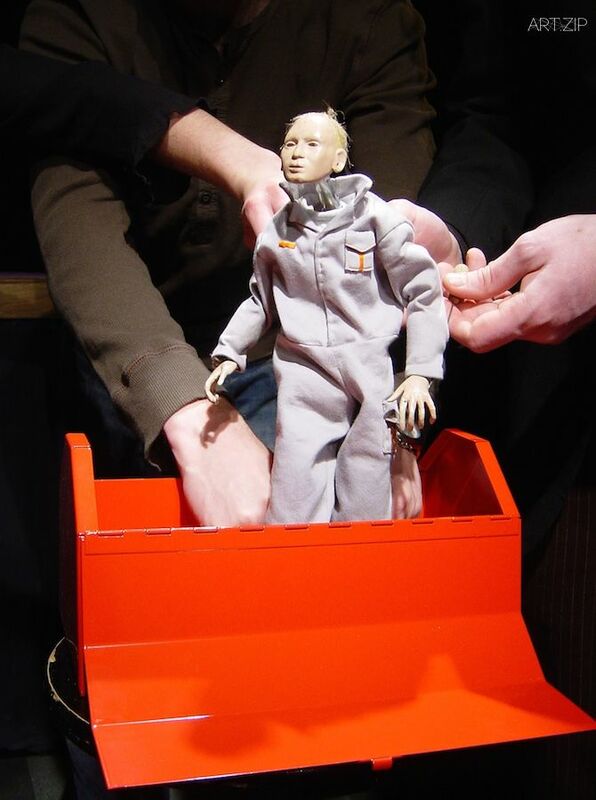 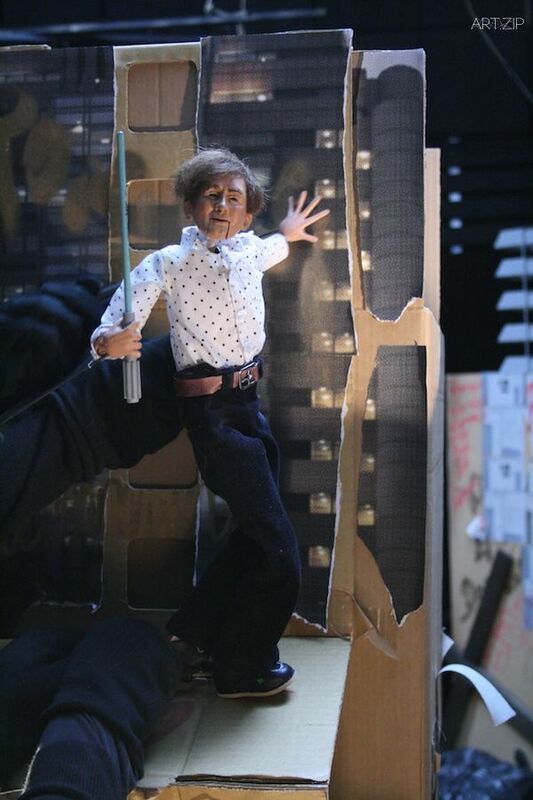 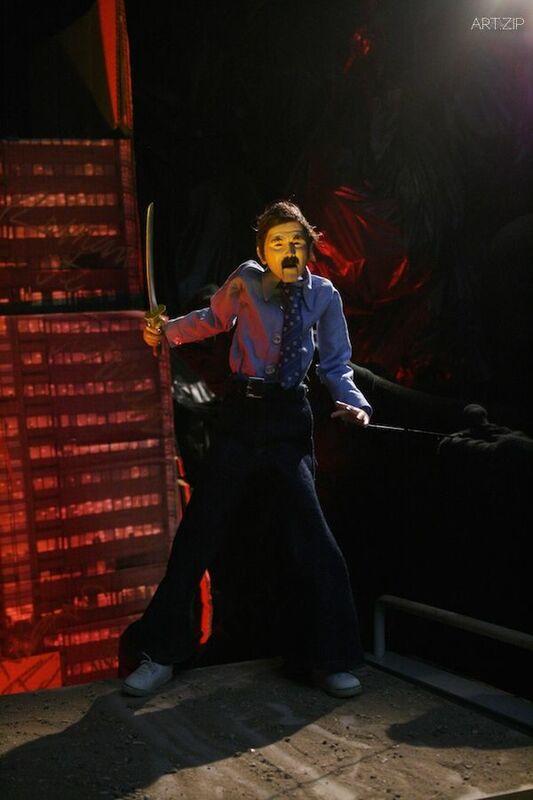 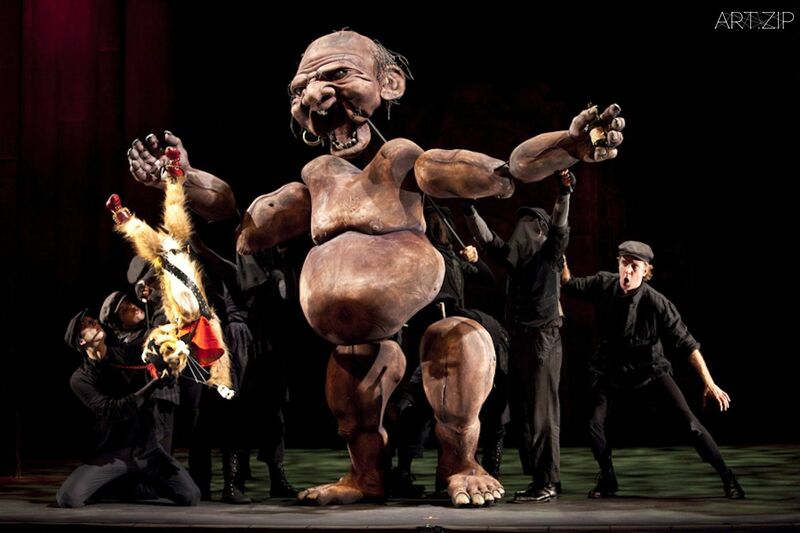 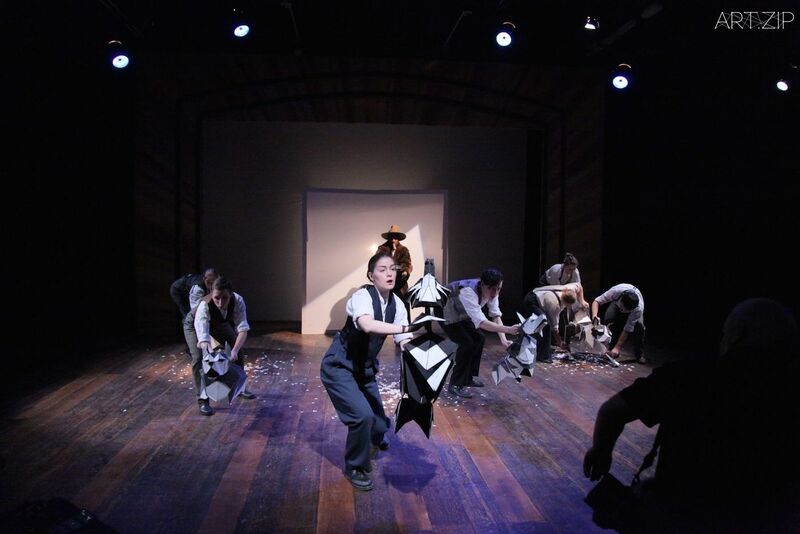 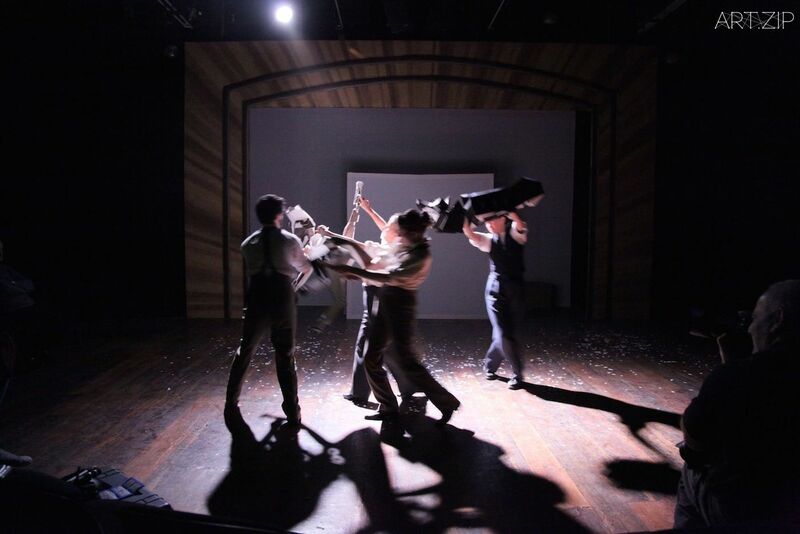 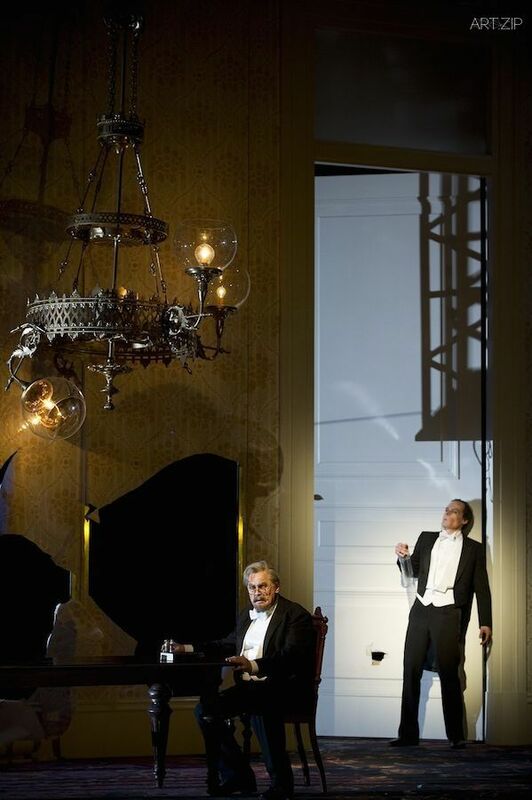 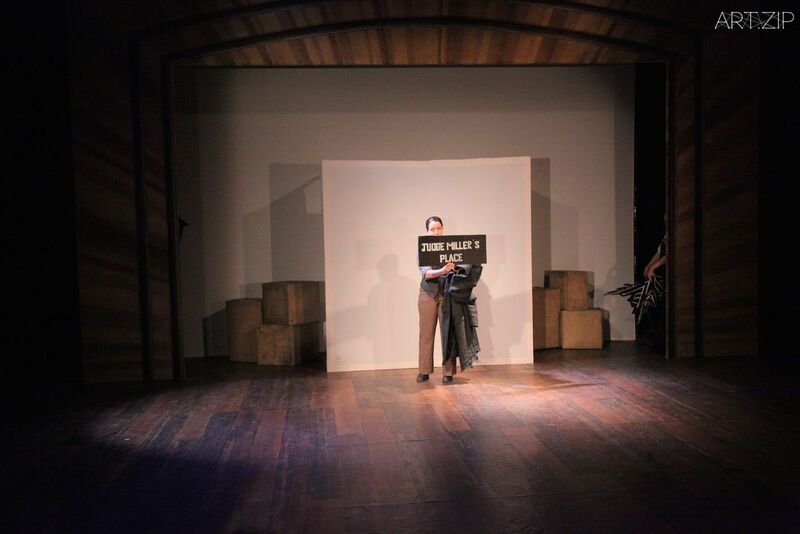 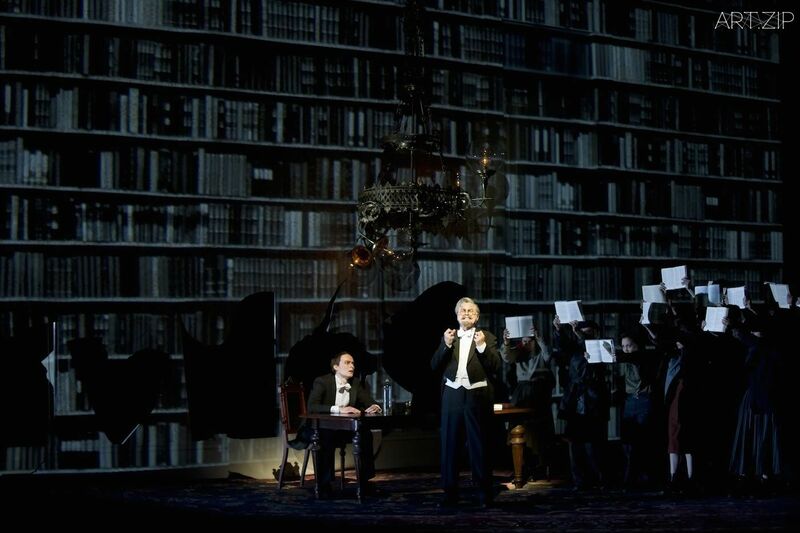 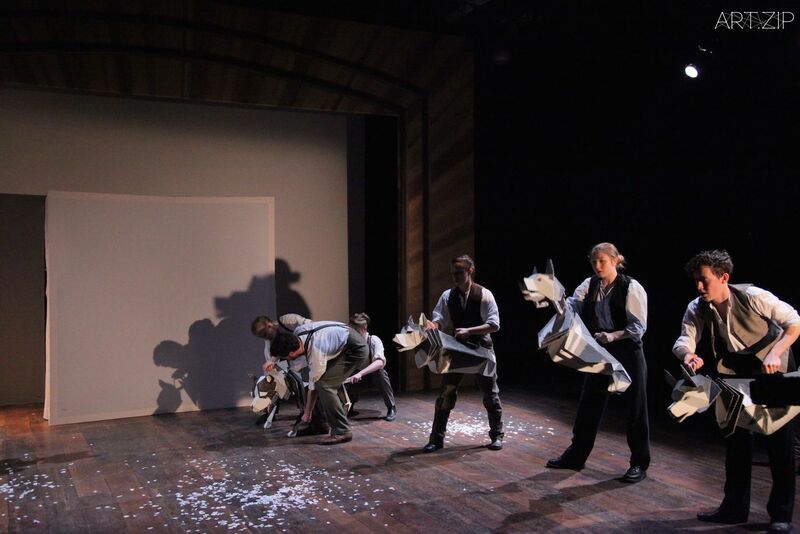 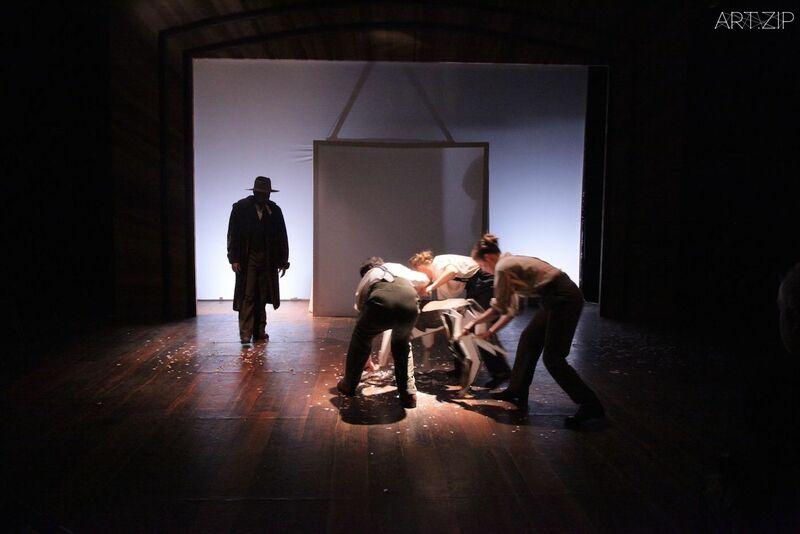 The image onstage is an intriguingly stark one – all there is to the set is a smooth white table with a slouched, wizened cardboard puppet striding about his tiny confines, operated by three black-clad puppeteers. 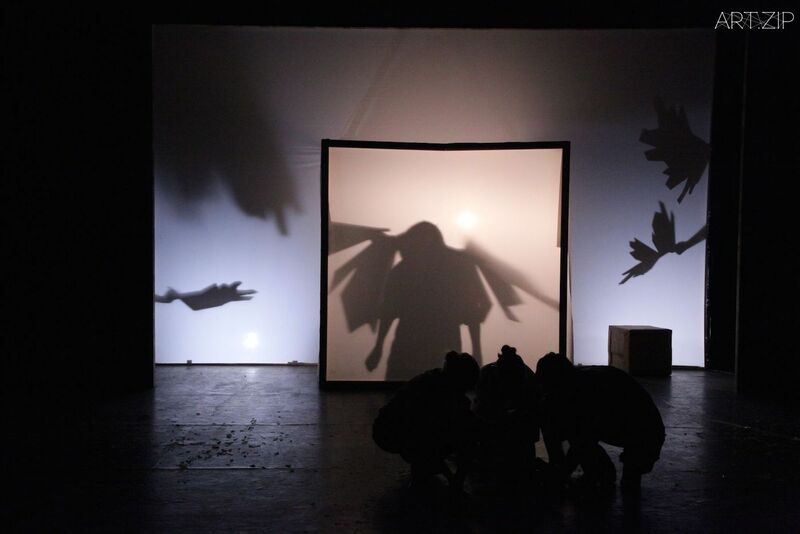 The show seeks to explore the Biblical character of Moses, delving particularly into the idea of his absolute mortality and role as God’s mouthpiece. 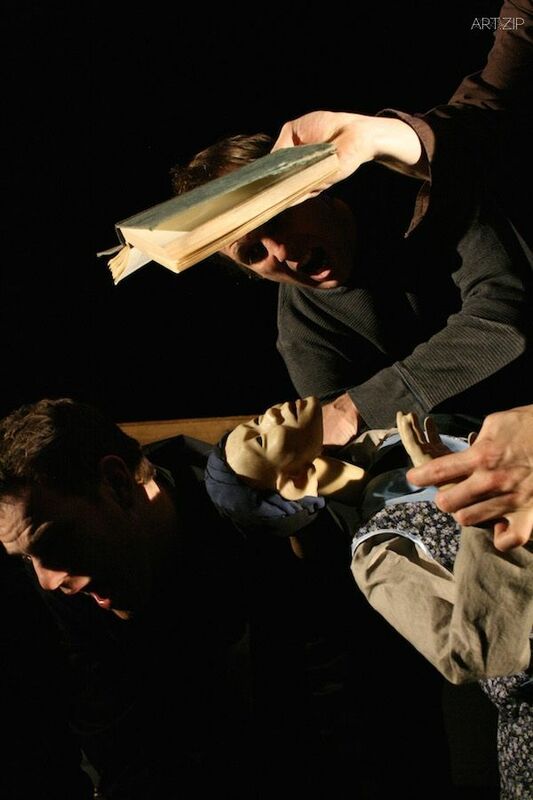 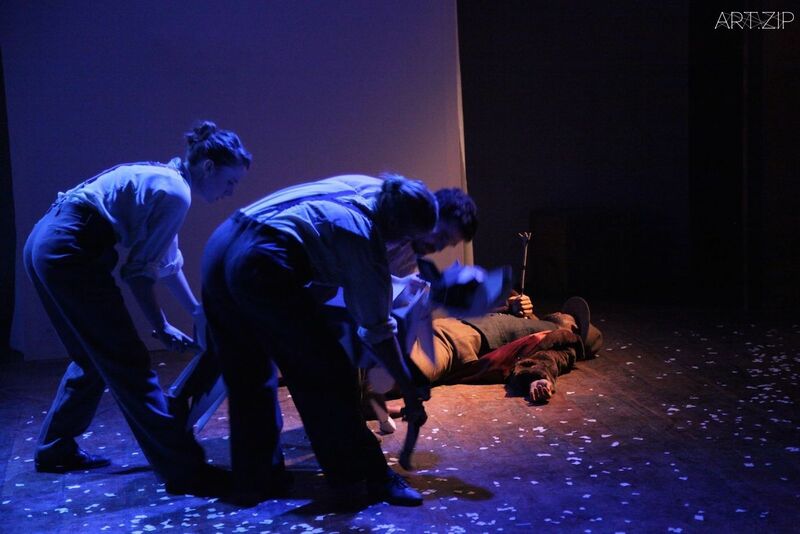 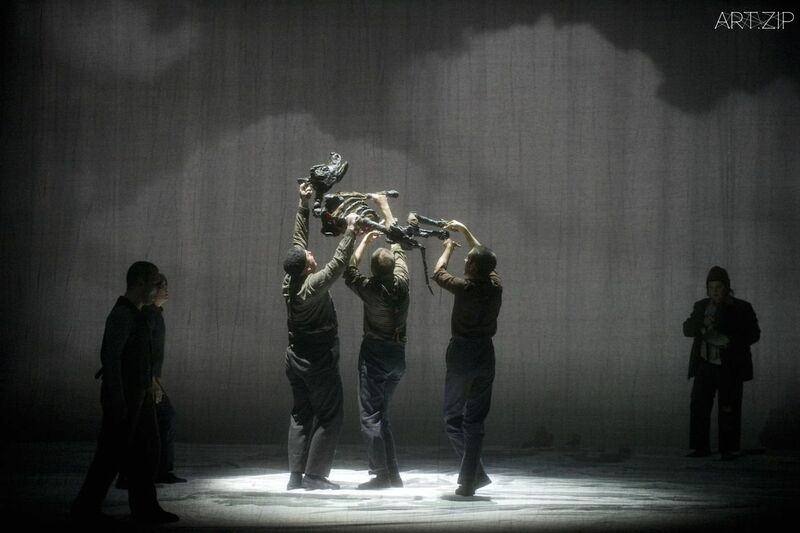 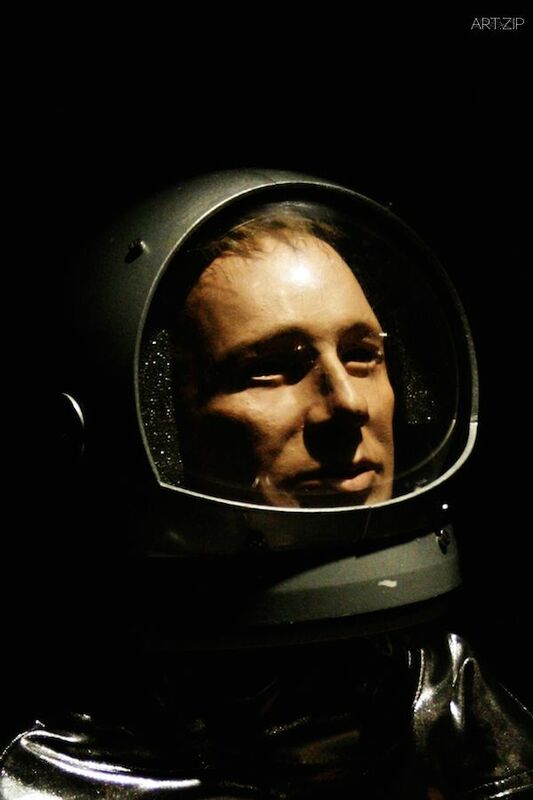 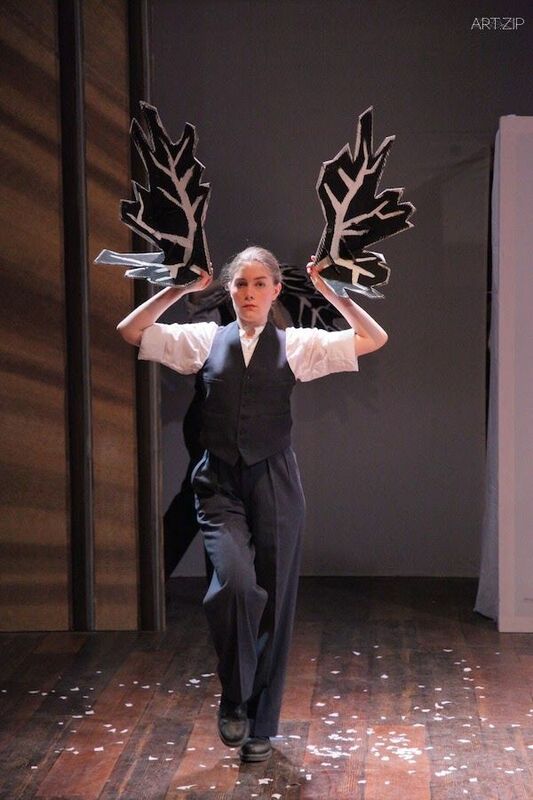 Exploring Moses’ humanity alongside God’s absolute divinity pushed Dawson to draw upon influences such as Beckett and Sartre in order to create a devised piece exploring the existential and almost absurdist nature of God’s relationship with mankind. 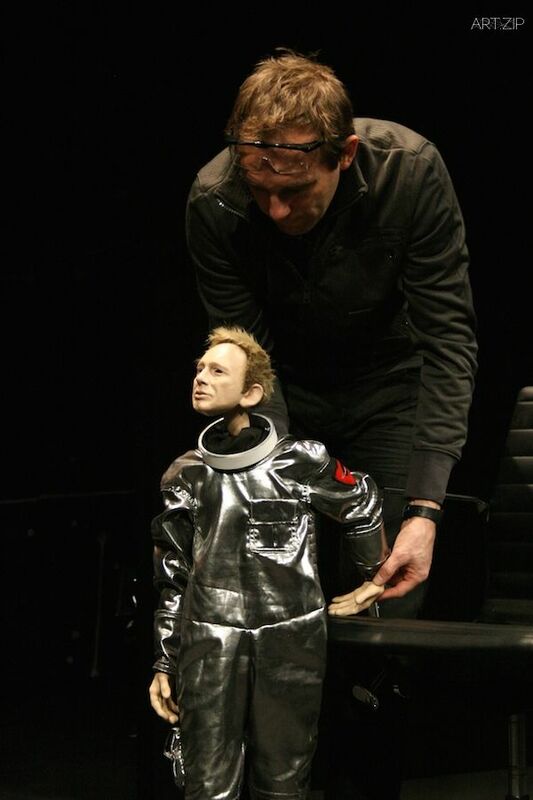 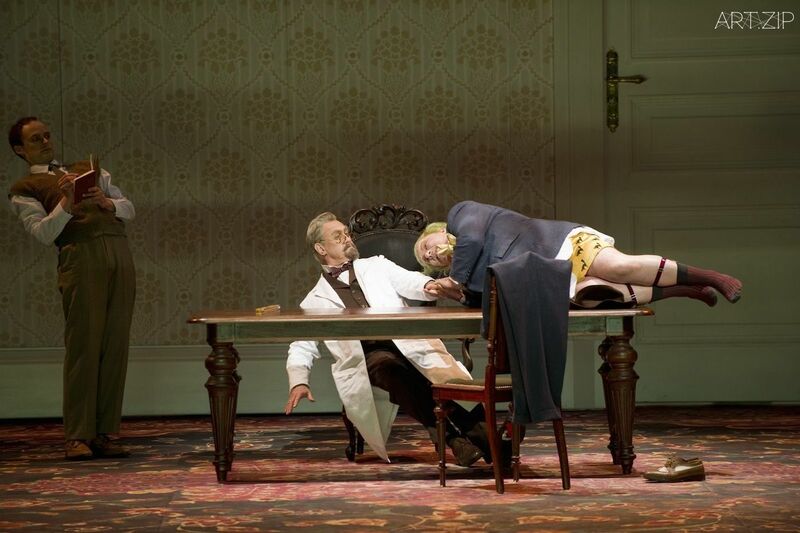 The company has also consistently collaborated with other theatrical pioneers, including Anthony Mighella on the ENO’s Madama Butterfly, and more recently, Simon McBurney’s Complicite on The Master and Margarita and A Dog’s Heart. 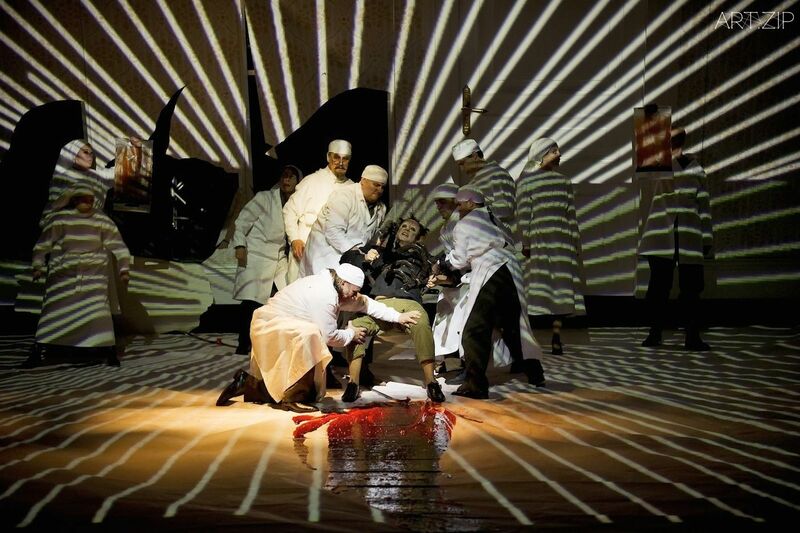 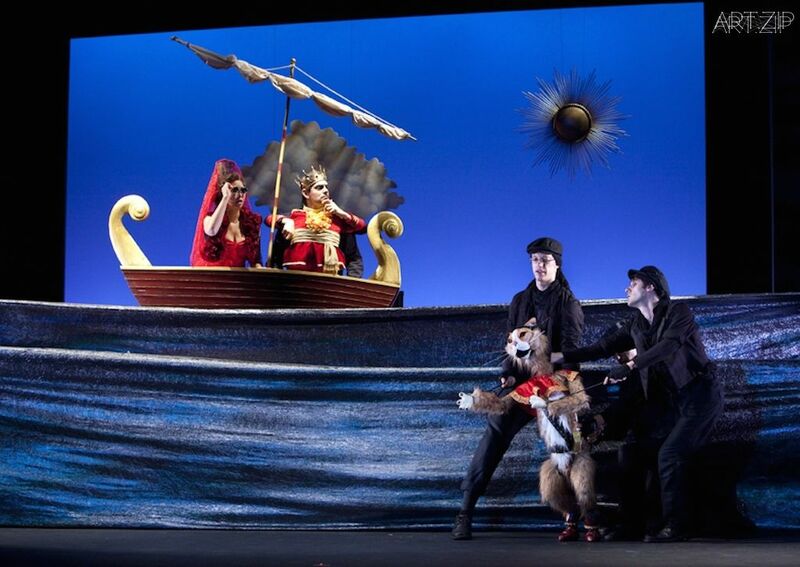 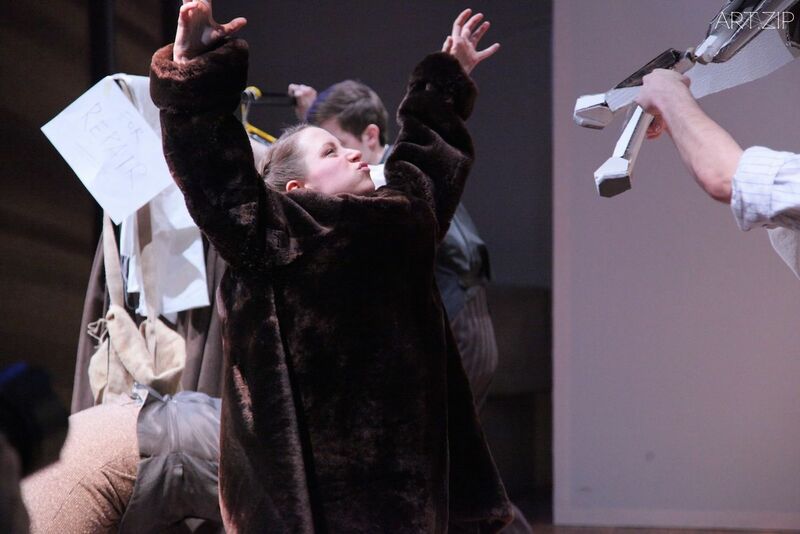 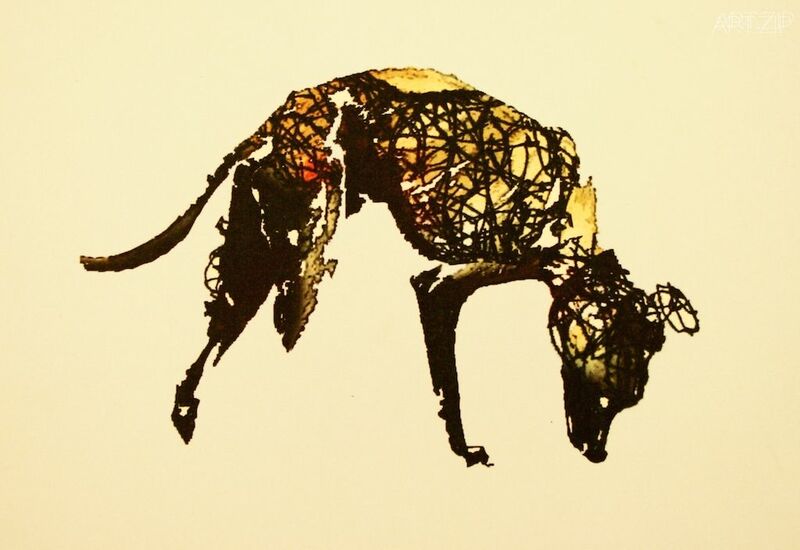 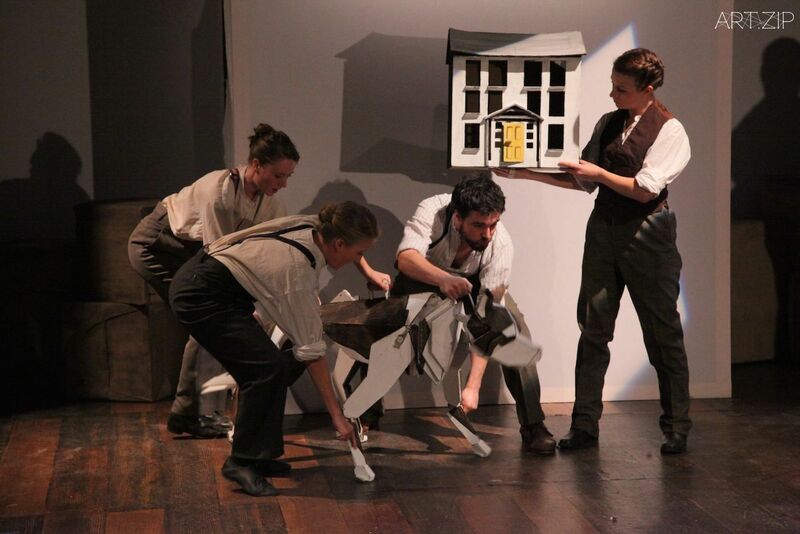 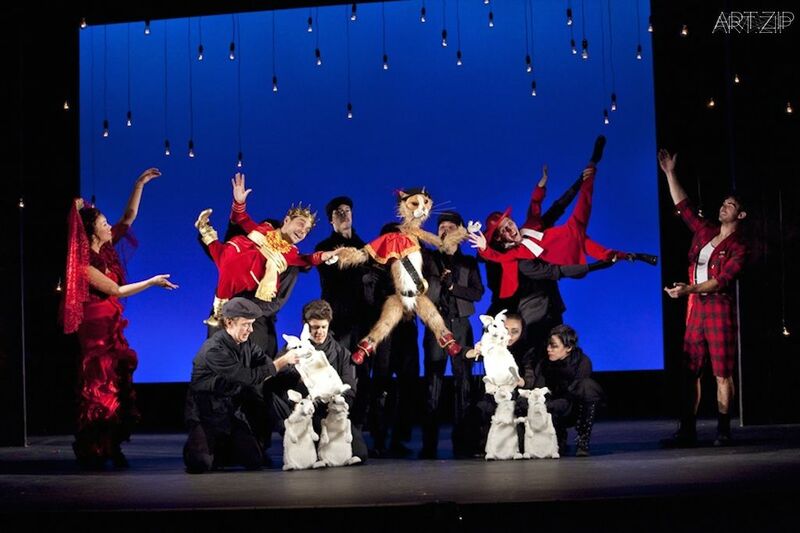 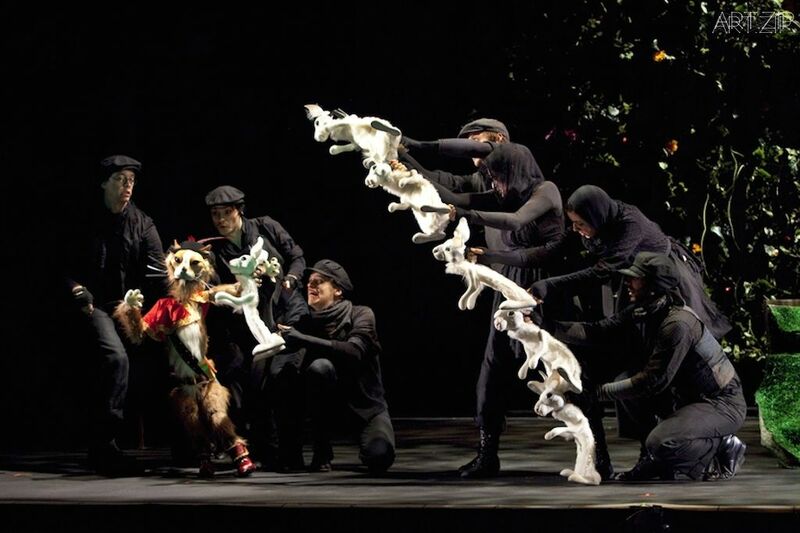 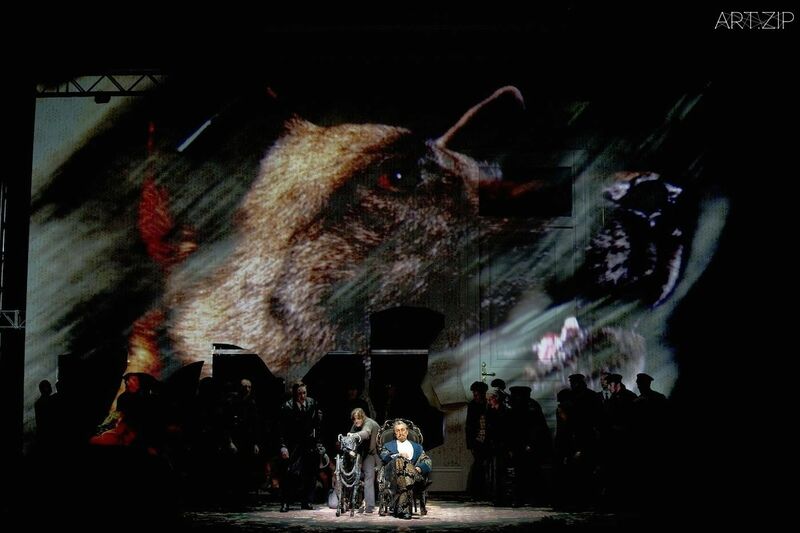 A Dog’s Heart, an original opera by Alexander Raskatov and which was the first opera McBurney directed, was widely heralded as a completely innovative form of opera, the likes of which had not been seen before. 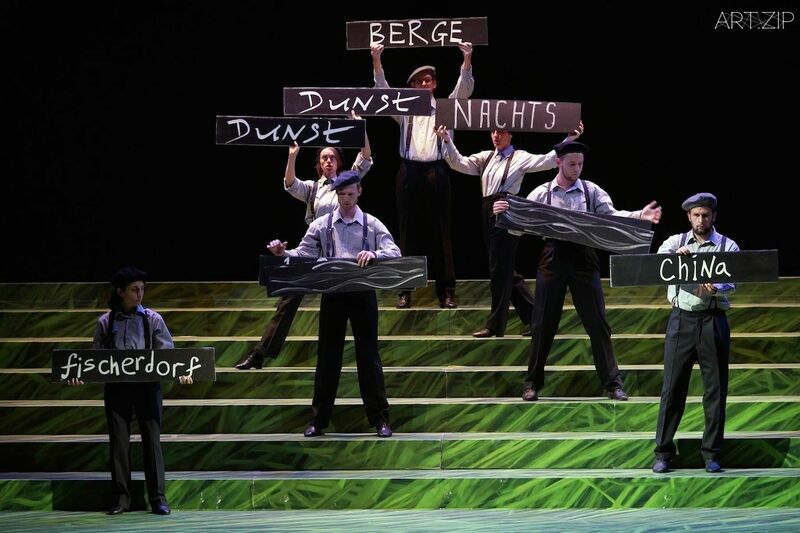 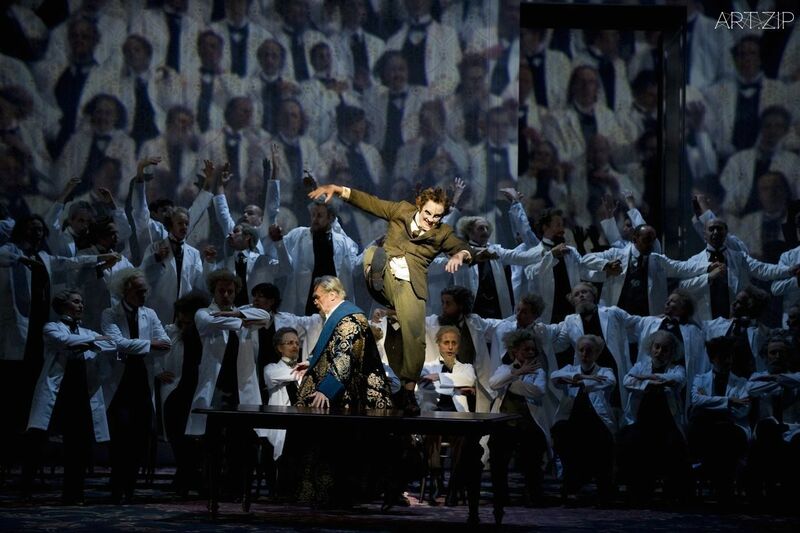 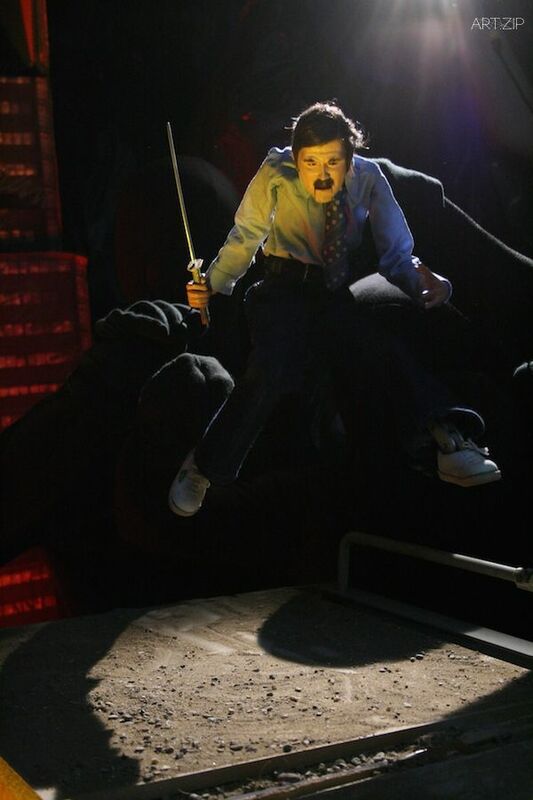 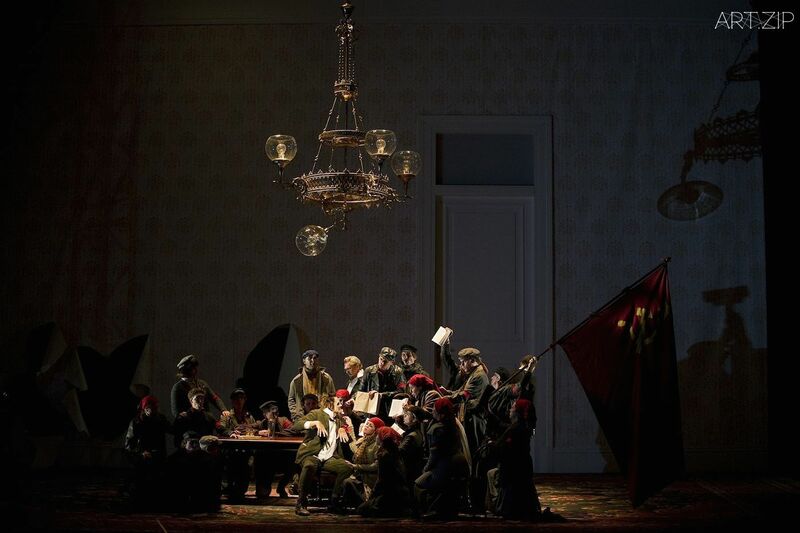 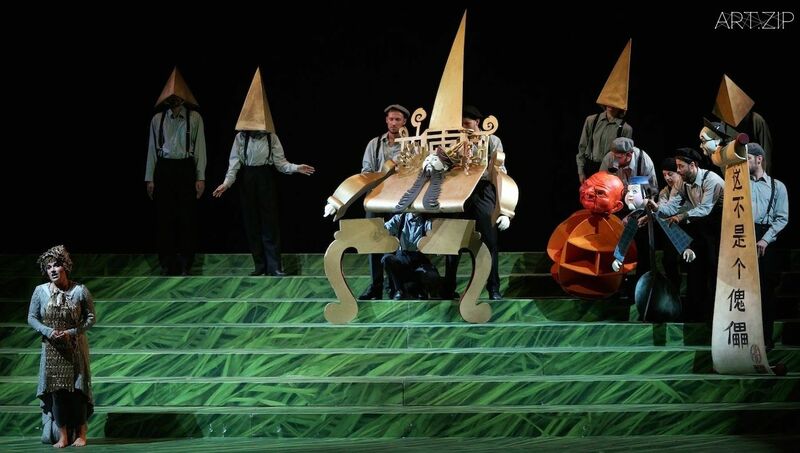 An opera which contained such directorial devices as arias belted out of megaphones and brash, braying electric guitars updated the art form into something less elitist as it was perhaps previously thought to be, and this proved a natural way for Blind Summit to find their way into the production. 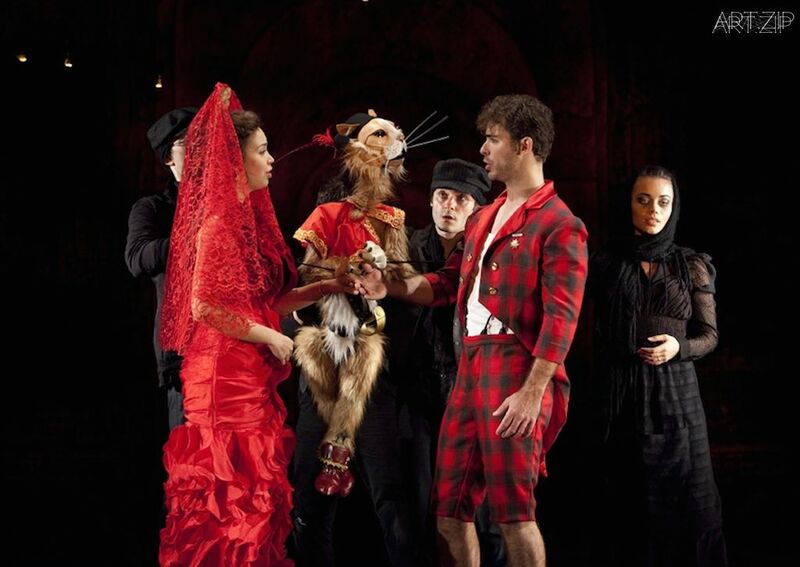 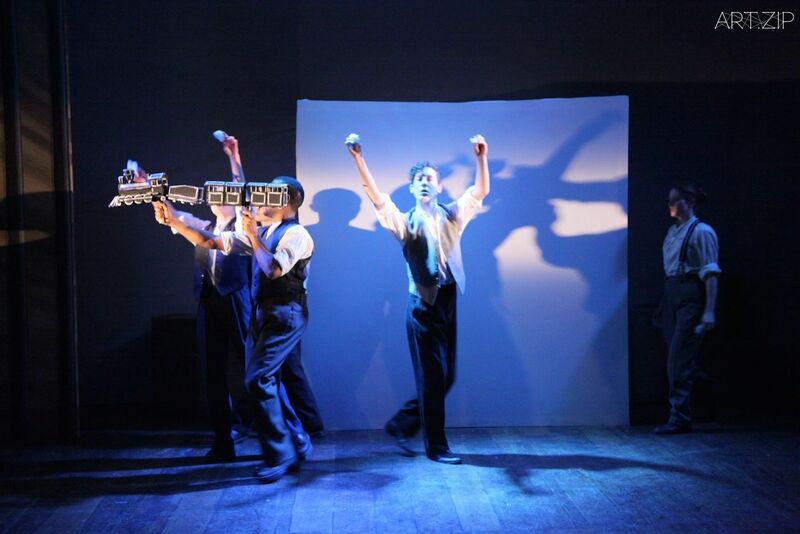 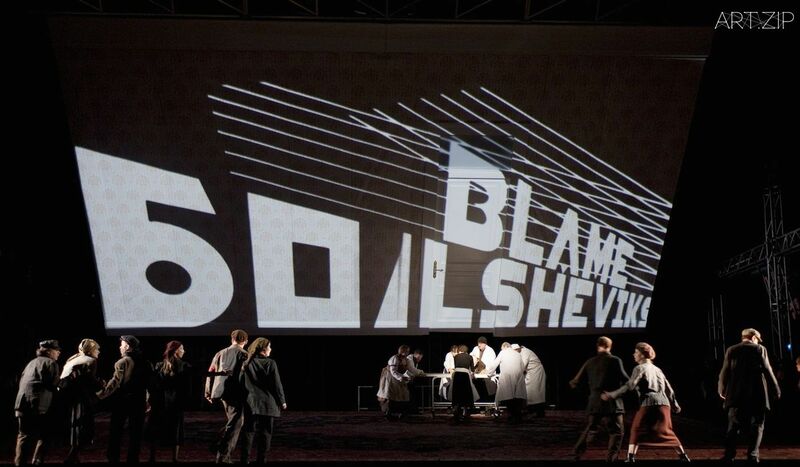 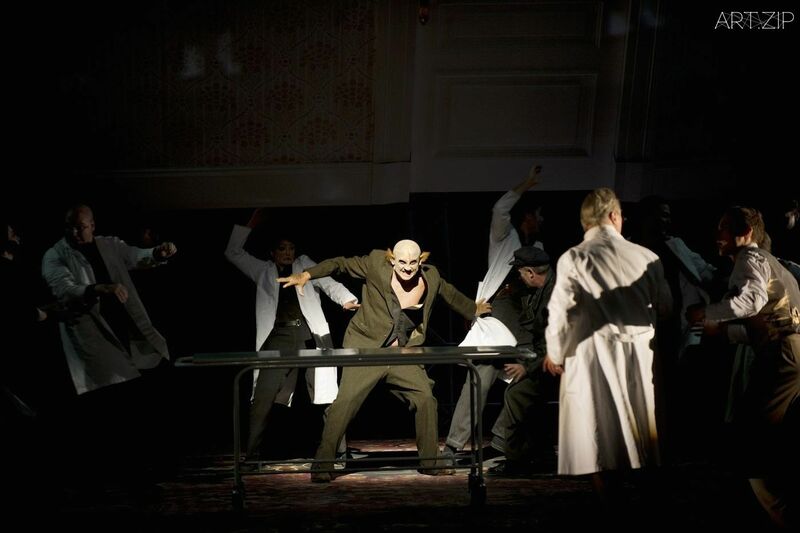 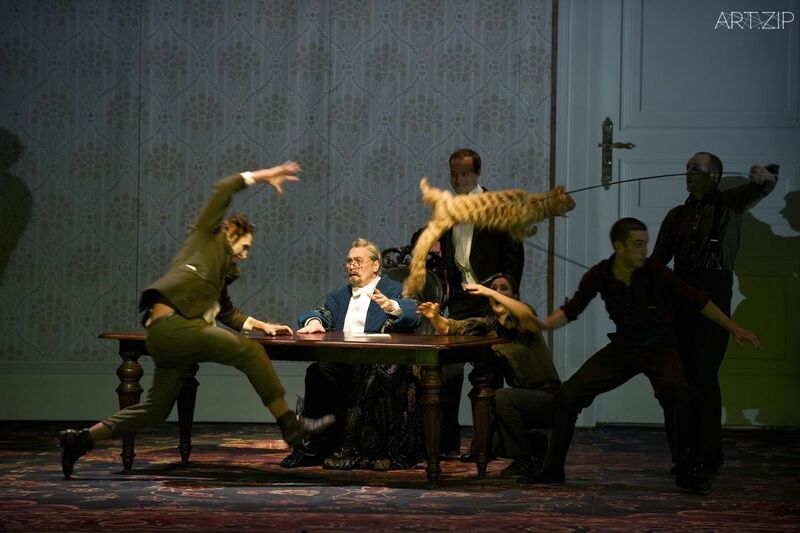 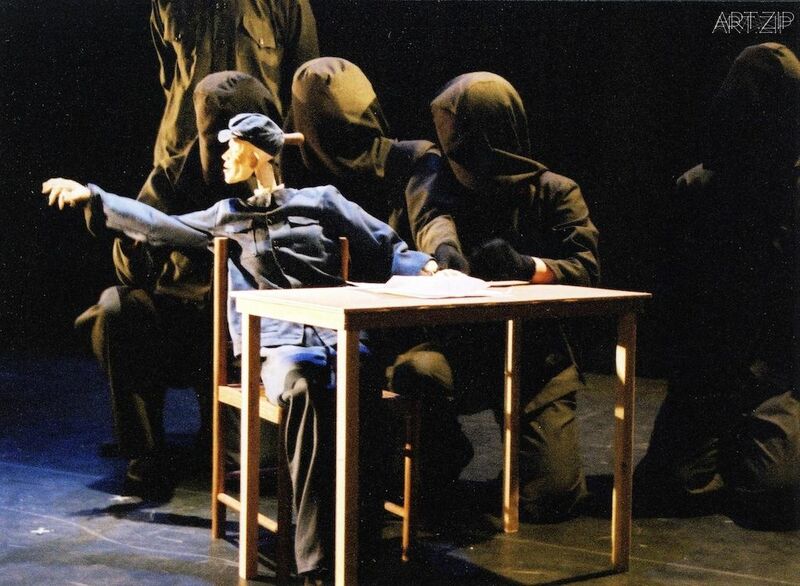 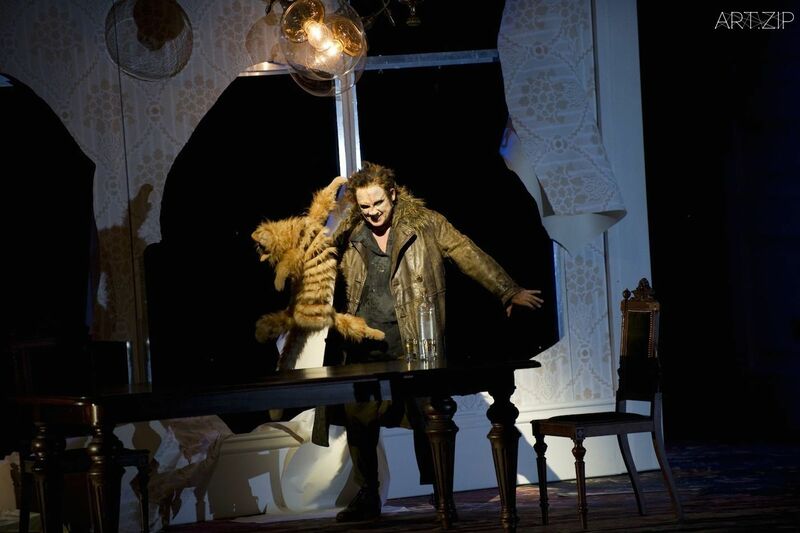 Bulgakov’s story of a dog which is transformed into a man in a horrific, Frankenstein-type story pushed McBurney to seek out the company in order to create the most fundamental part of the piece. 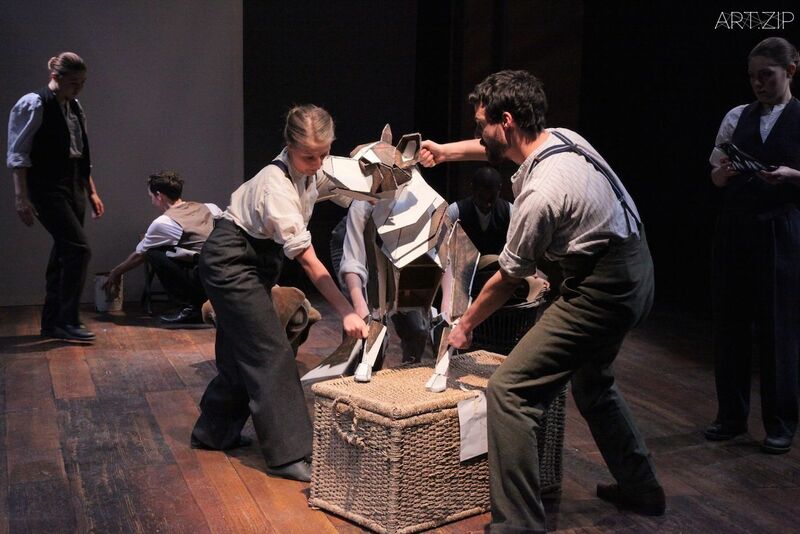 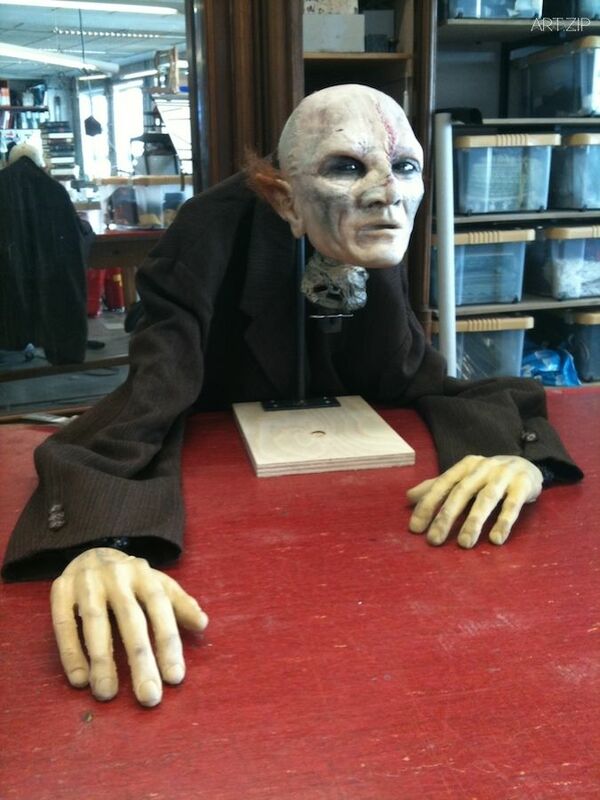 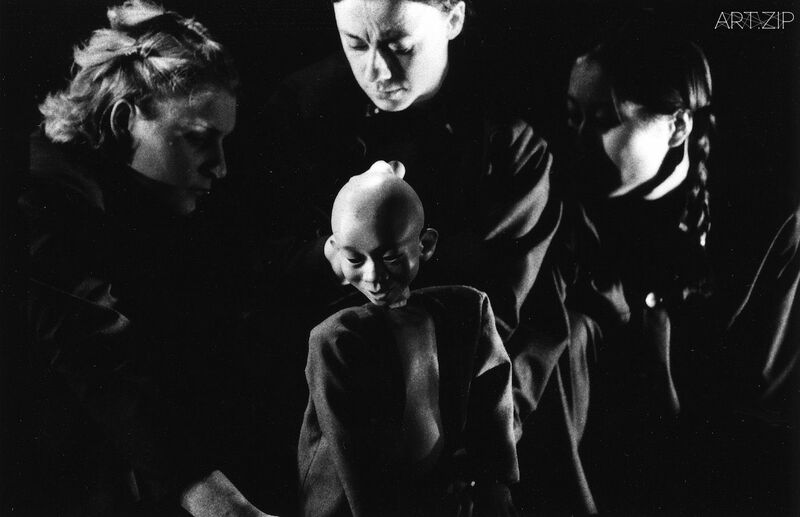 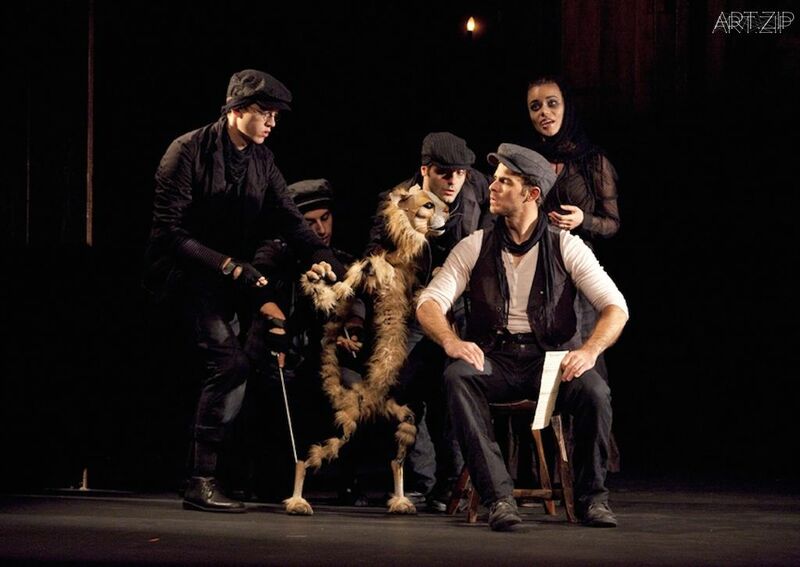 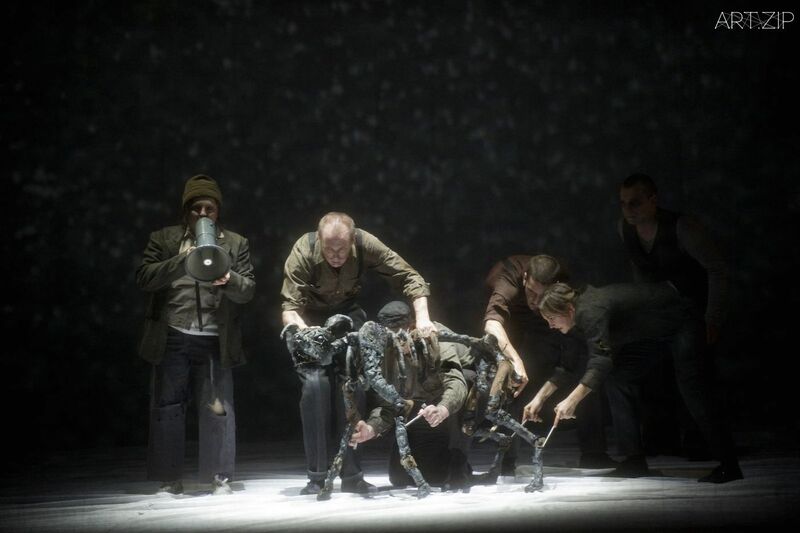 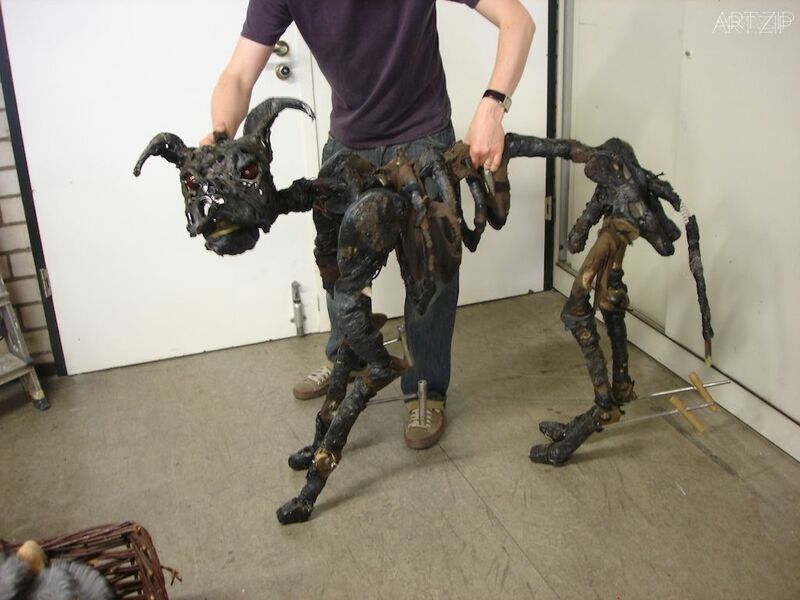 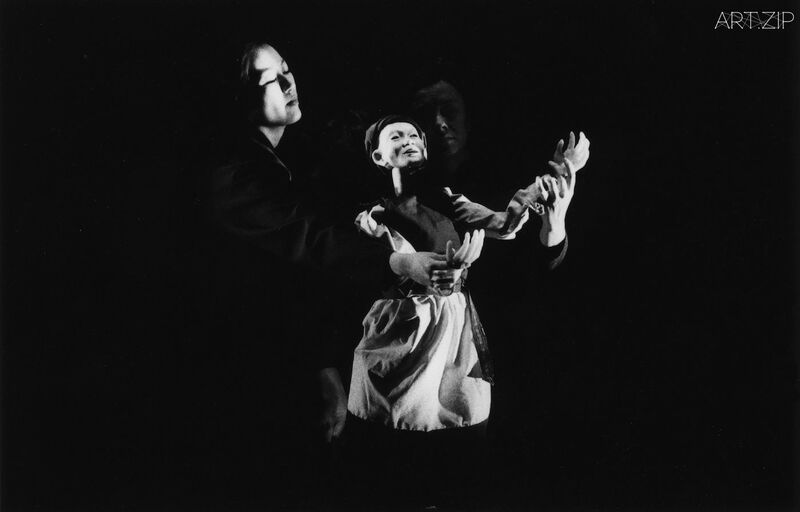 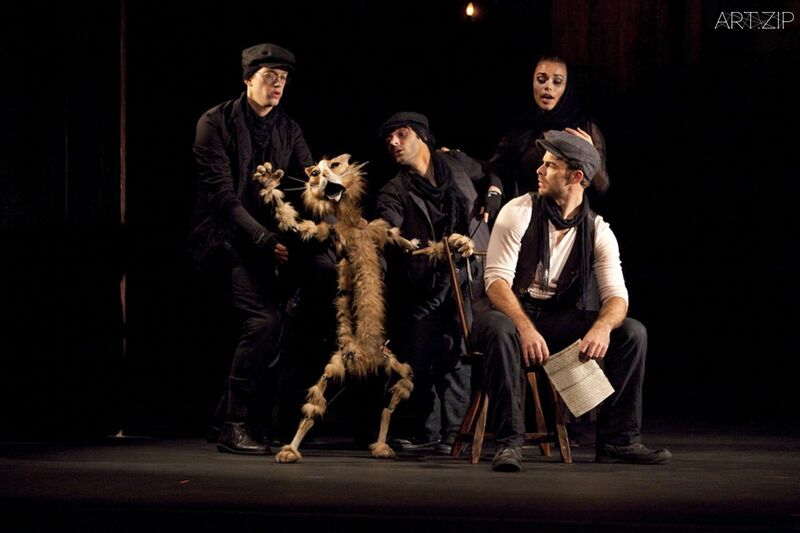 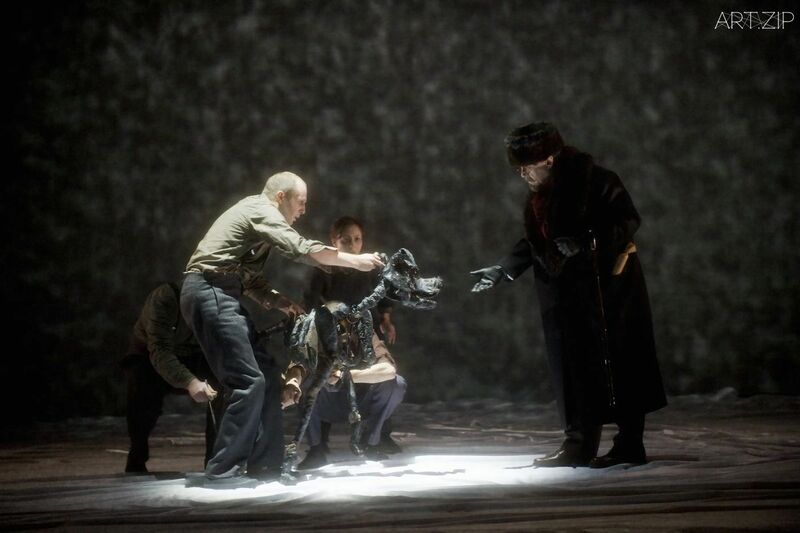 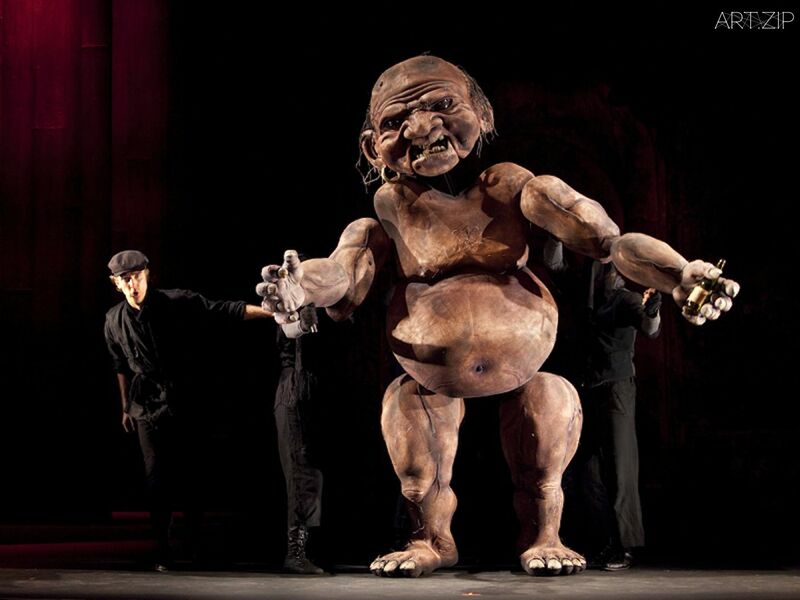 Blind Summit’s dog puppet, a charcoal coloured, skeletal monster which limped across the stage accompanied by inhuman shrieks and growls interspersed with Peter Hoare’s stunning operatic voice, was the pivot of the production and an image which remained with the audience long after the dog transformed into a lecherous man at the end of the first act. 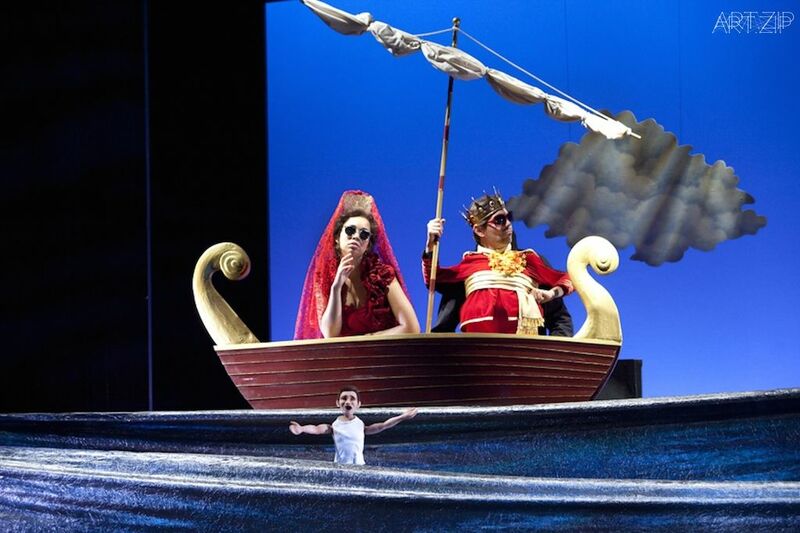 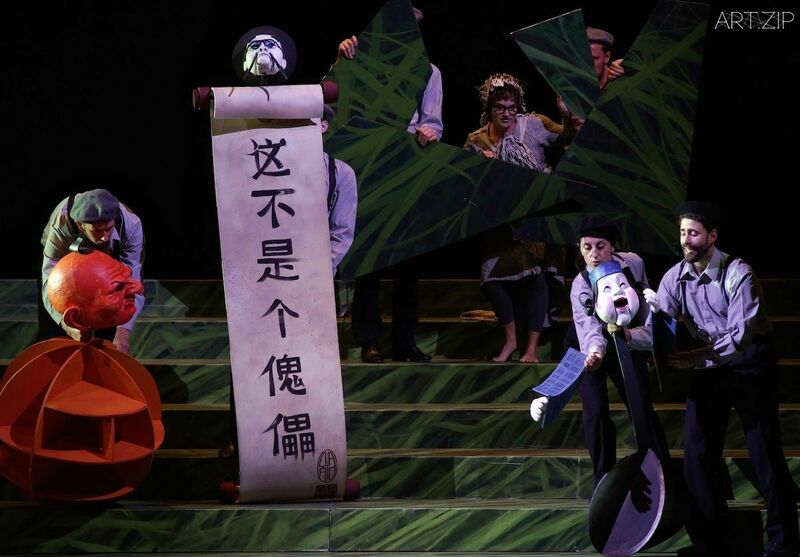 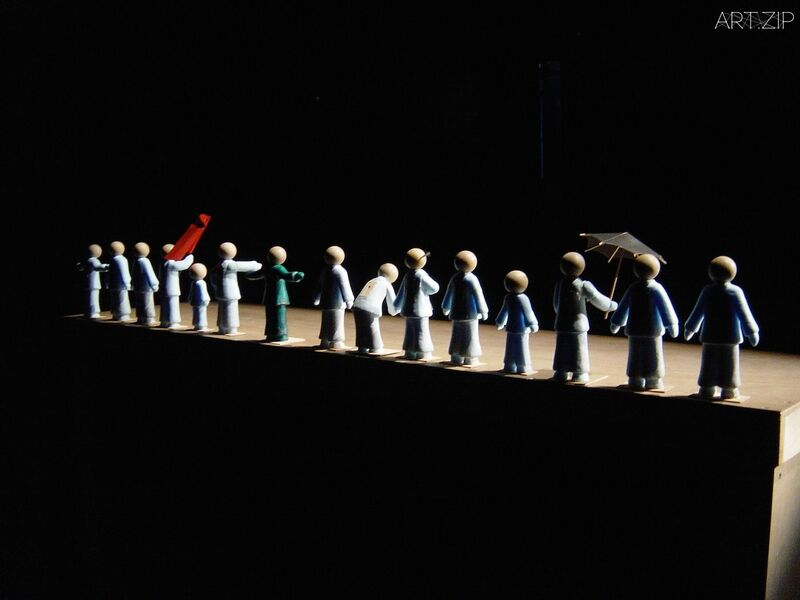 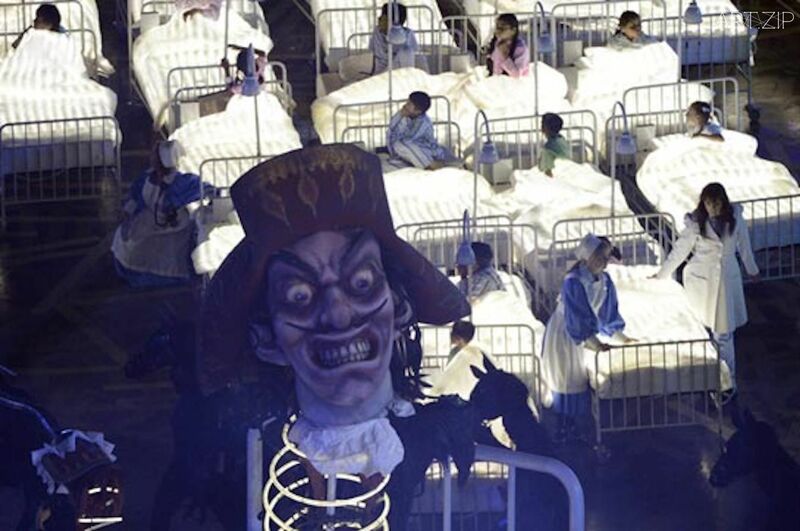 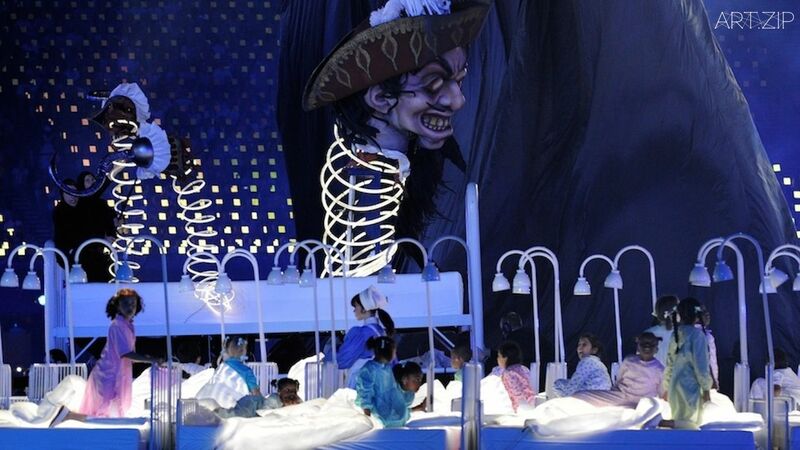 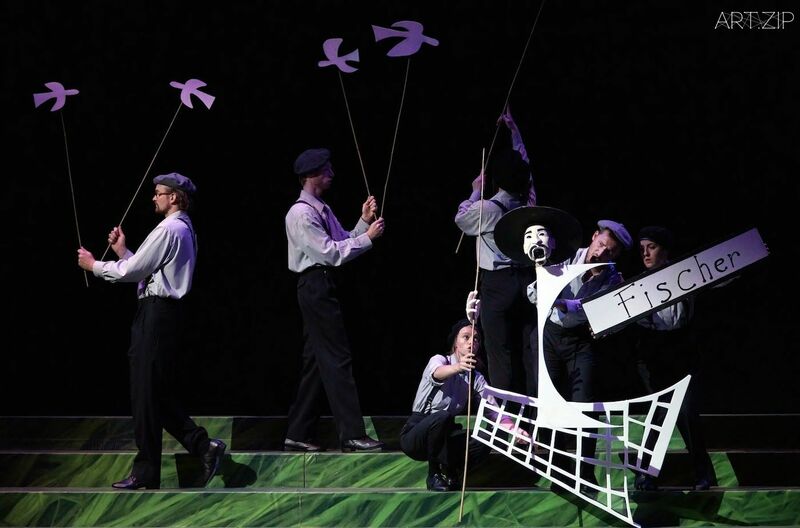 One of their most exciting productions seen by Chinese audiences was the company’s production of Mozart’s seminal opera, The Magic Flute, which premiered in 2013 at the world-renowned Bregenz Festival, directed by David Pountney and containing twelve Blind Summit puppeteers. 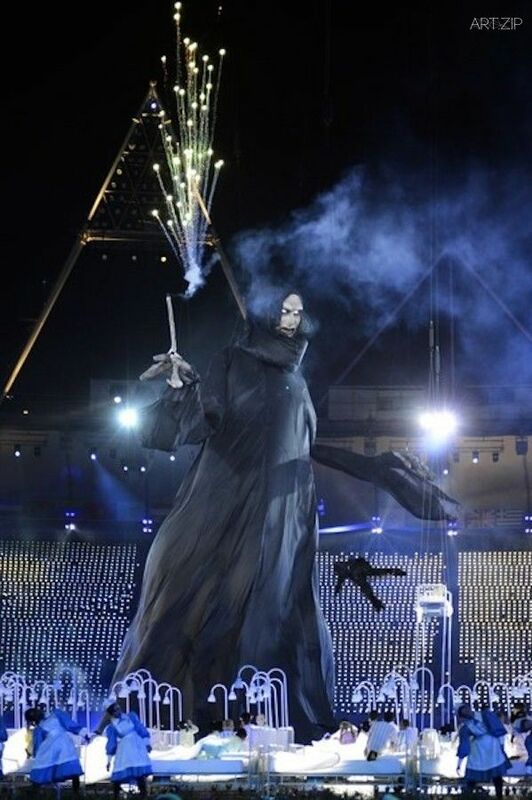 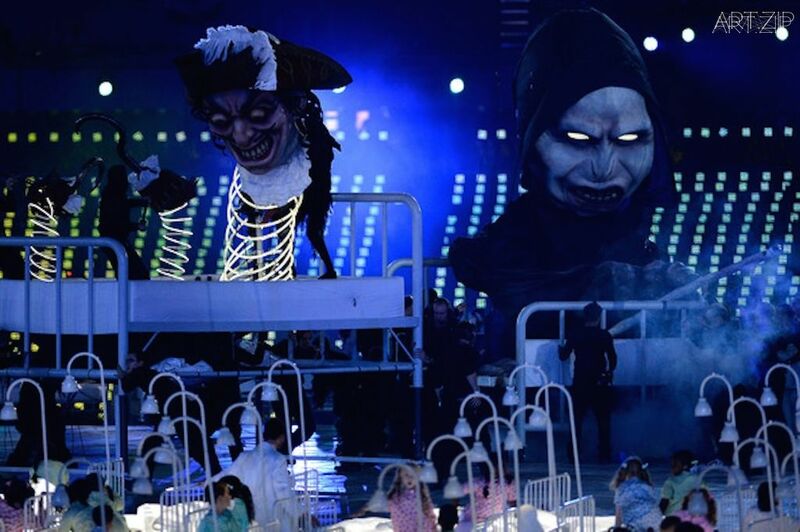 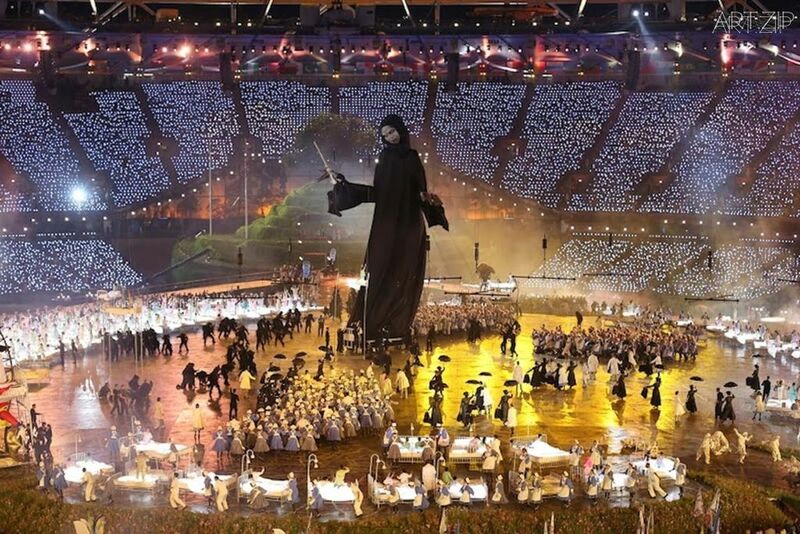 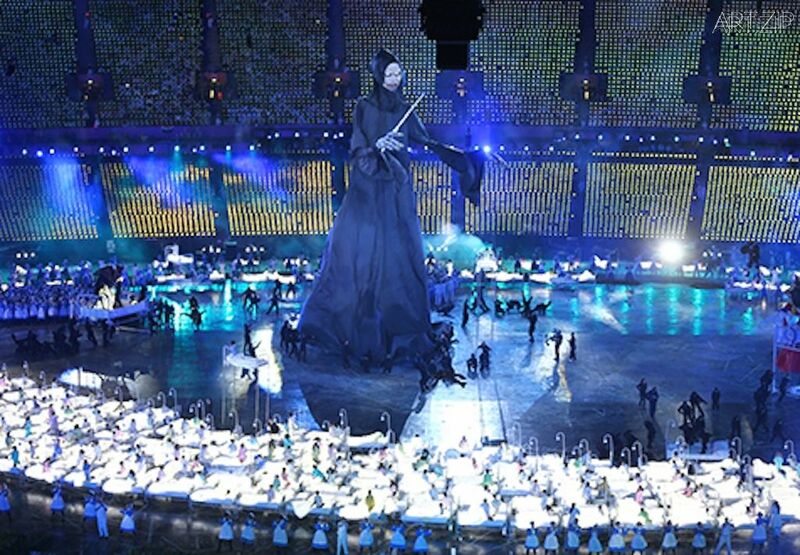 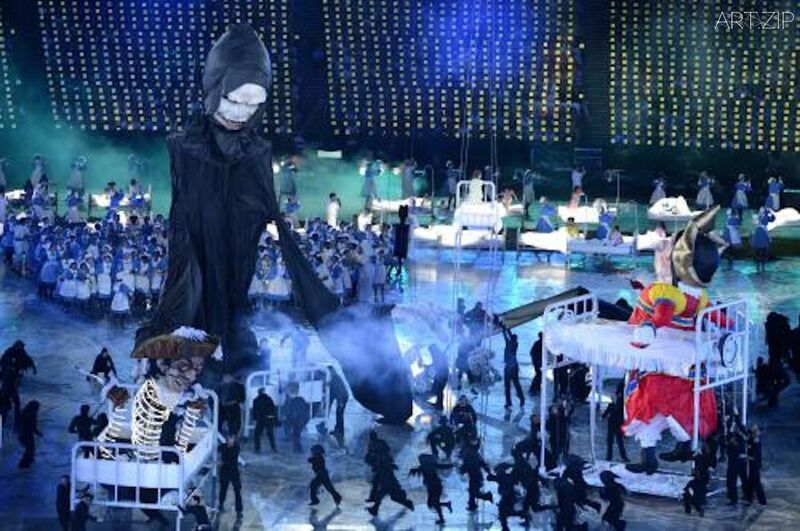 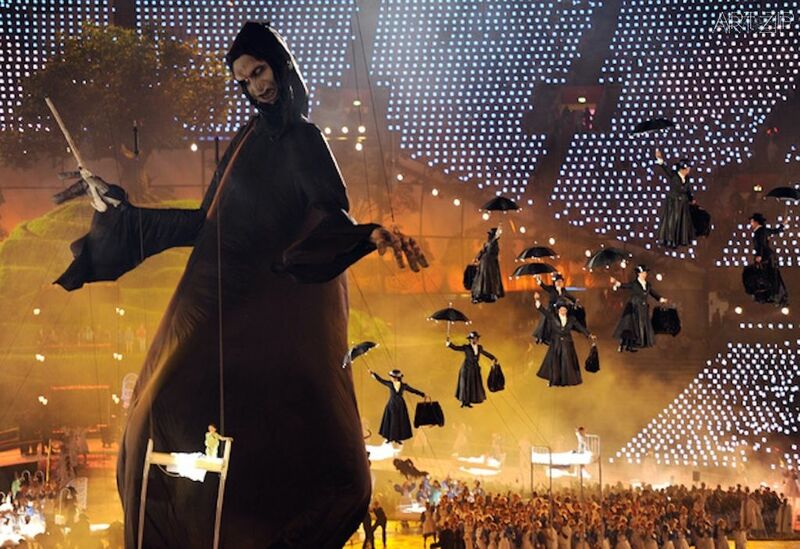 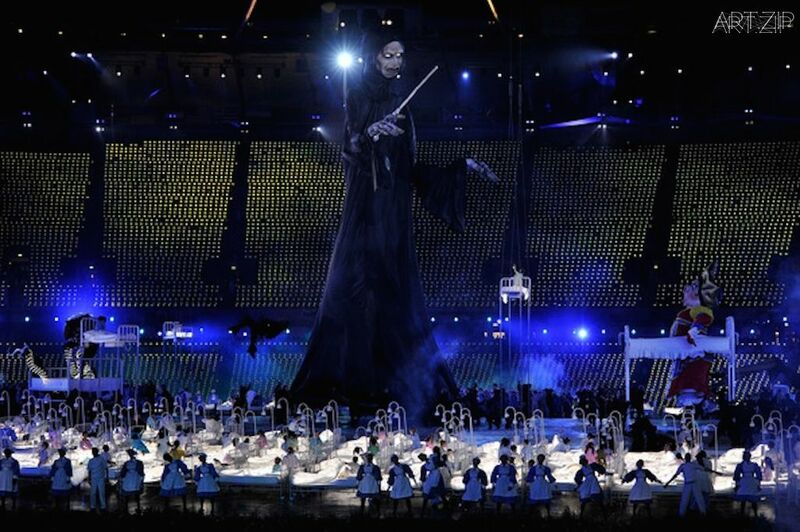 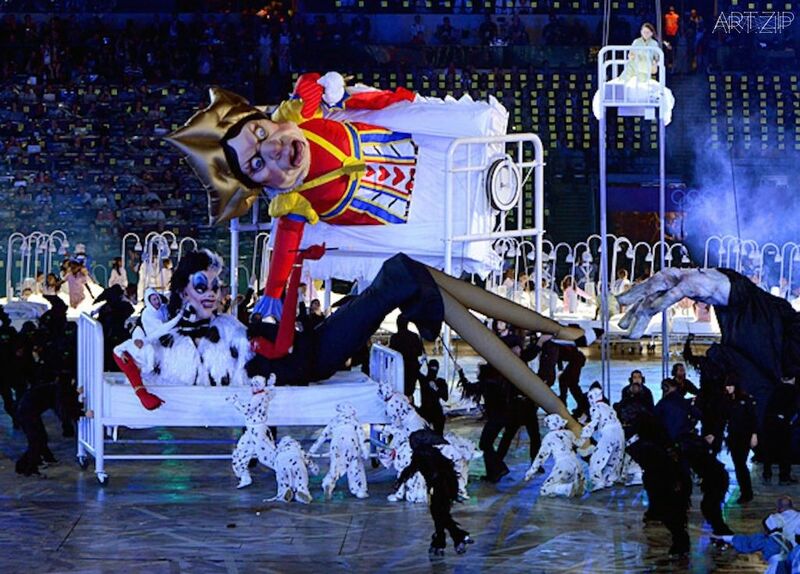 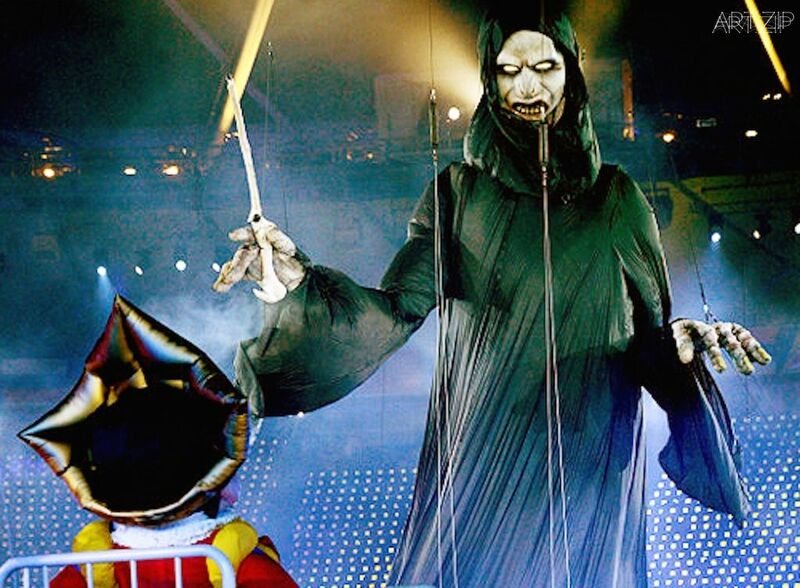 A performance that can only be described as a huge spectacle was produced on the world’s largest floating stage on Lake Constance, and contained huge bird puppets operated by three puppeteers and fire breathing dragons. 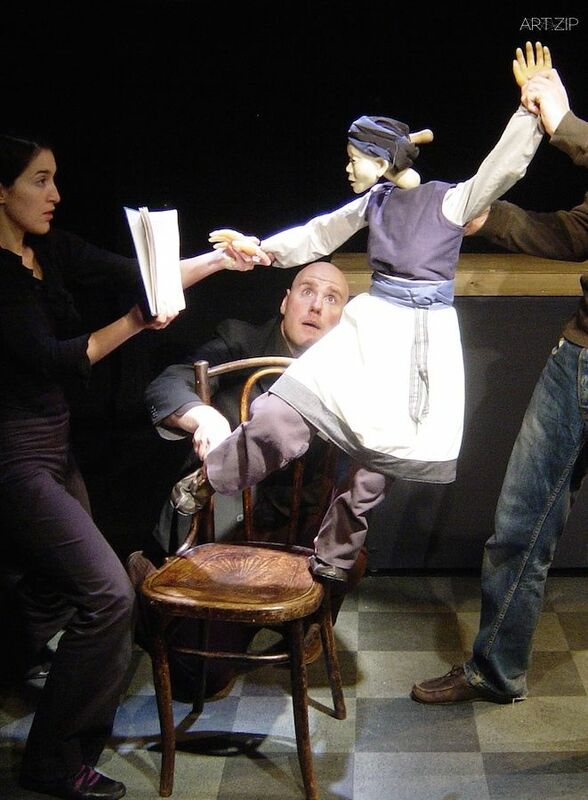 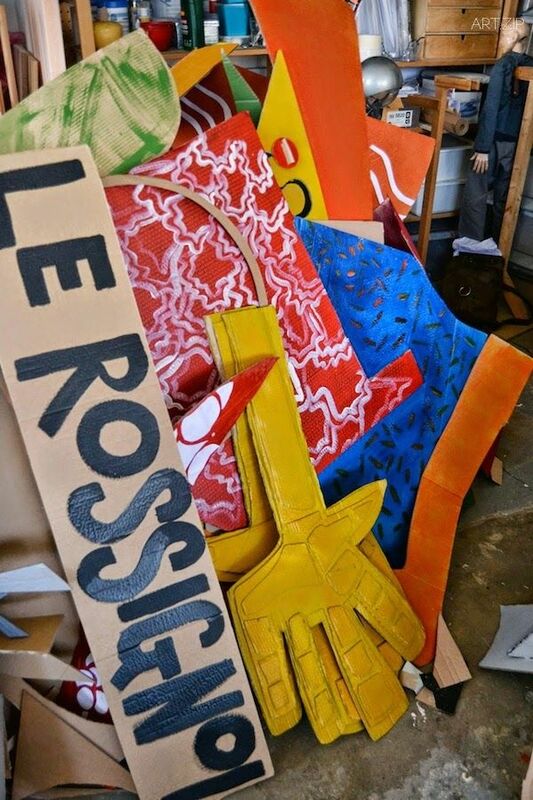 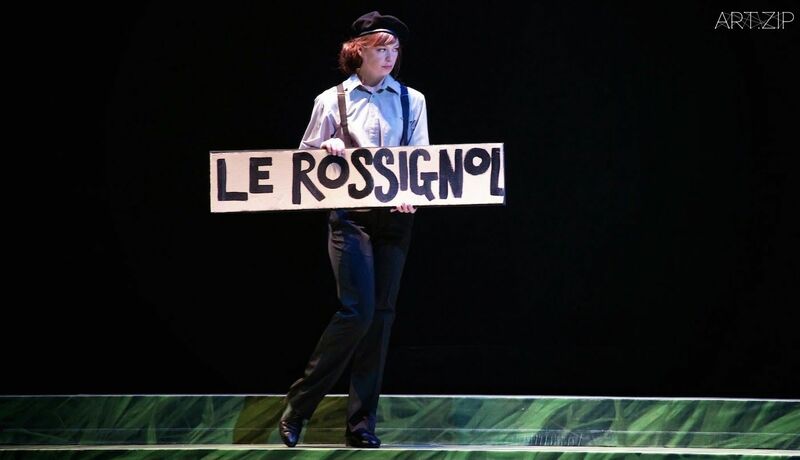 Taking on an ‘Alice in Wonderland’ type tone, the puppets used were revived in 2014 in a production of Le Rossignol, directed by Down. 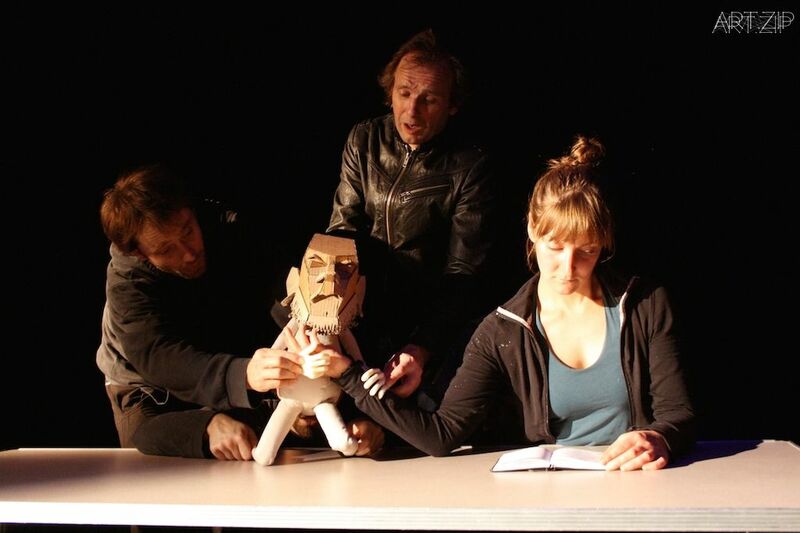 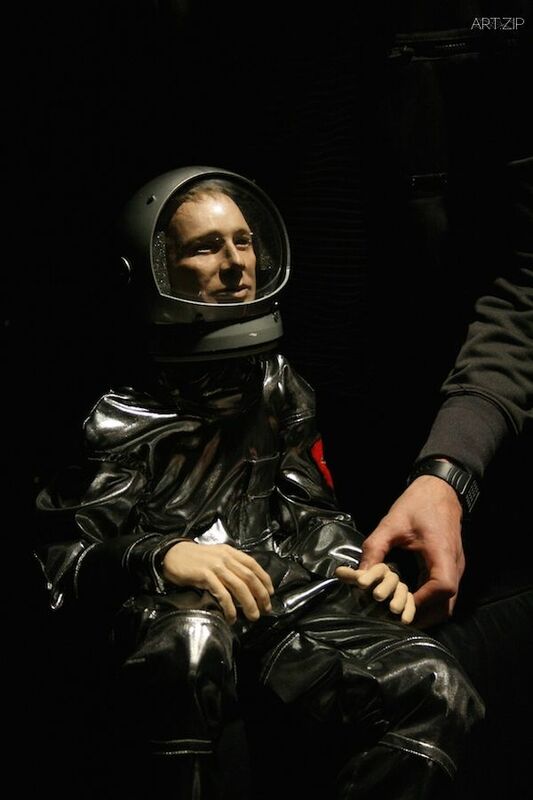 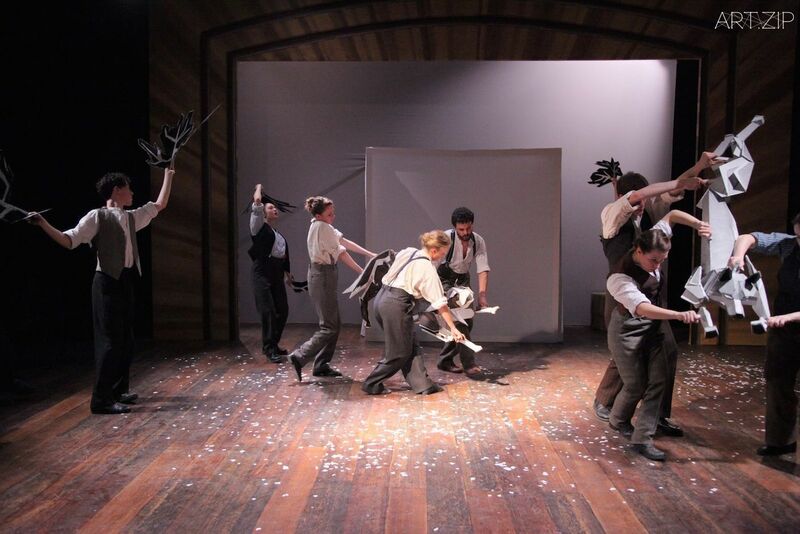 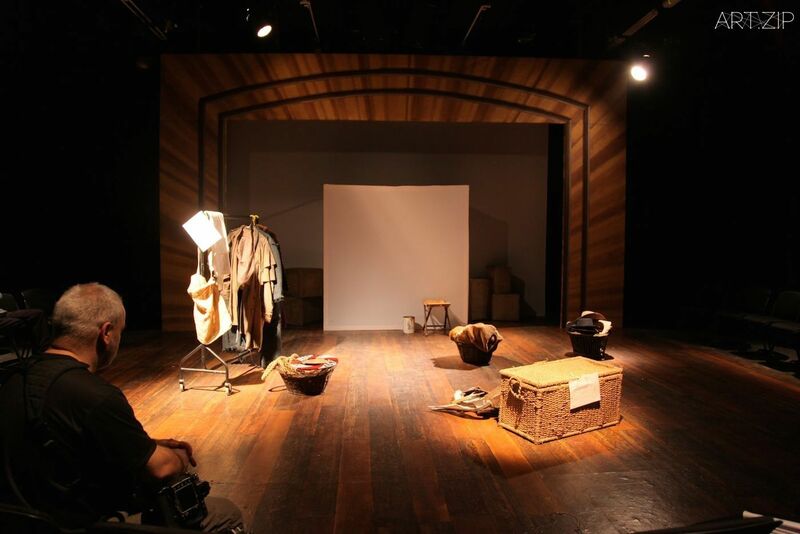 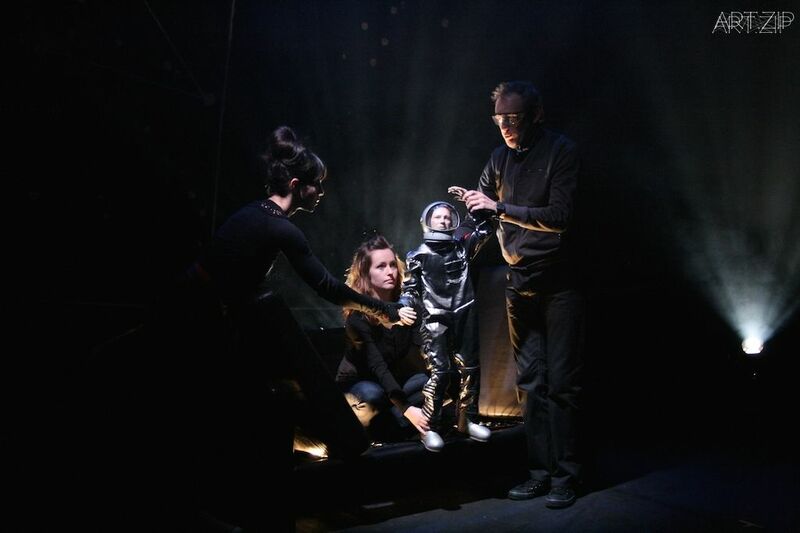 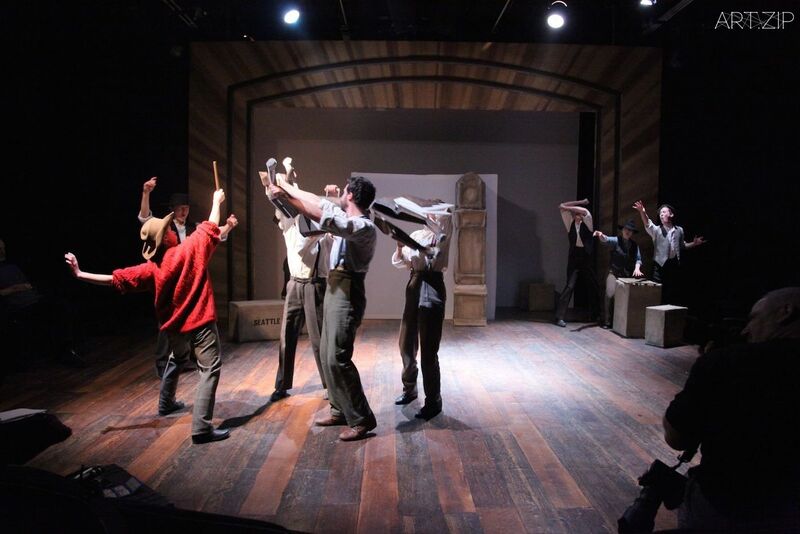 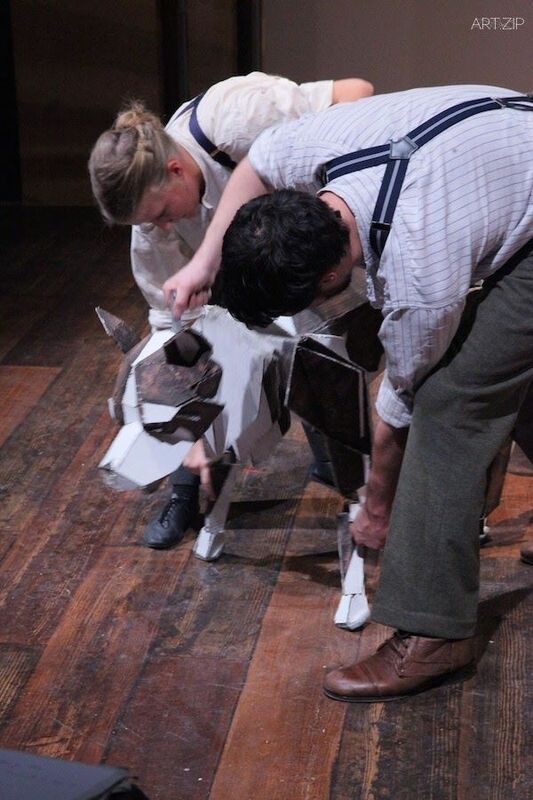 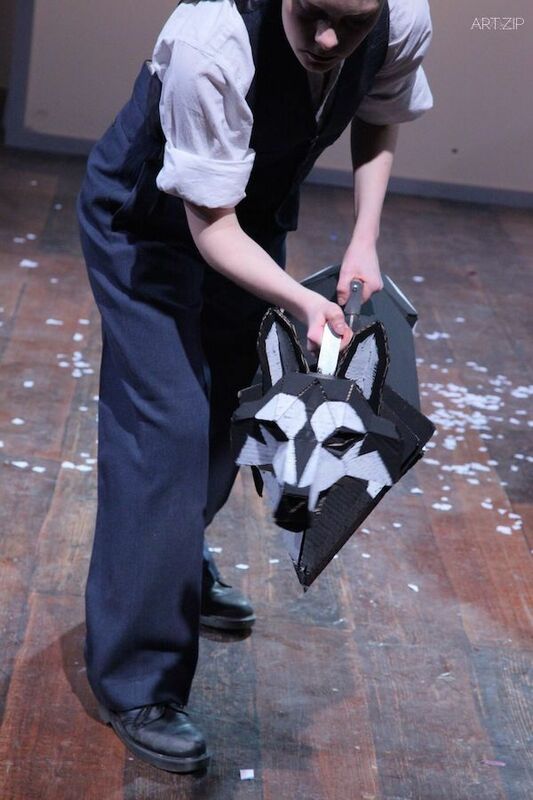 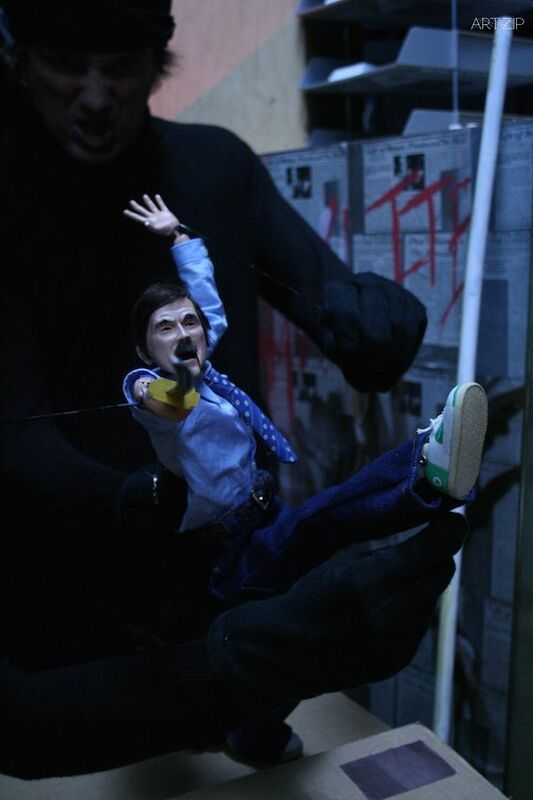 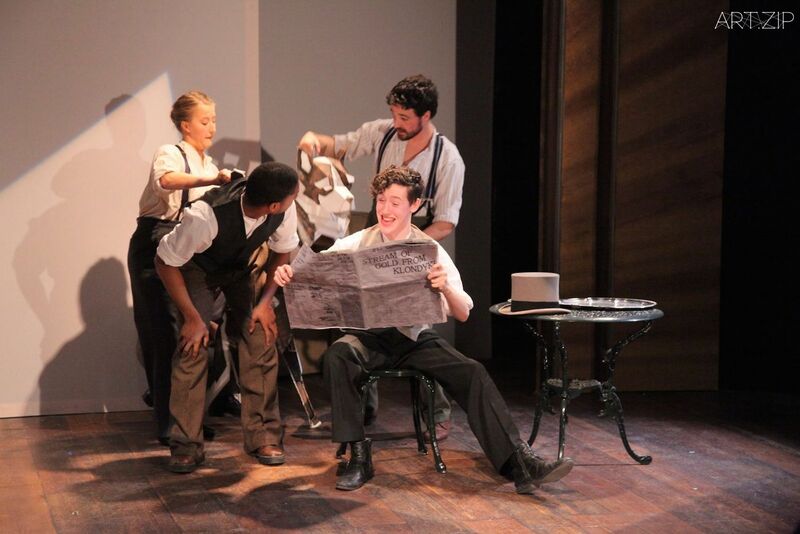 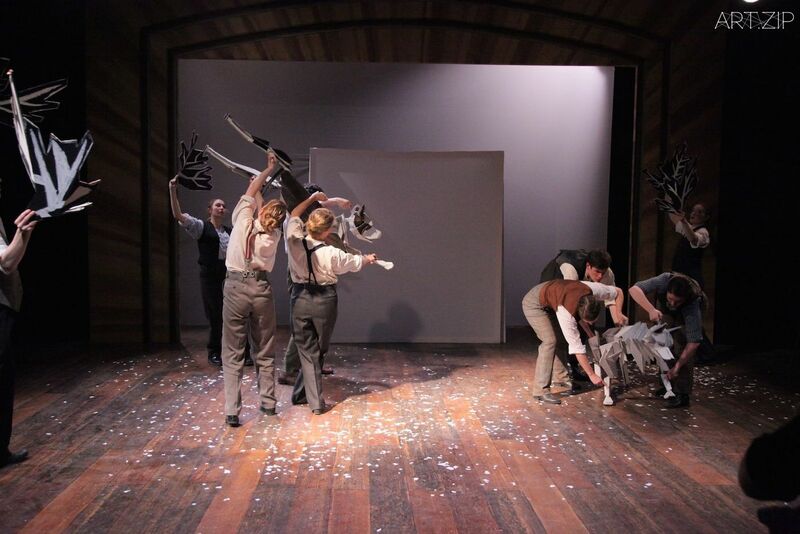 As a company, it appears Blind Summit have consistently and without fail looked to create stimulating theatre above all else, with their puppets acting as more of a conduit for this aim rather than anything more extraneous.